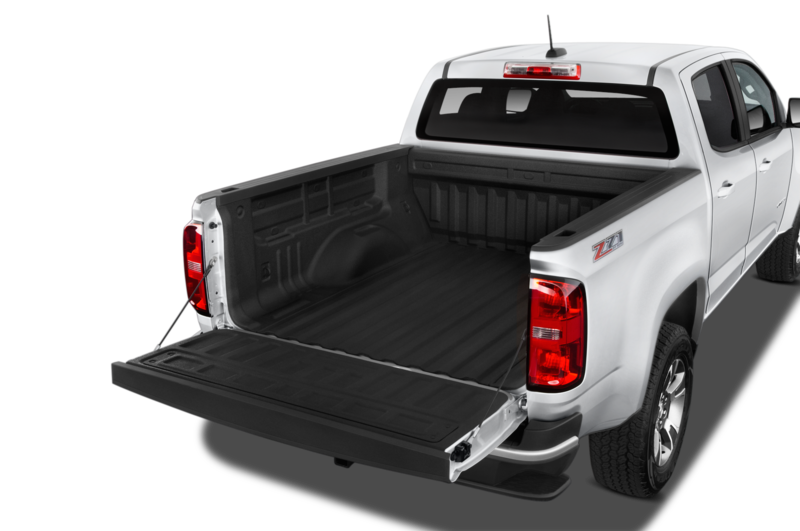 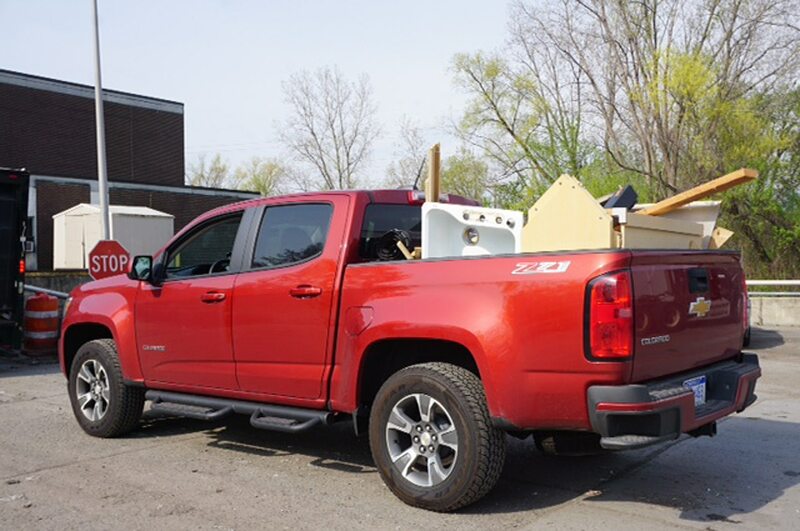 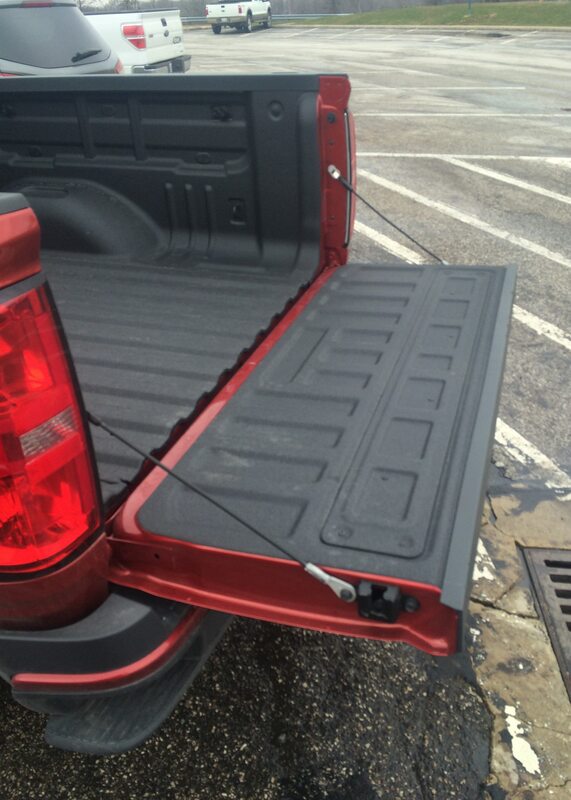 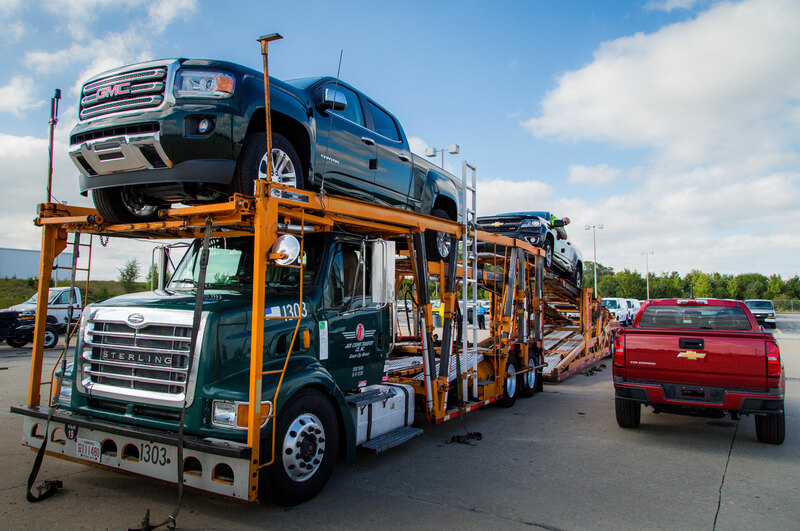 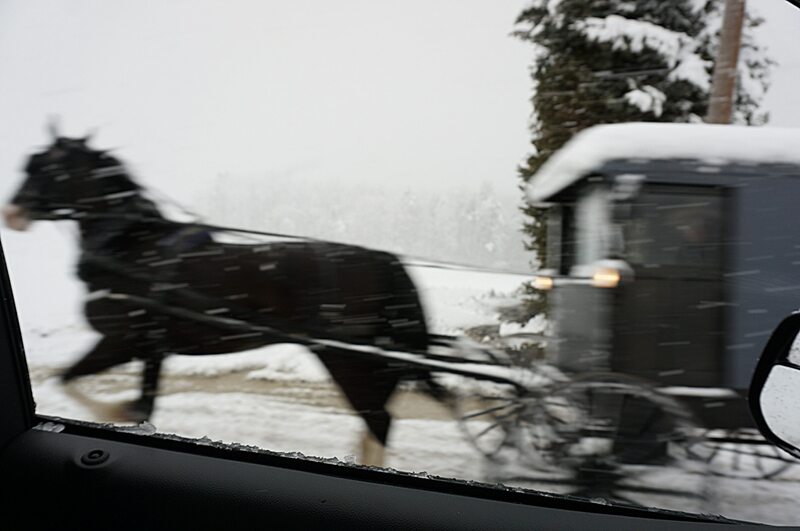 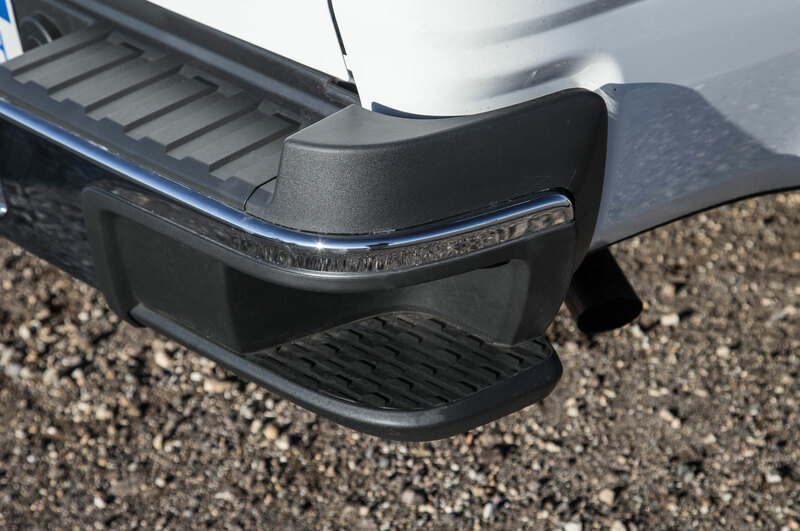 Milford, Michigan – Do buyers of half-ton pickup trucks want a trimmer, slimmer vehicle with no optional V-8 but with towing for up to 7000 pounds? 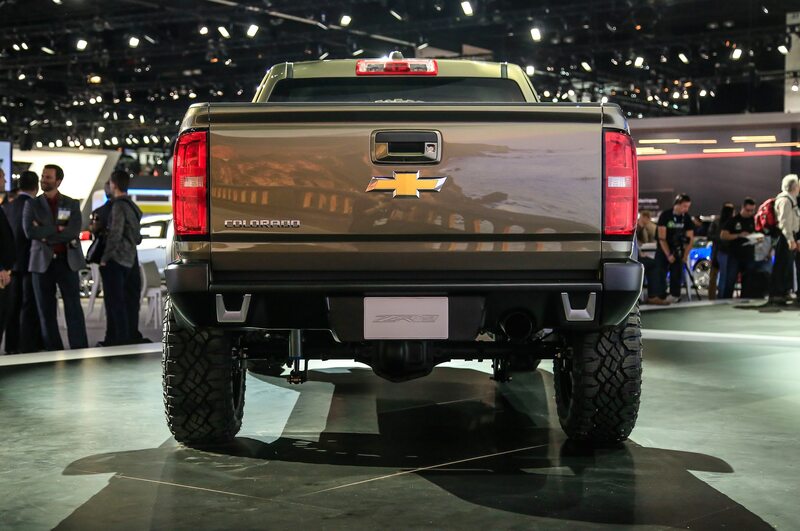 Would this crowd prefer to find easy downtown parking than to sit cheek-by-jowl with eighteen-wheelers on the freeway? 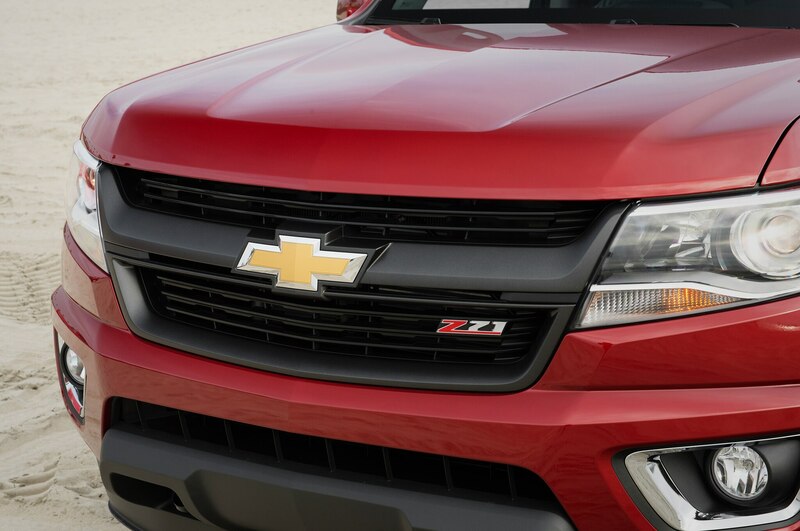 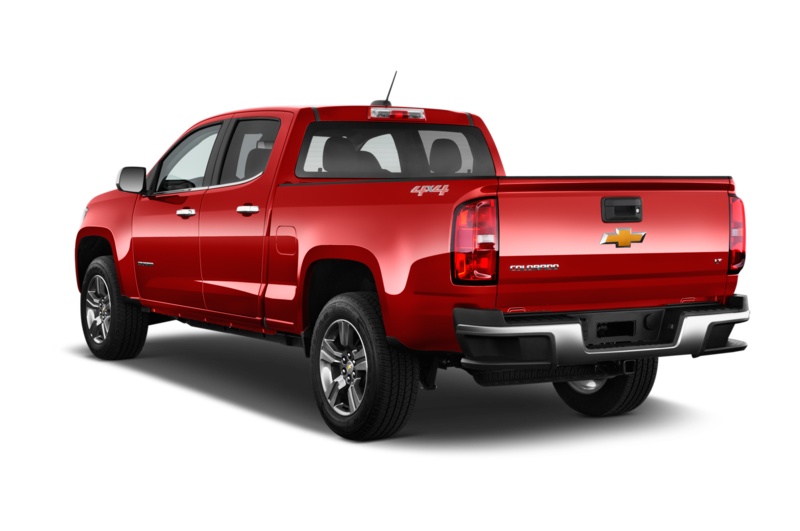 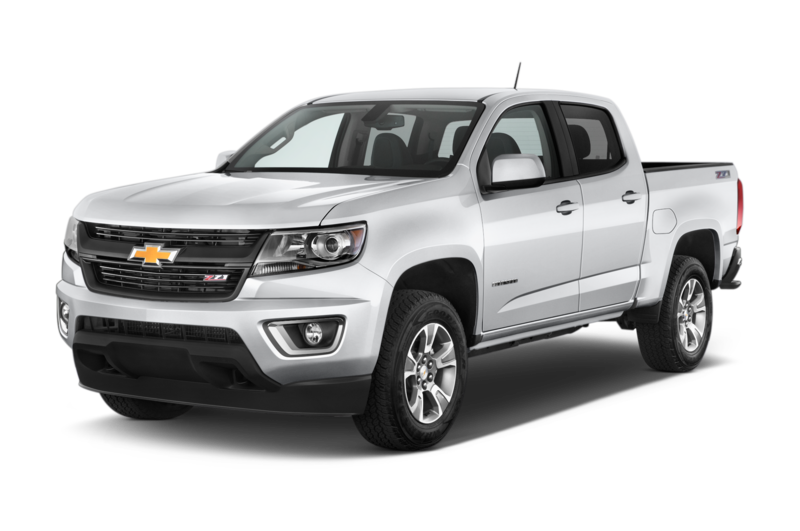 To the average buyer of the Ford F-150, Chevrolet Silverado, GMC Sierra, or Ram 1500, the 2015 Chevrolet Colorado and GMC Canyon aren’t worth the $5,000 to $10,000 in savings (before incentives) and the extra mpg. 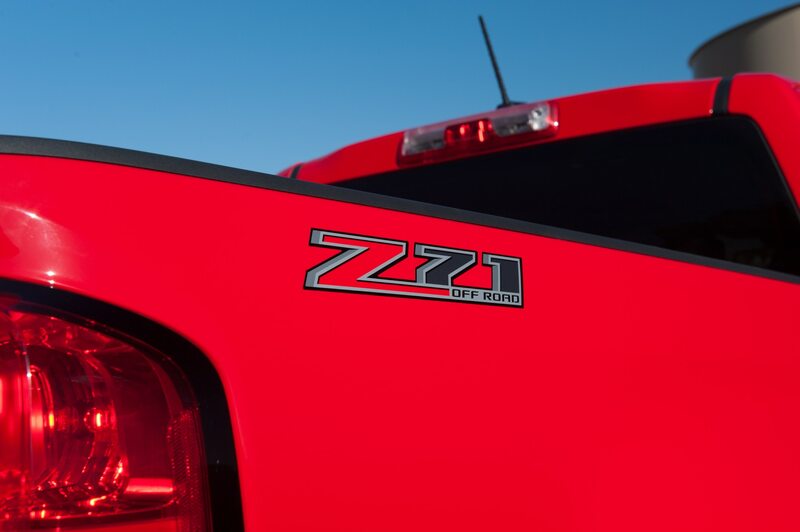 But if you prefer the maneuverability of a new pickup that’s maybe a tad smaller than the half-tons of a generation ago, you are not Truck People. 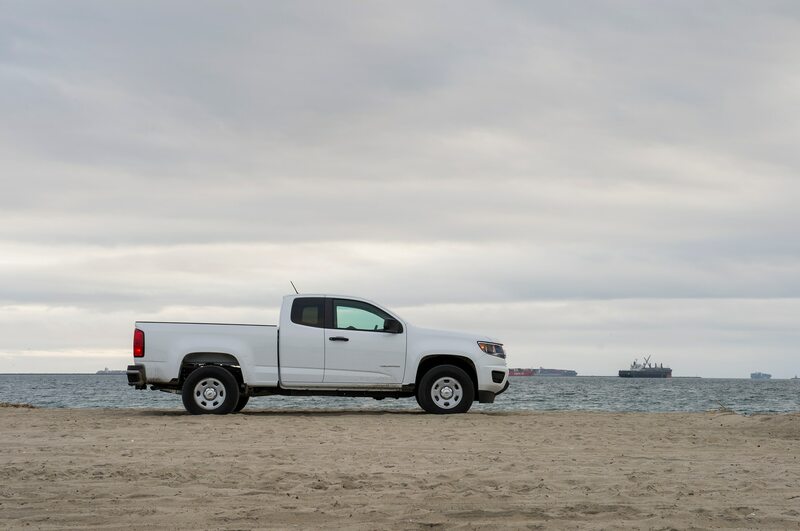 Some owners of the 12 million midsize trucks that General Motors says are on U.S. roads will be ready for a new rig that is not a warmed-over Toyota Tacoma or Nissan Frontier designed during the Clinton administration. 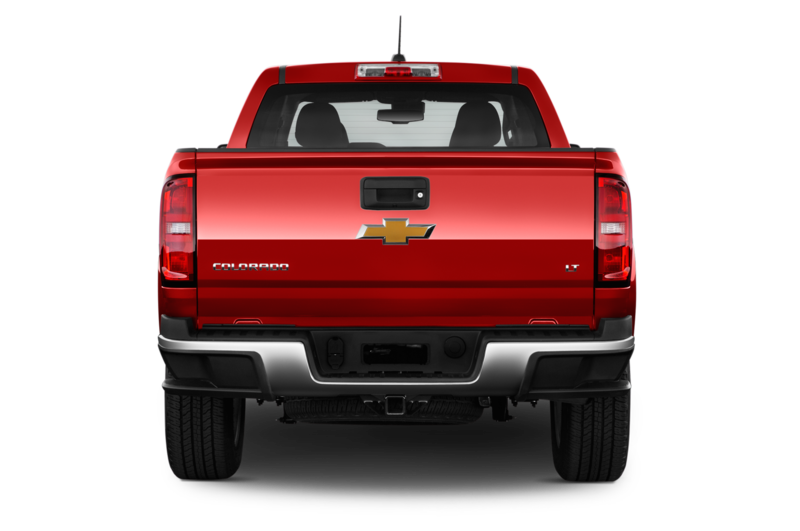 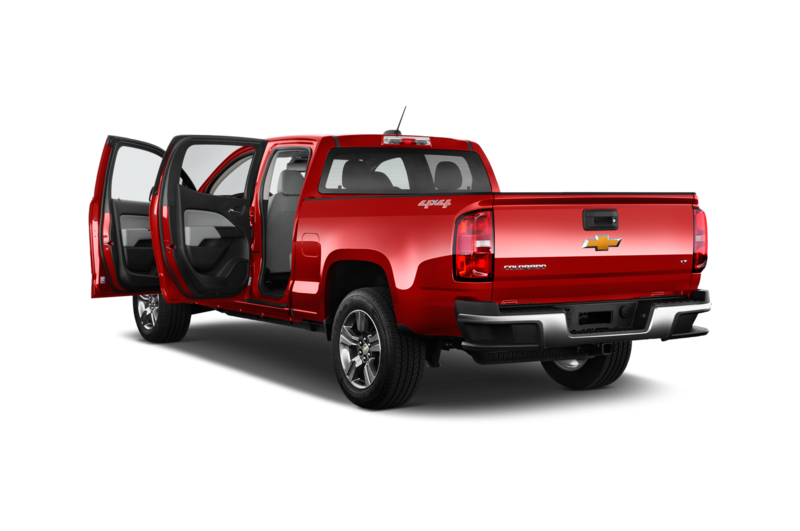 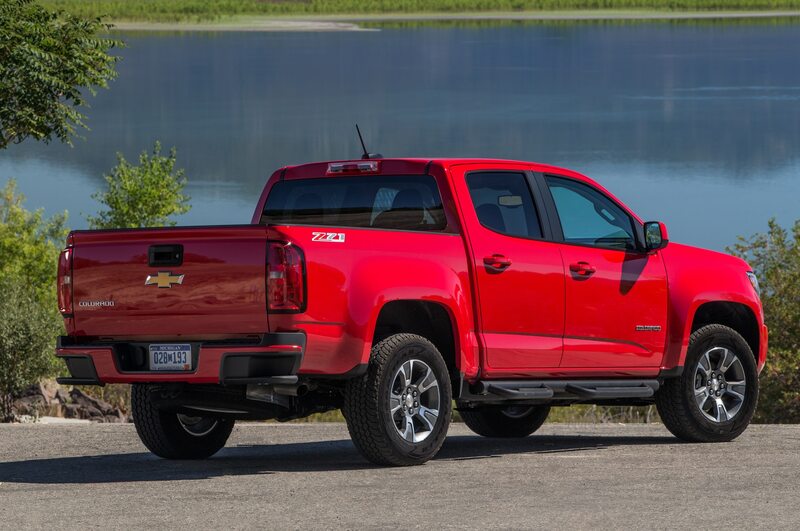 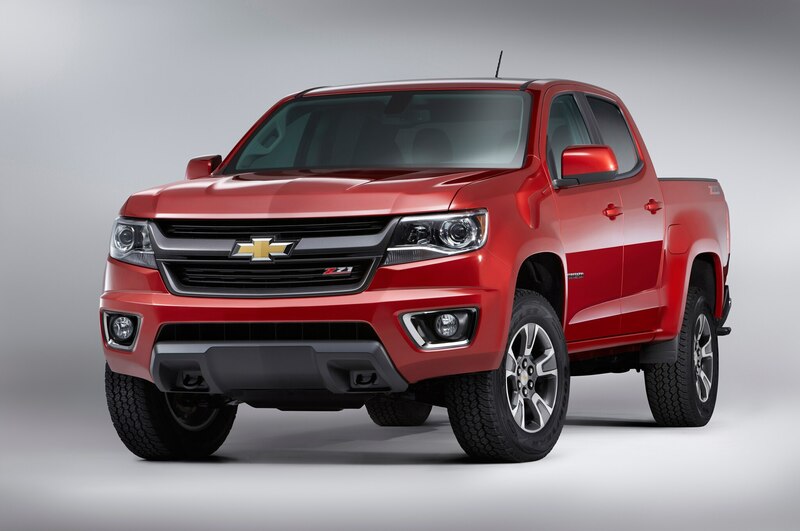 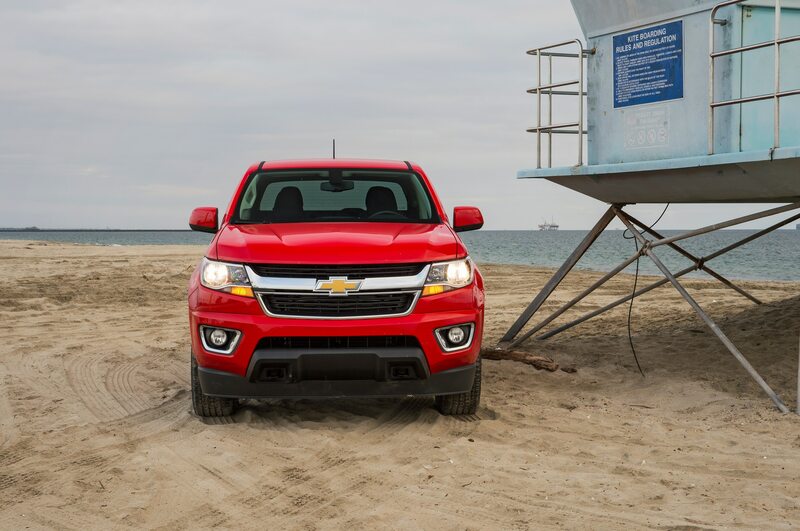 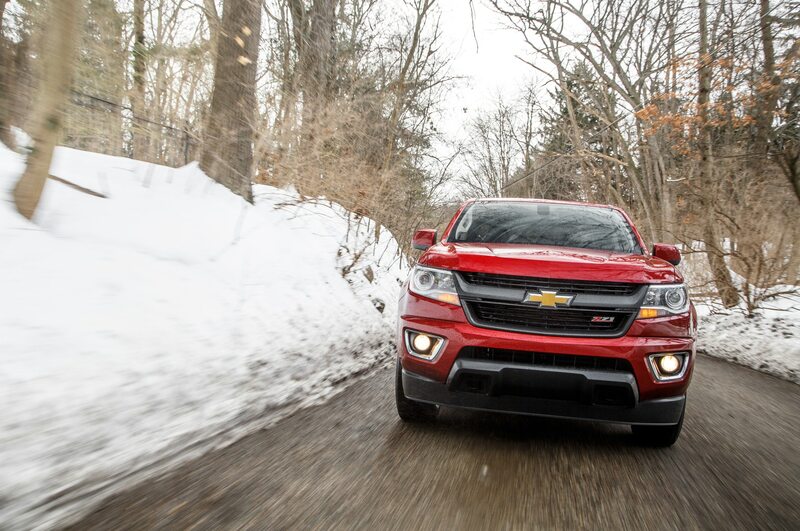 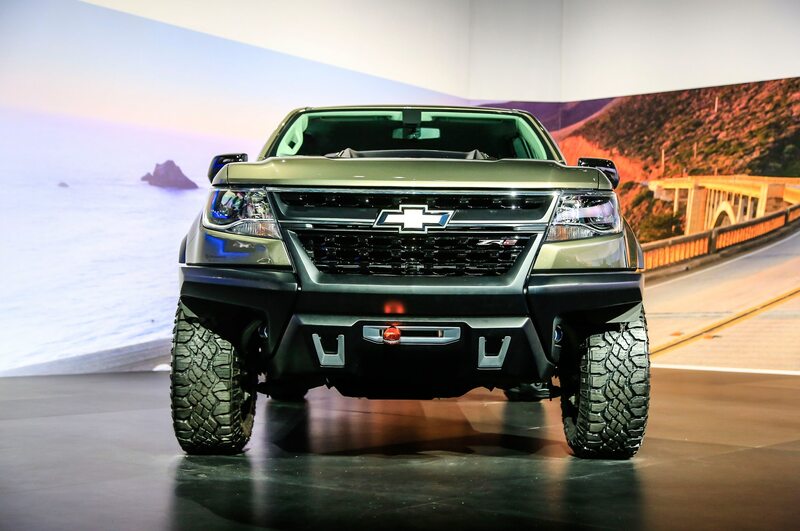 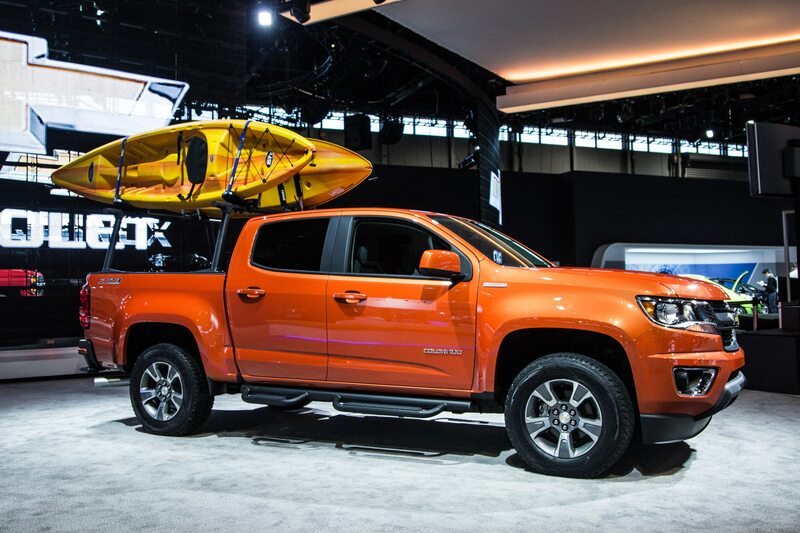 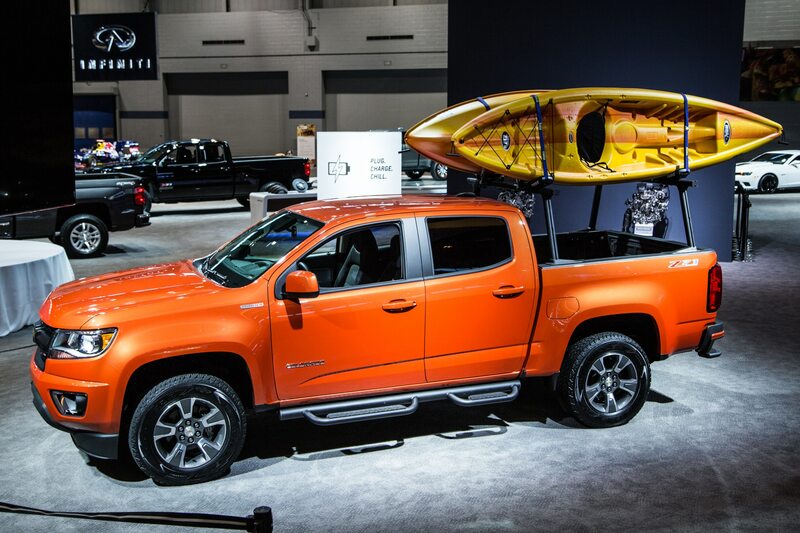 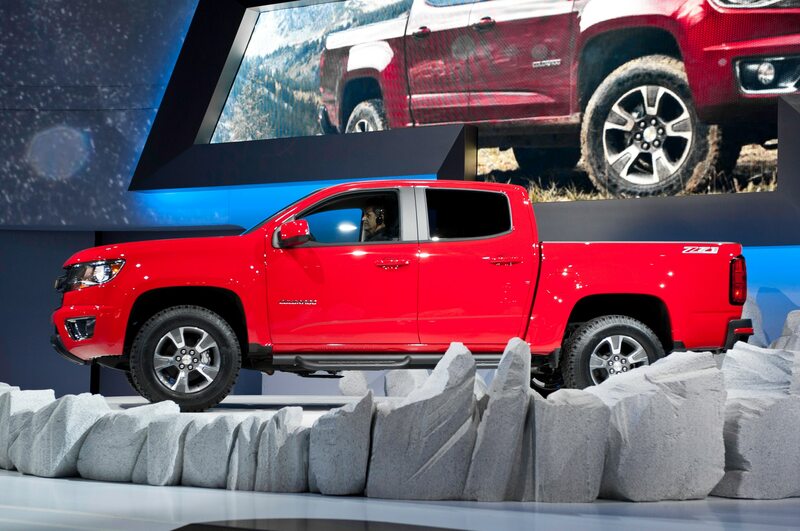 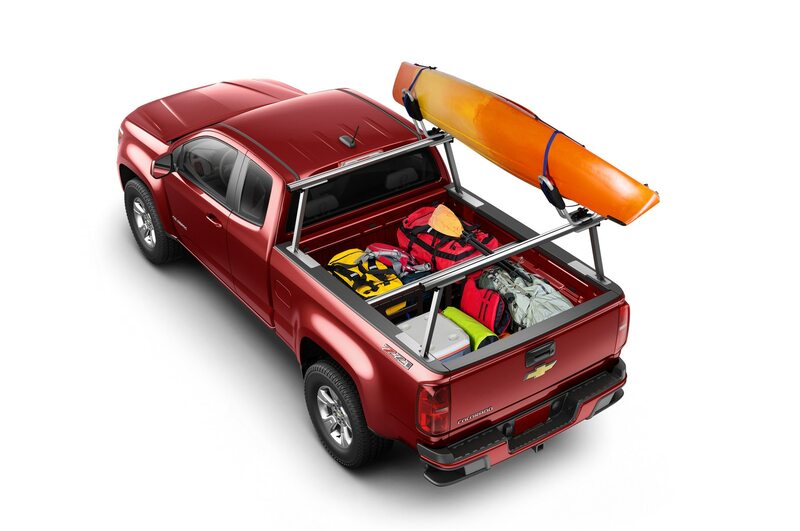 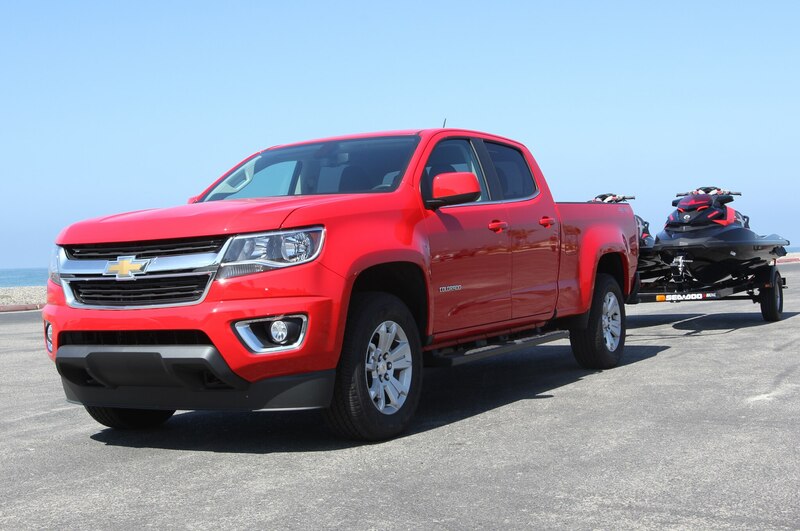 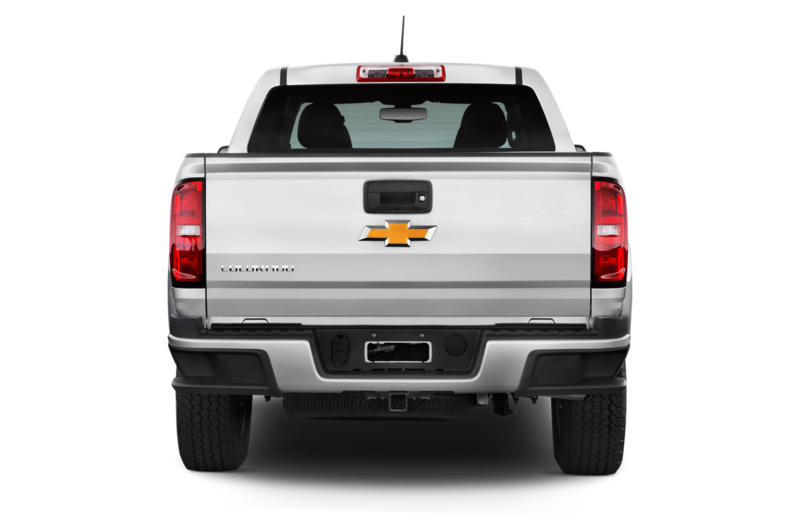 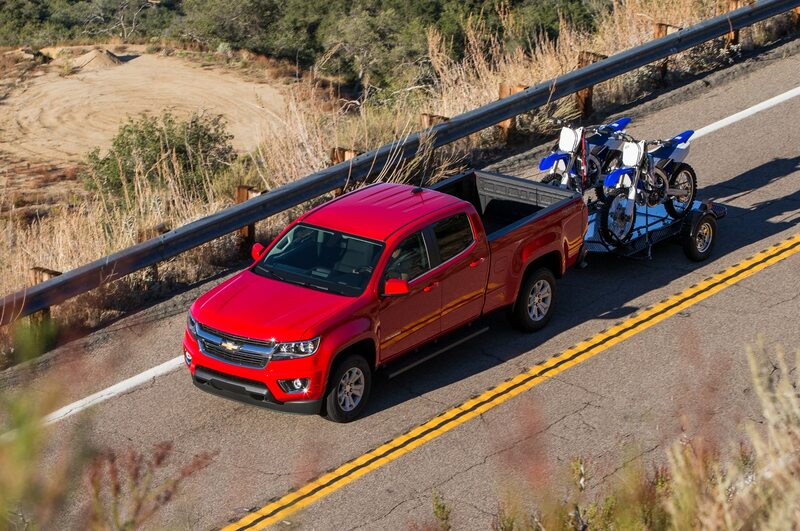 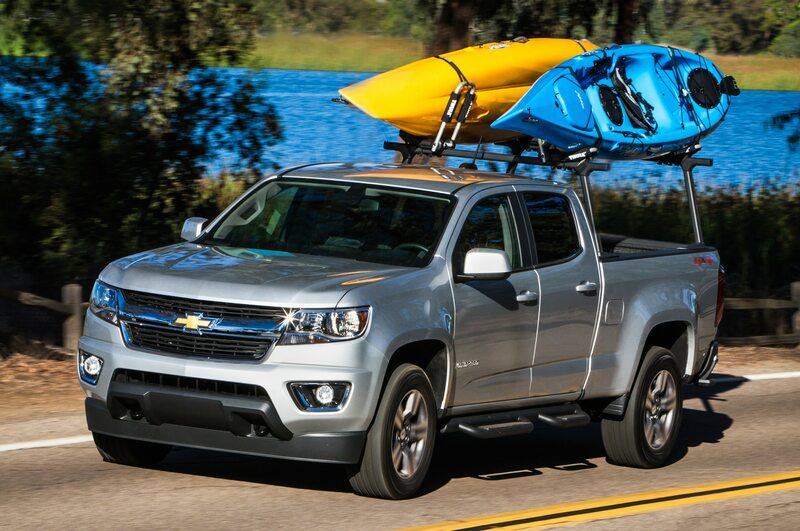 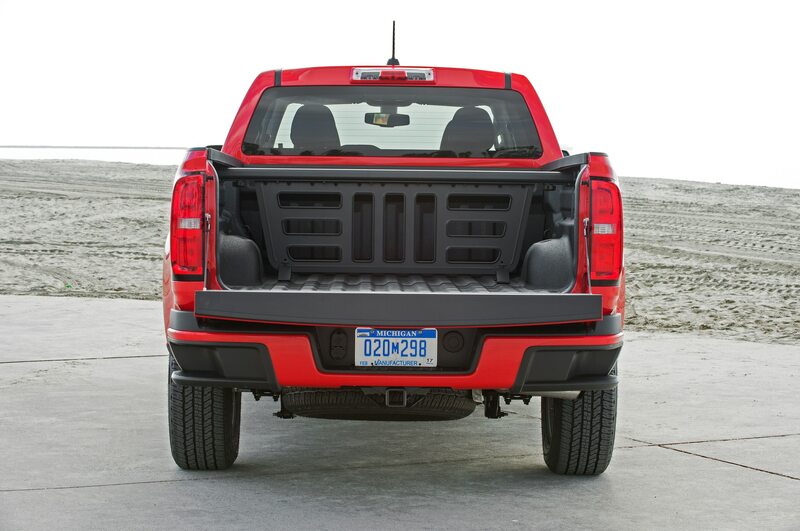 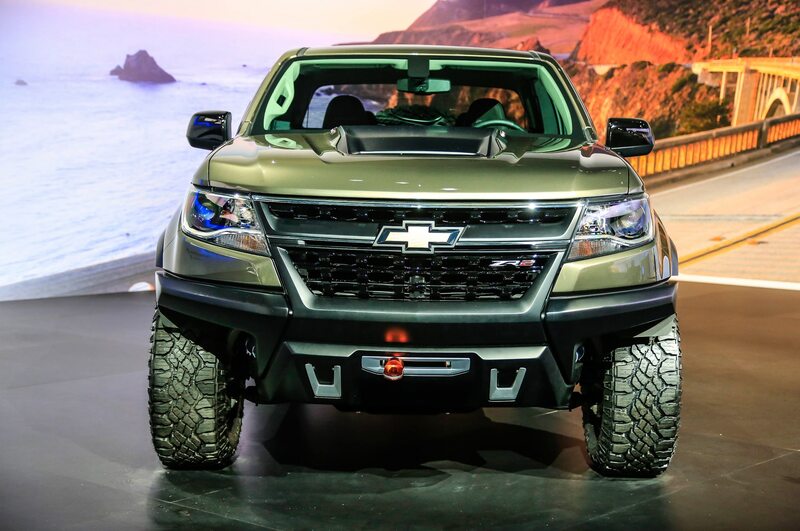 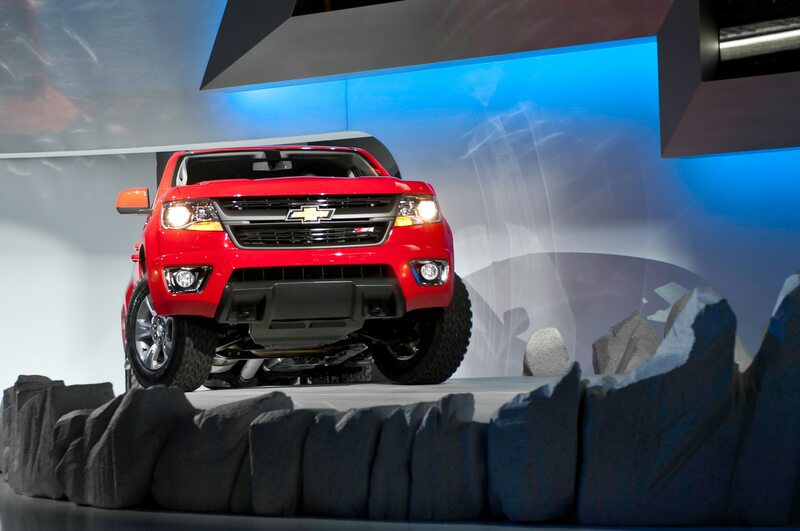 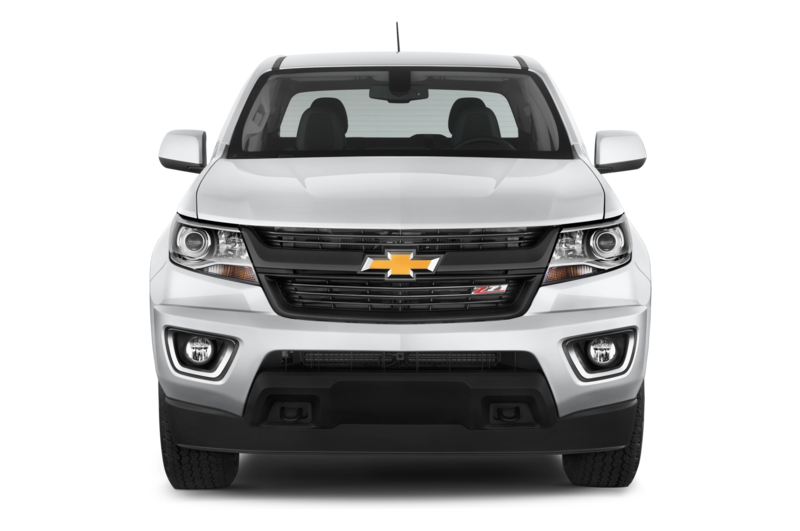 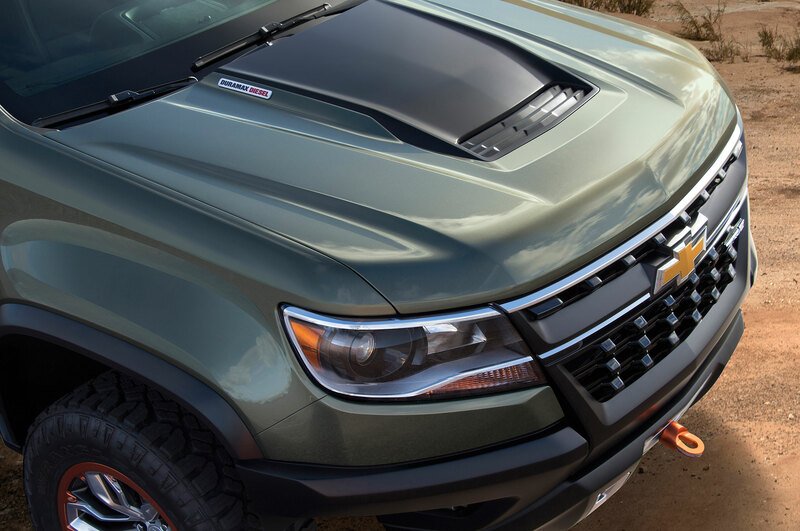 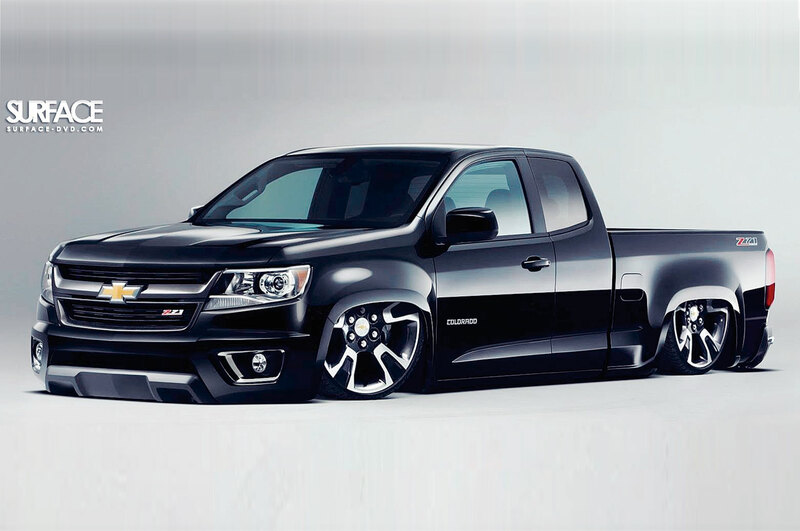 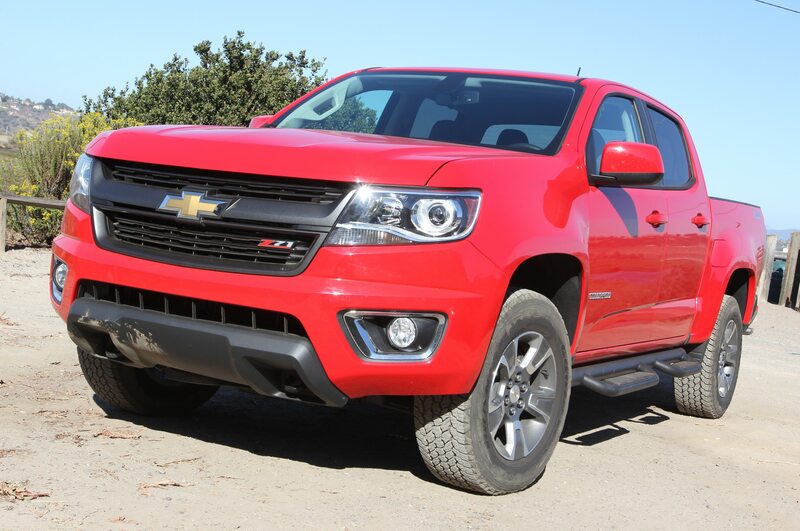 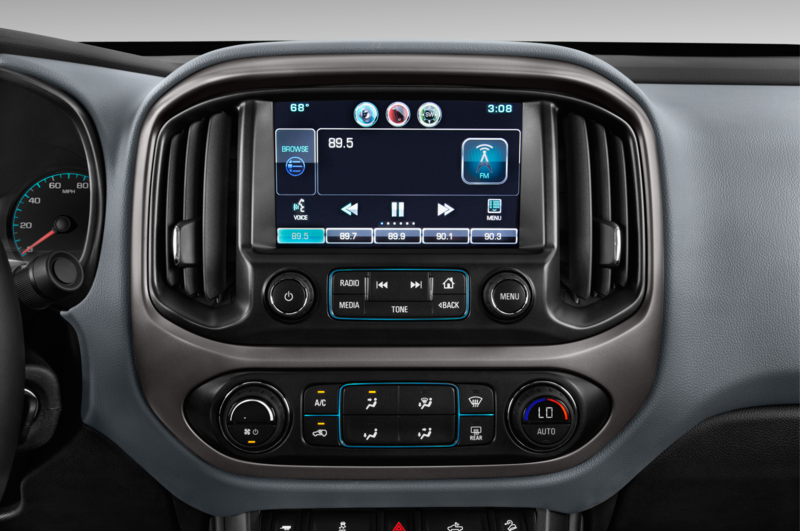 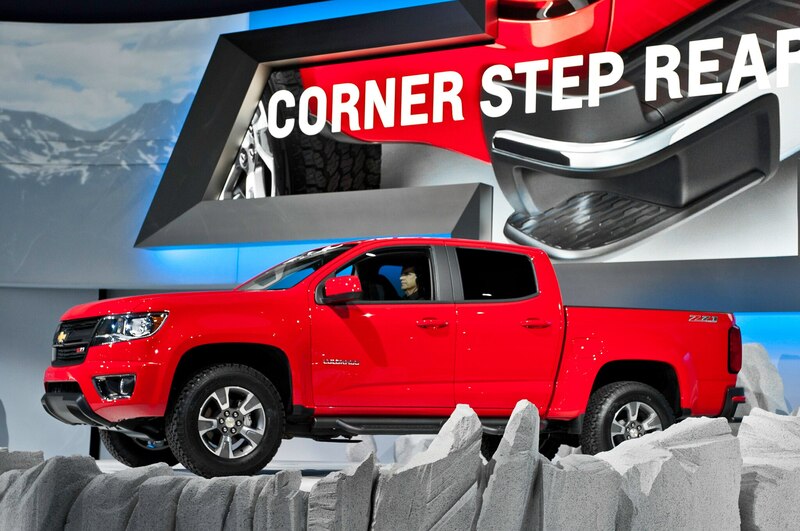 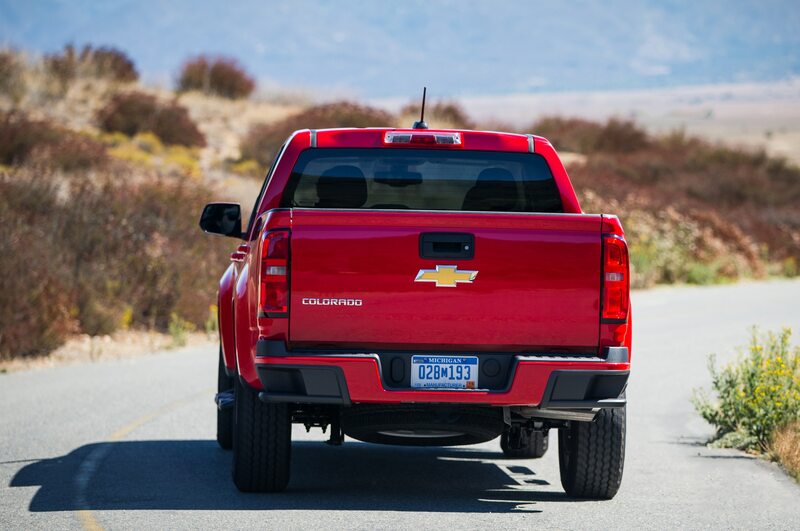 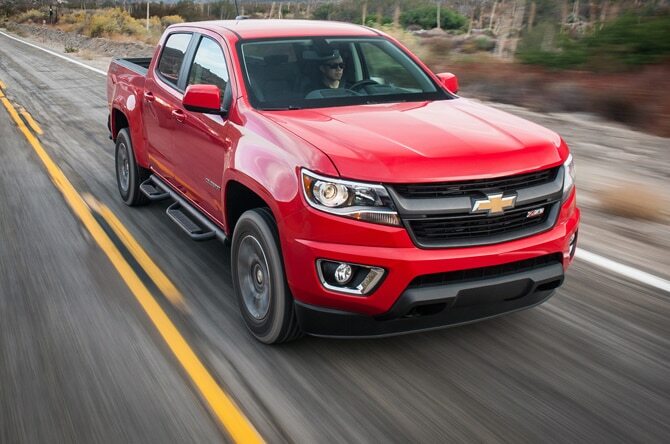 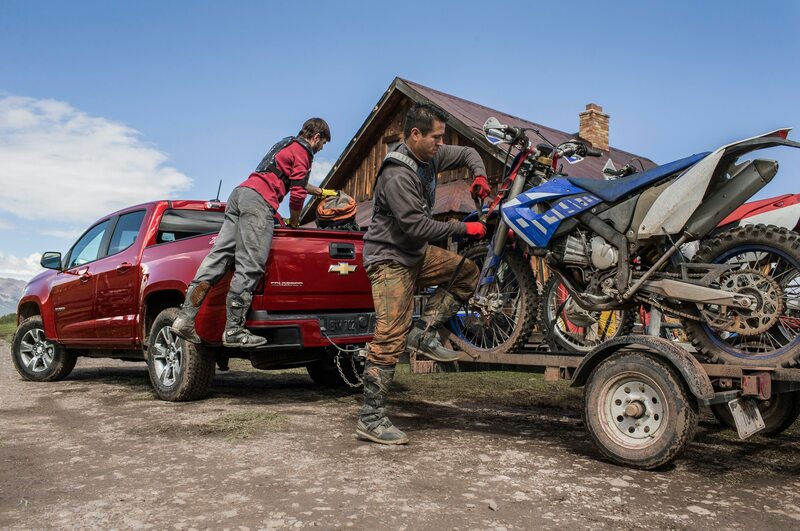 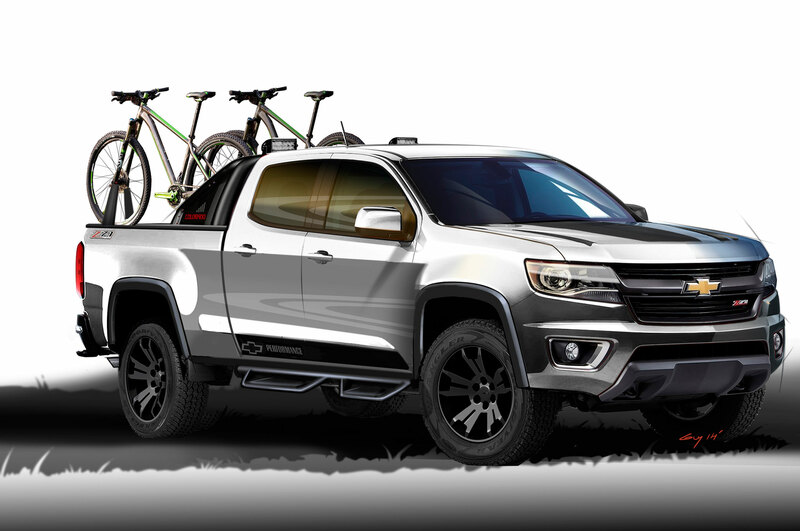 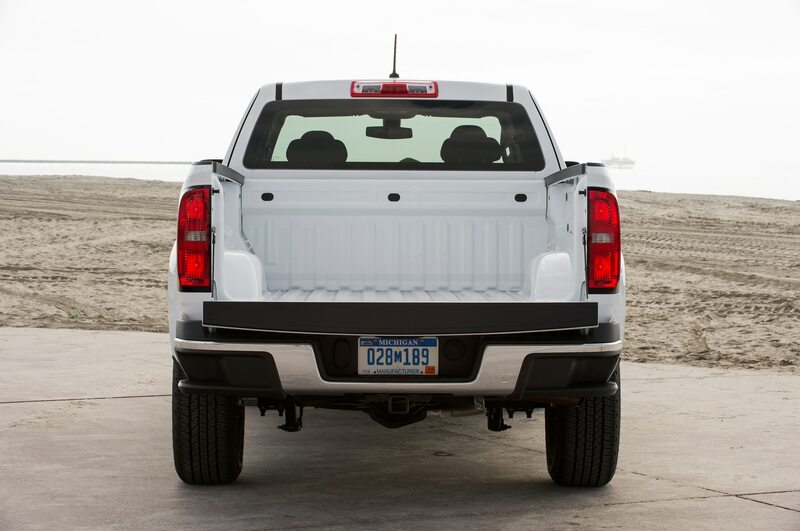 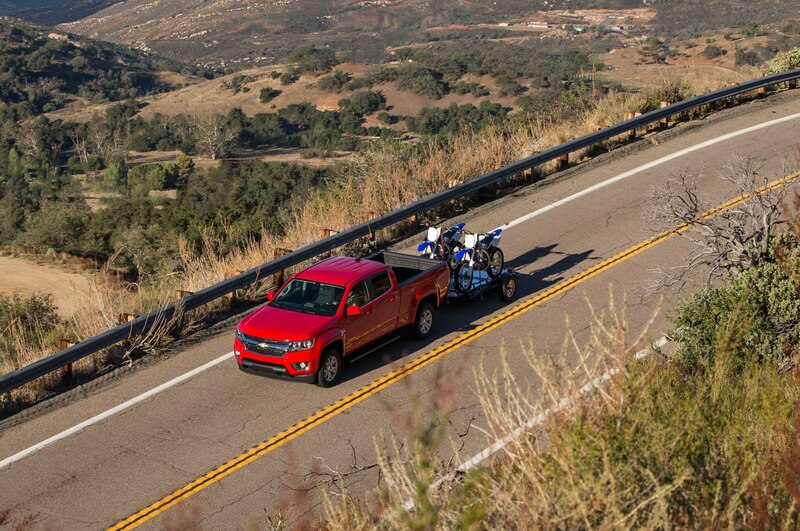 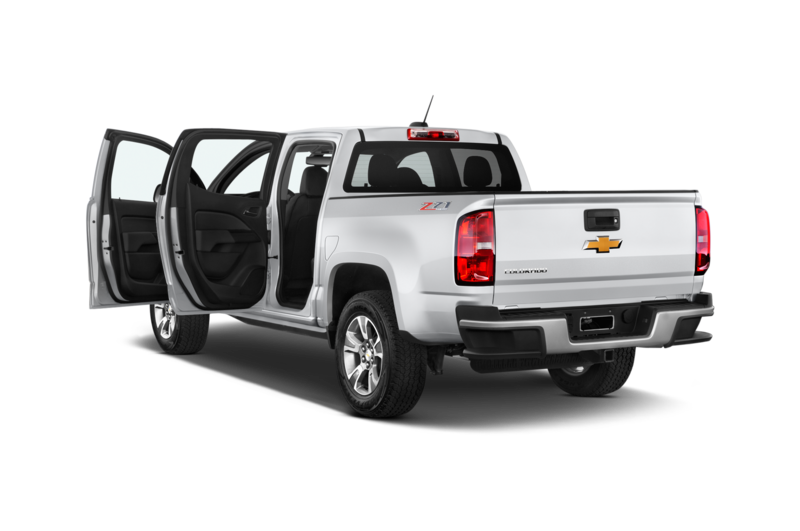 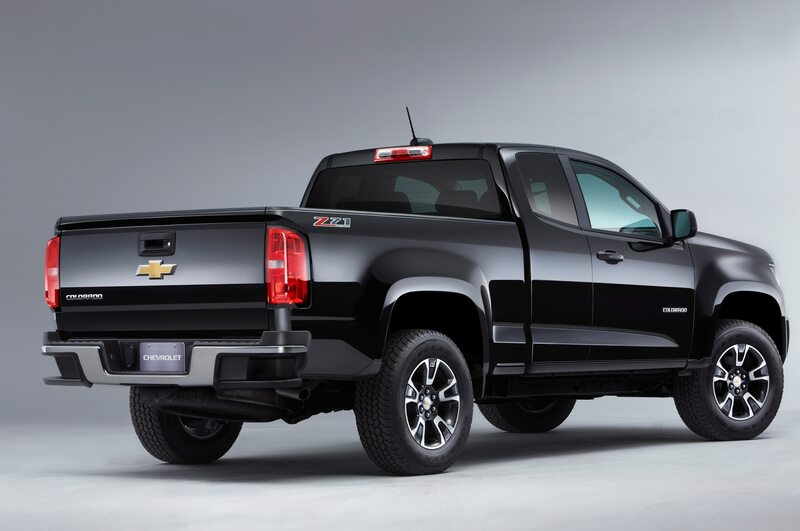 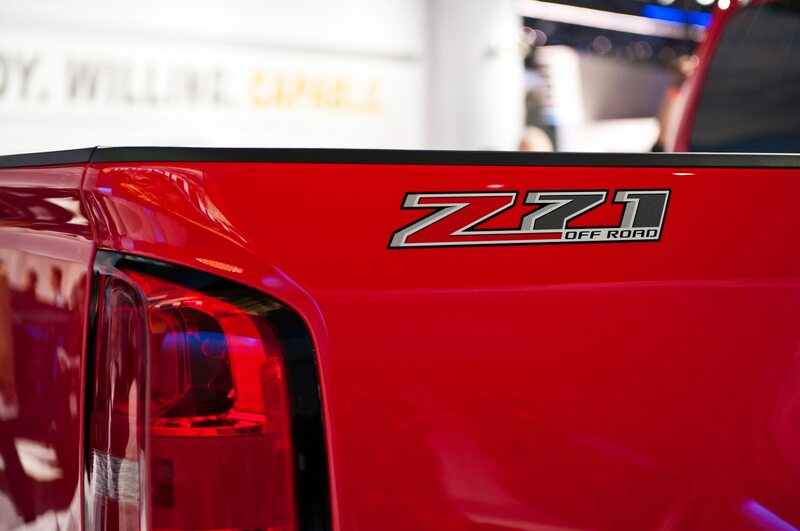 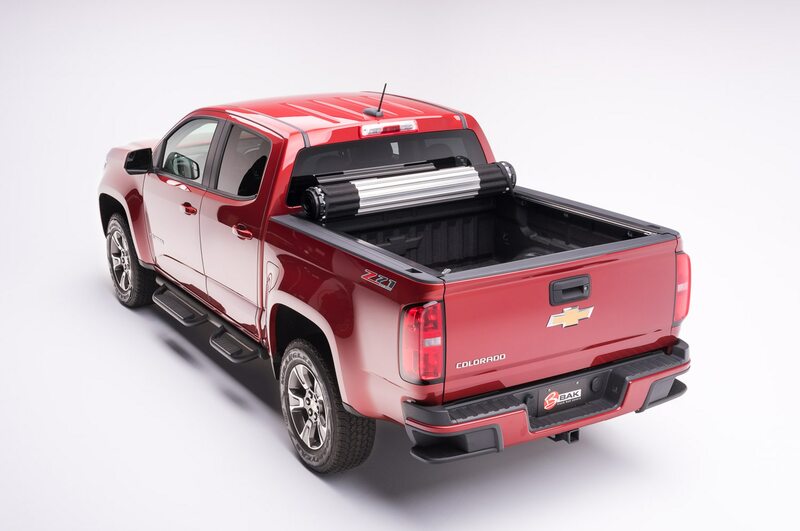 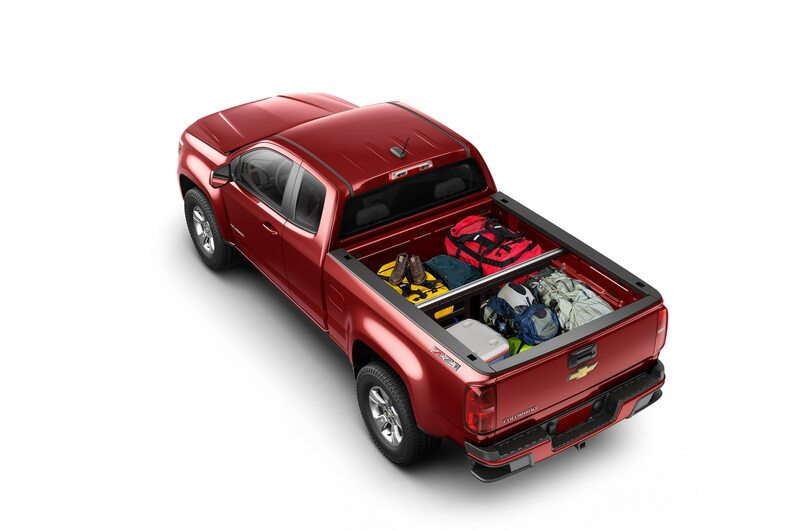 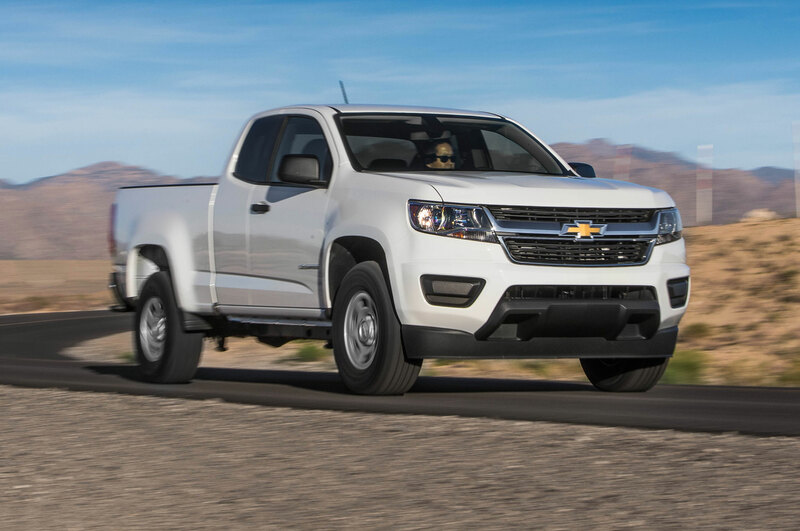 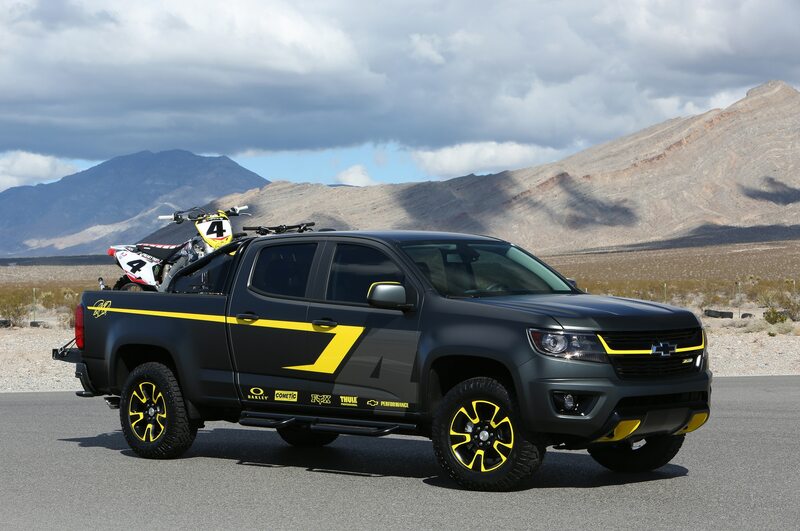 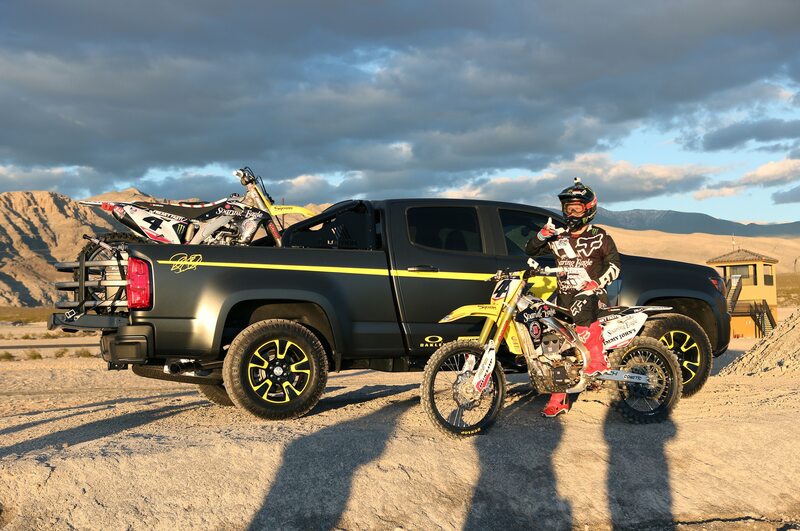 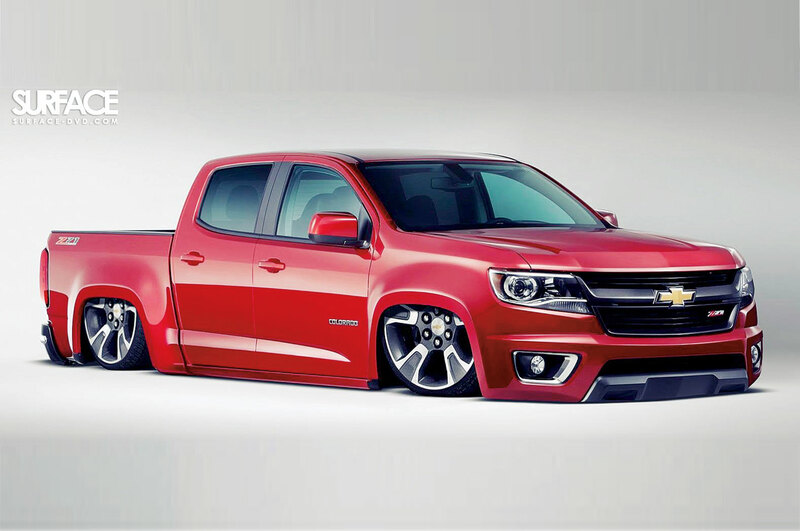 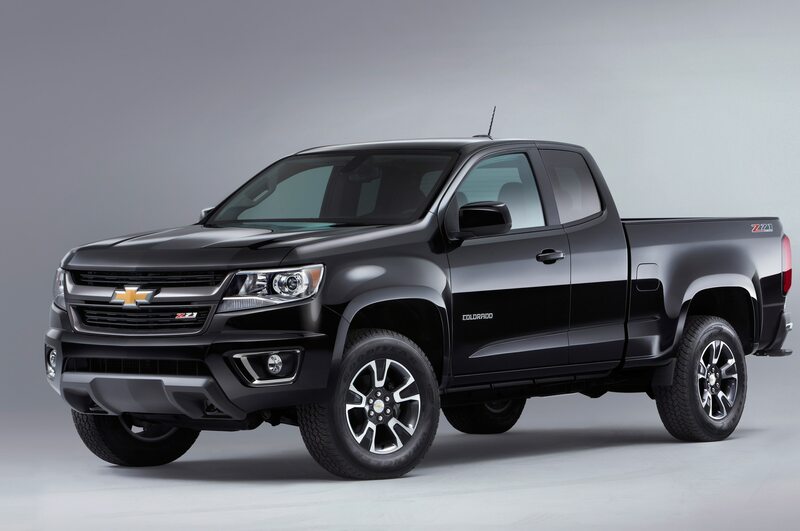 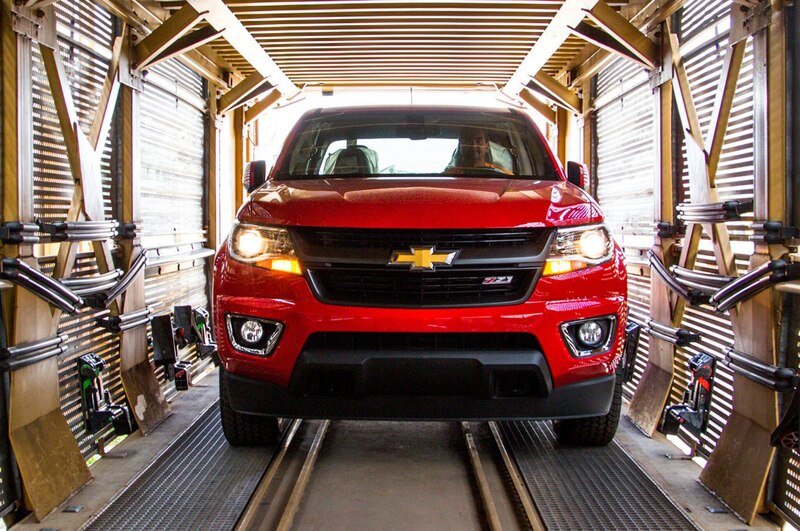 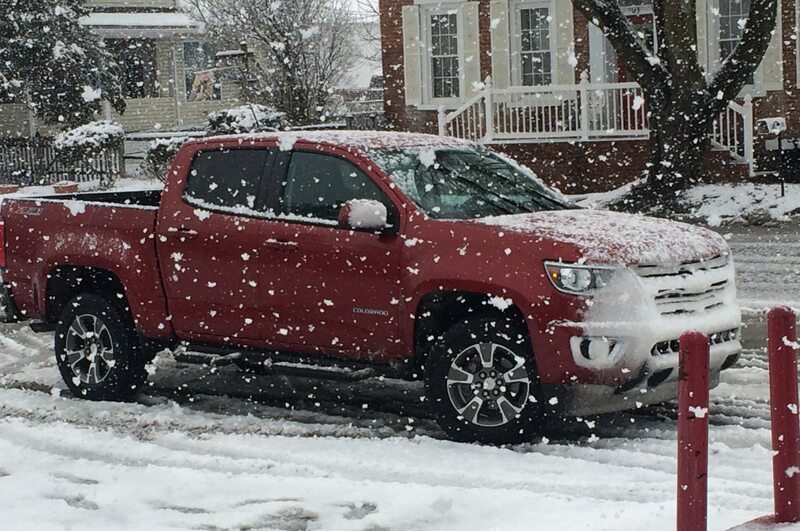 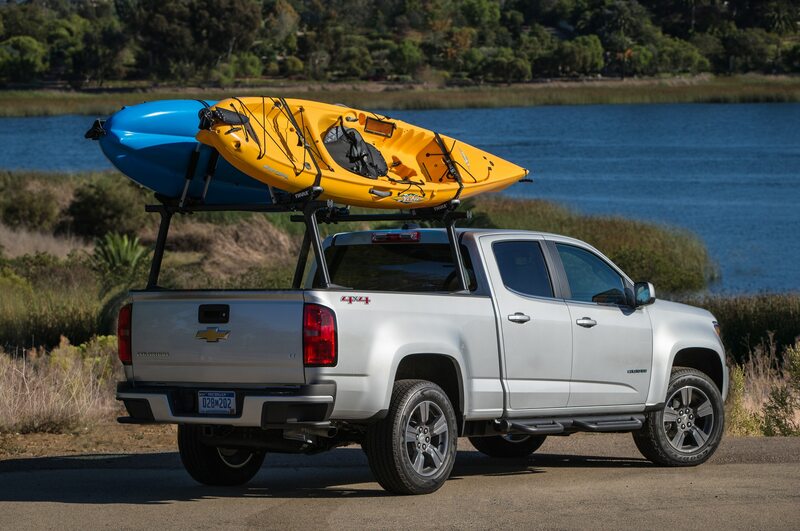 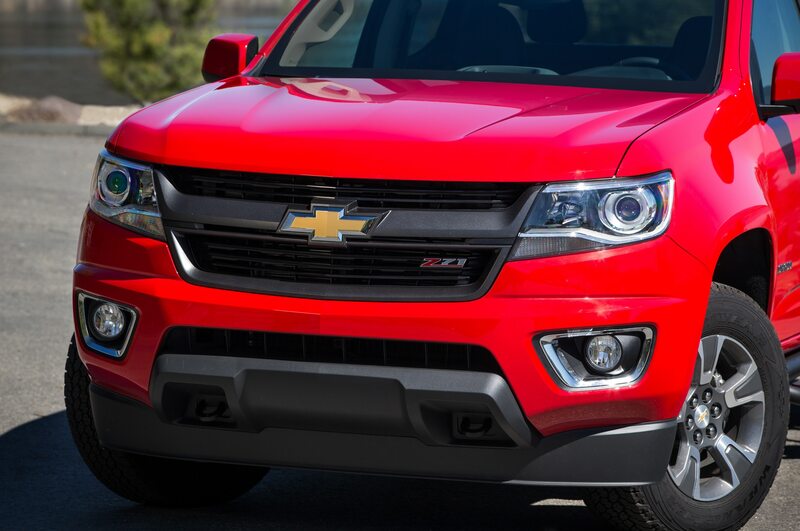 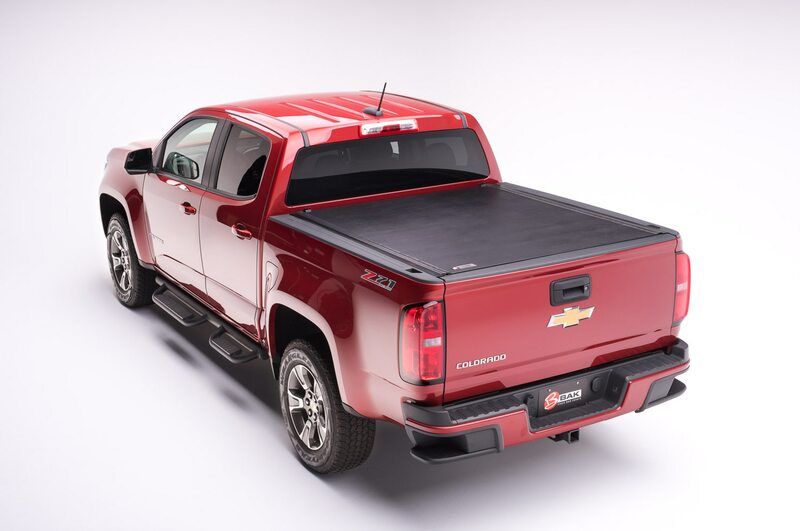 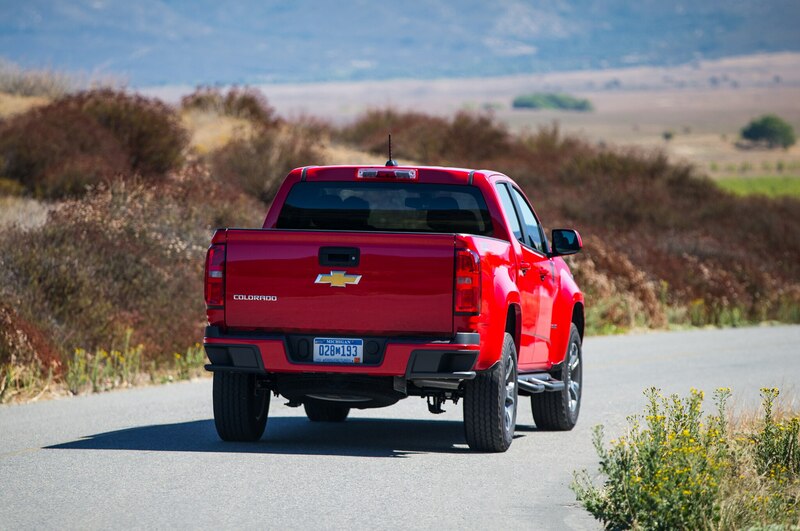 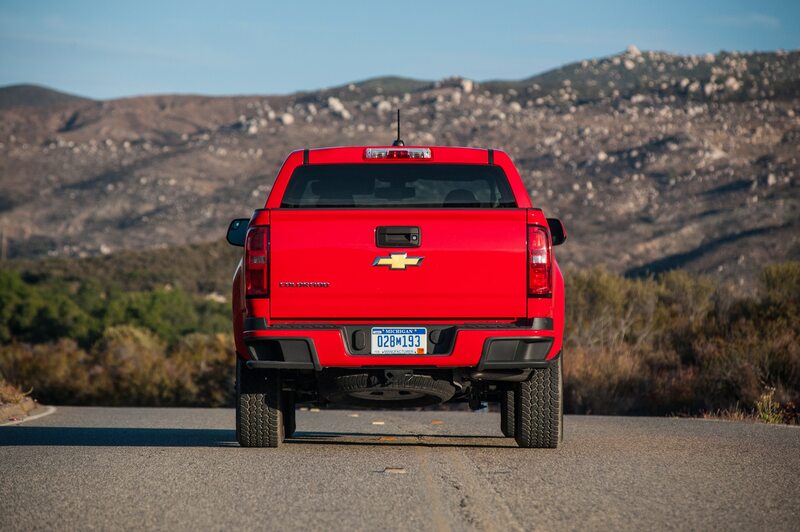 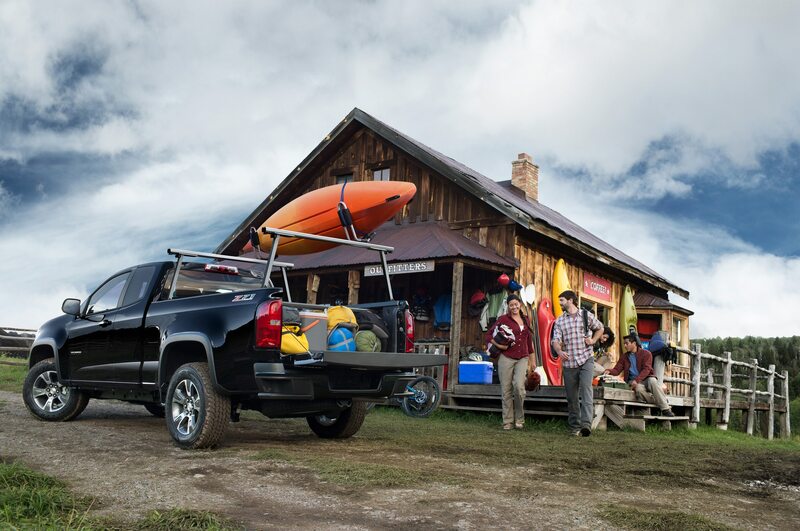 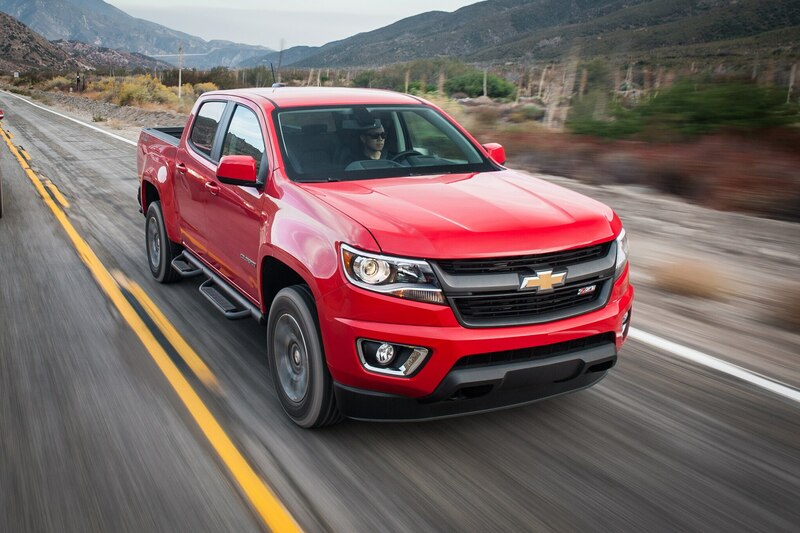 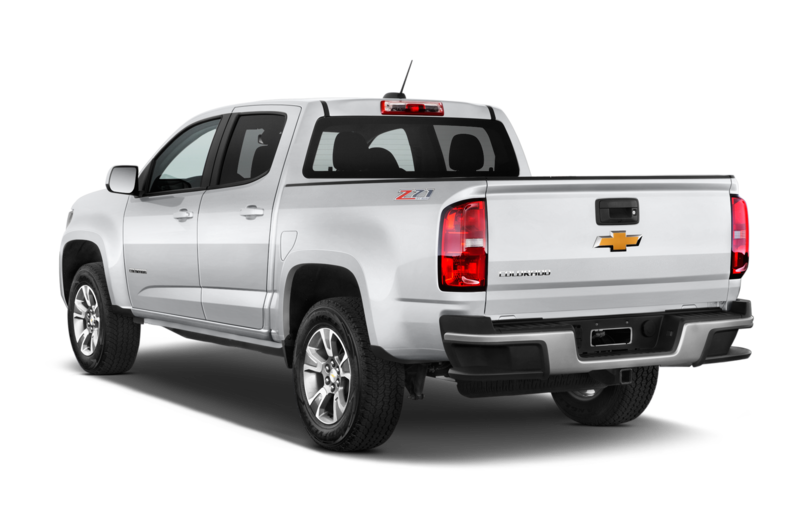 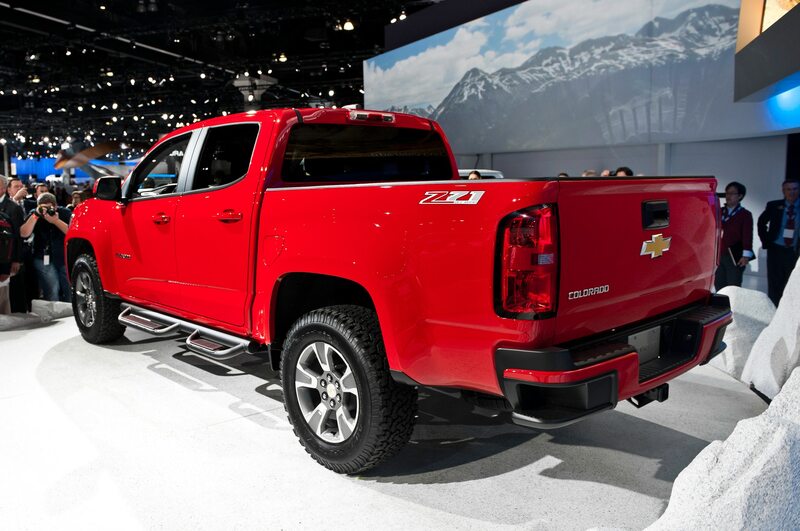 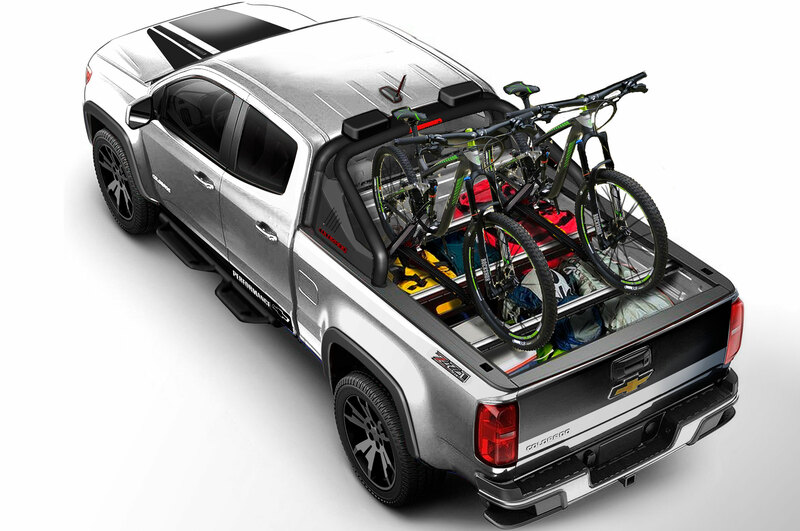 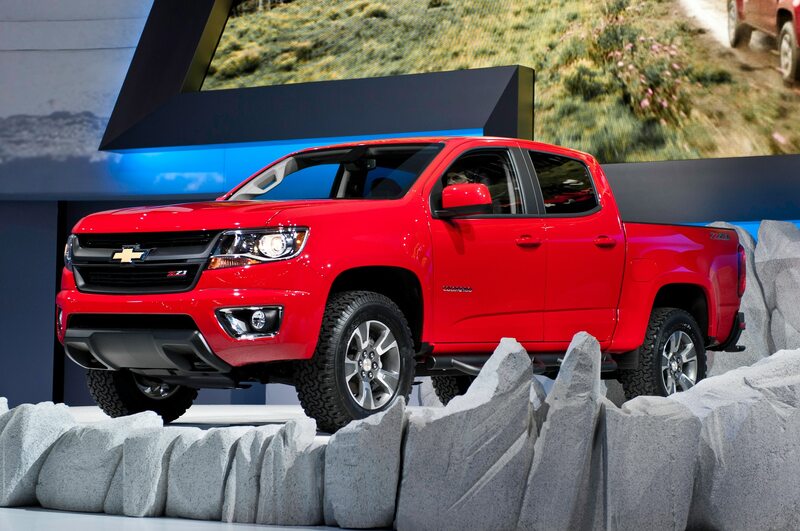 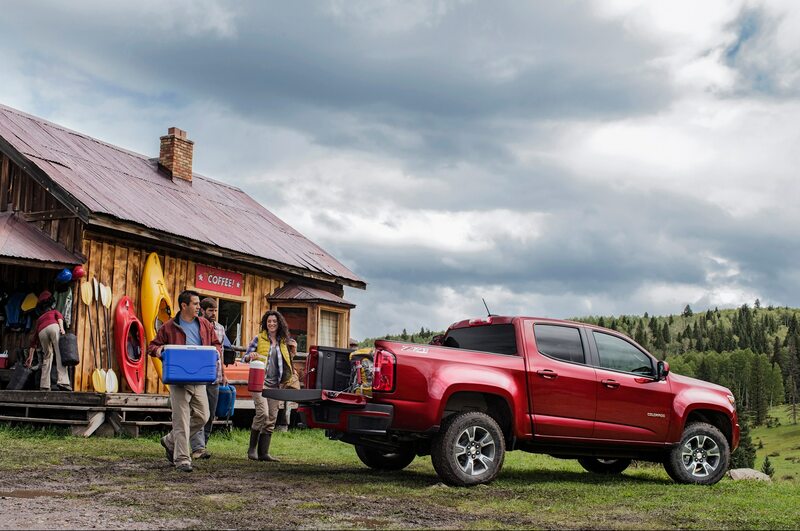 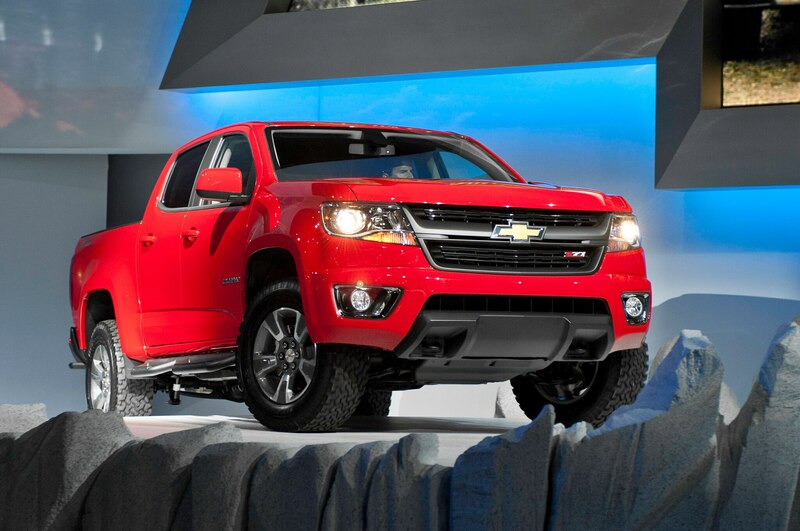 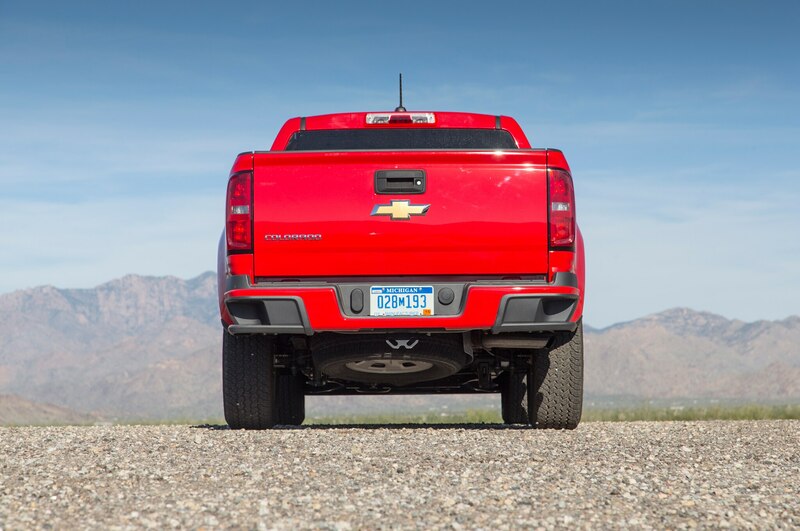 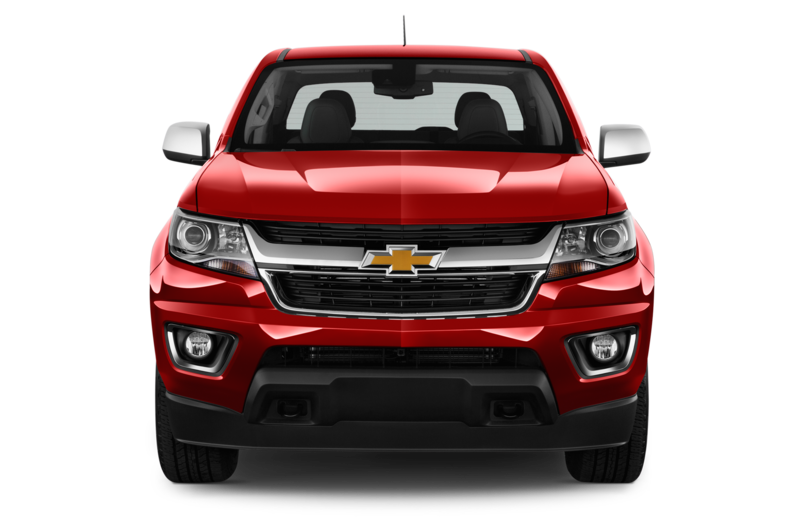 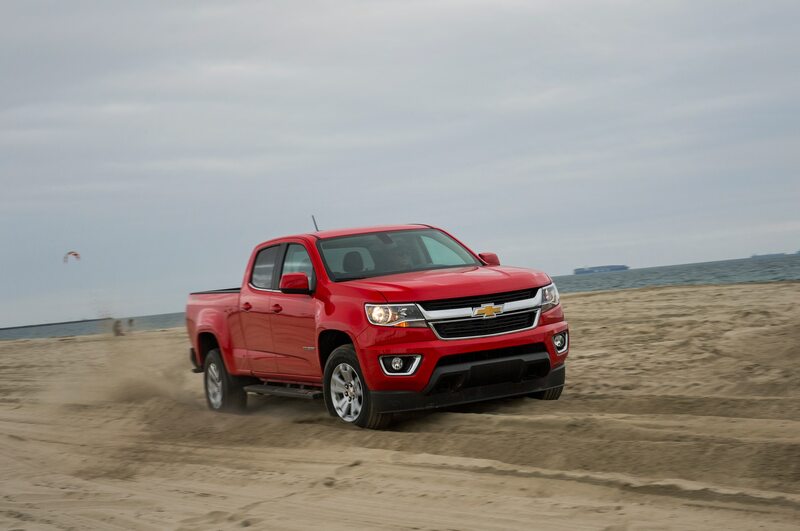 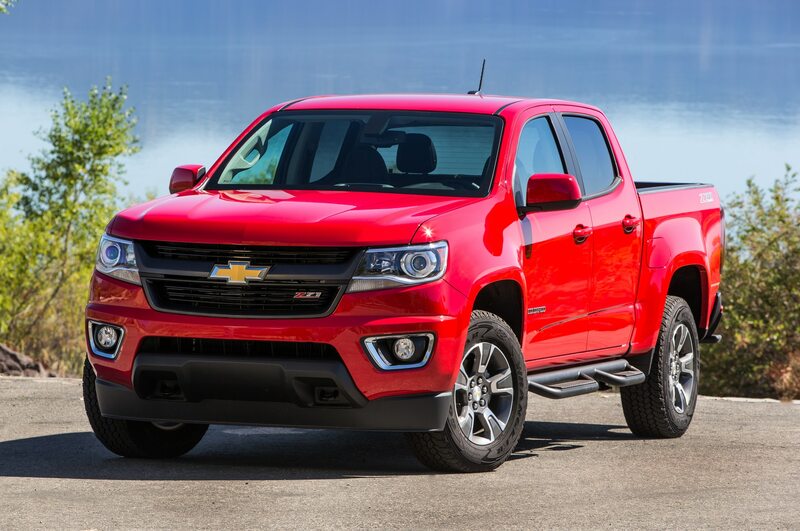 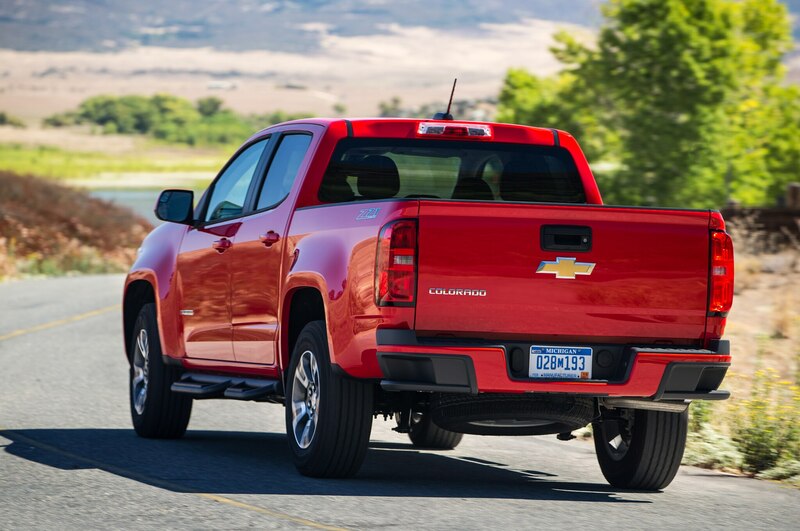 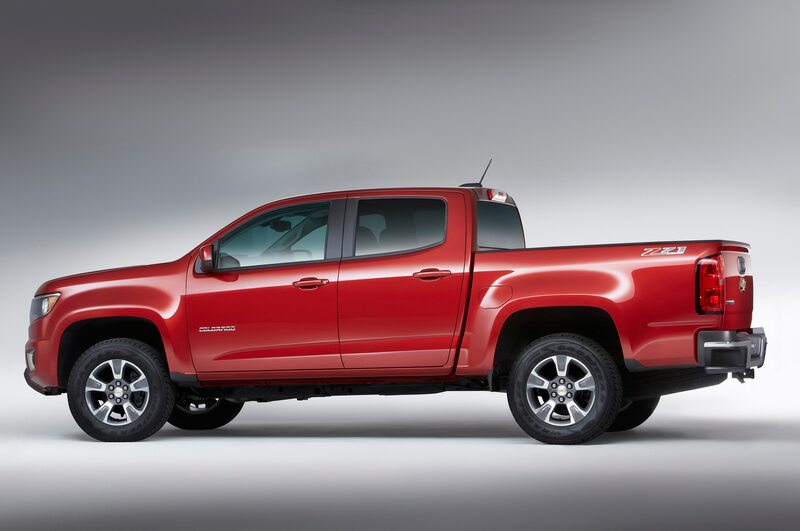 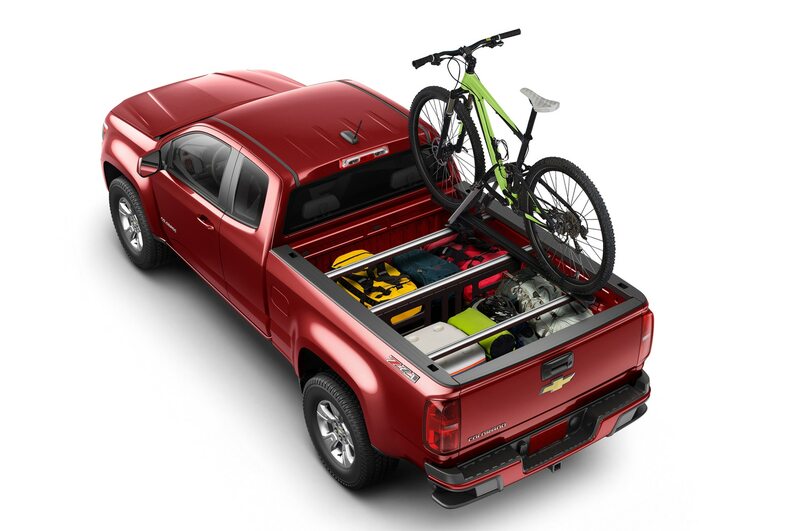 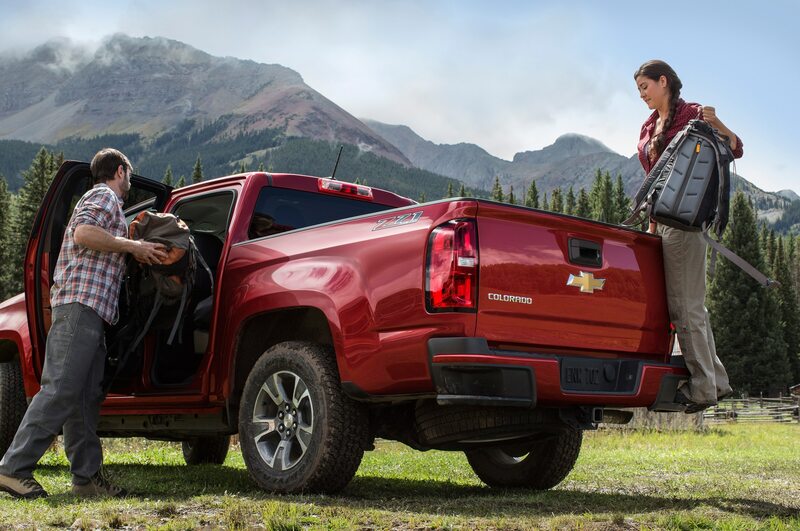 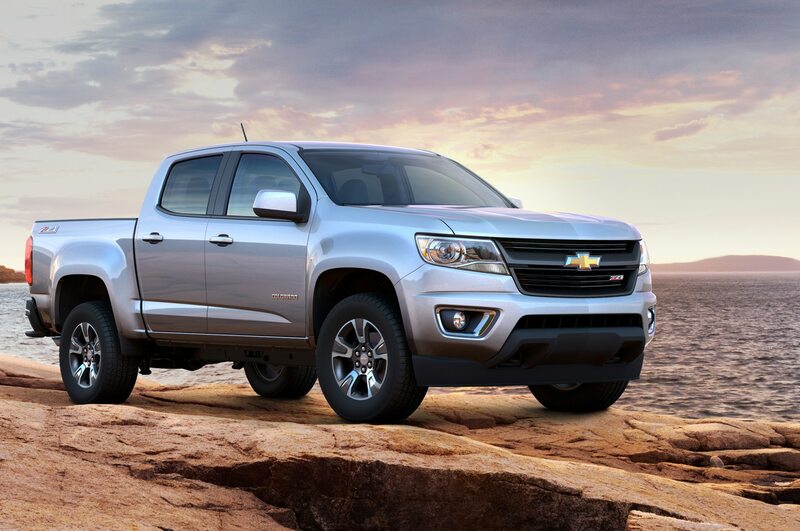 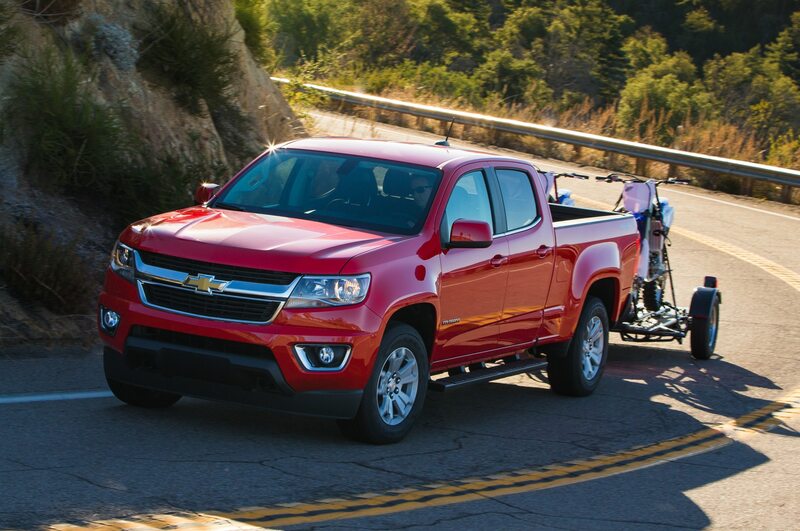 The question hanging over the roofs of the 2015 Chevrolet Colorado and GMC Canyon is whether the number of midsize truck customers is substantially larger than the enthusiast crowd that loudly, but unconvincingly, clamors for diesel stick-shift station wagons. 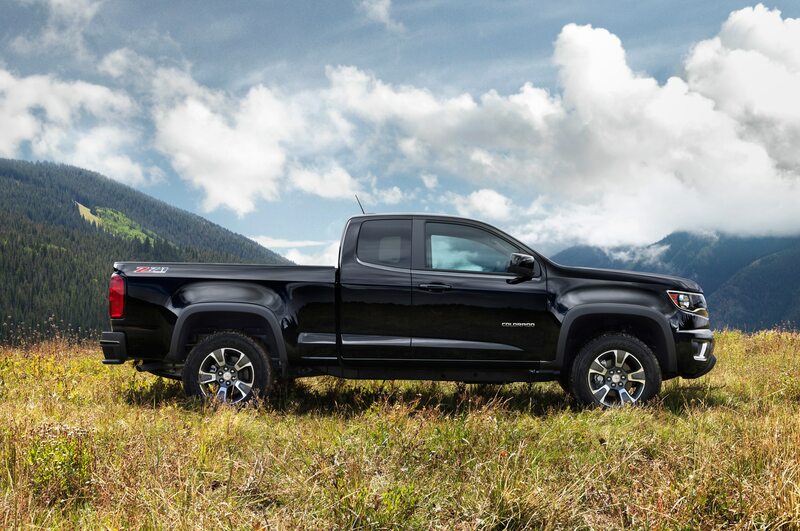 Though it’s safe to predict some sales success in the first year after the trucks go on sale this fall, the big test will come in the second year, after all the early intenders have bought their Colorados and Canyons. 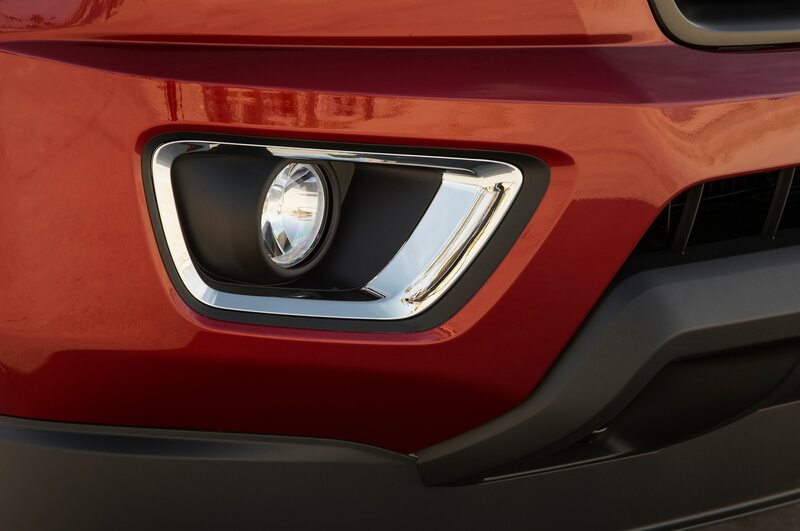 By then, Toyota finally will have introduced a new Tacoma. 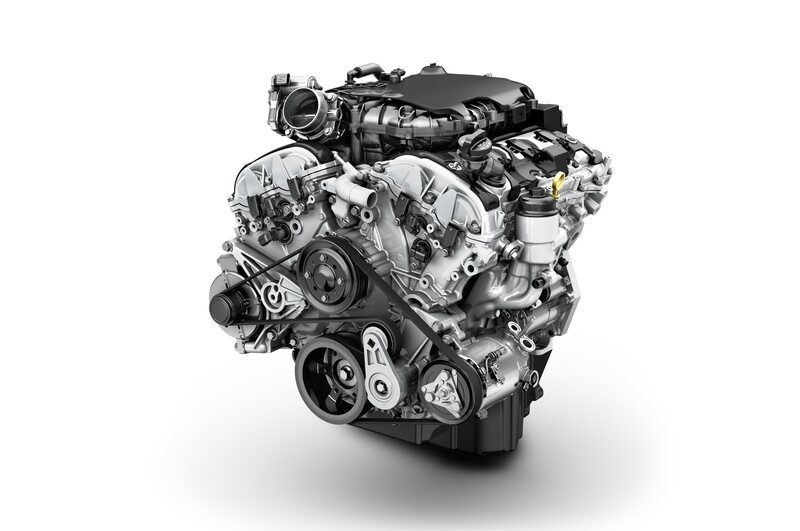 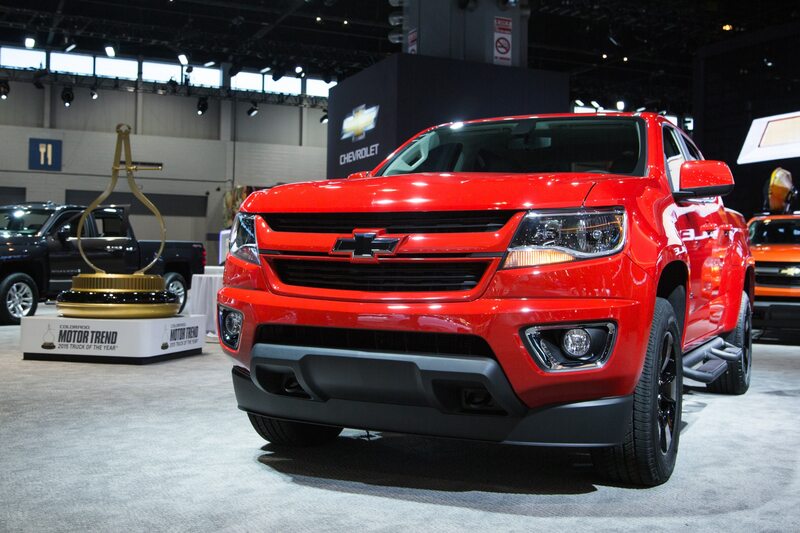 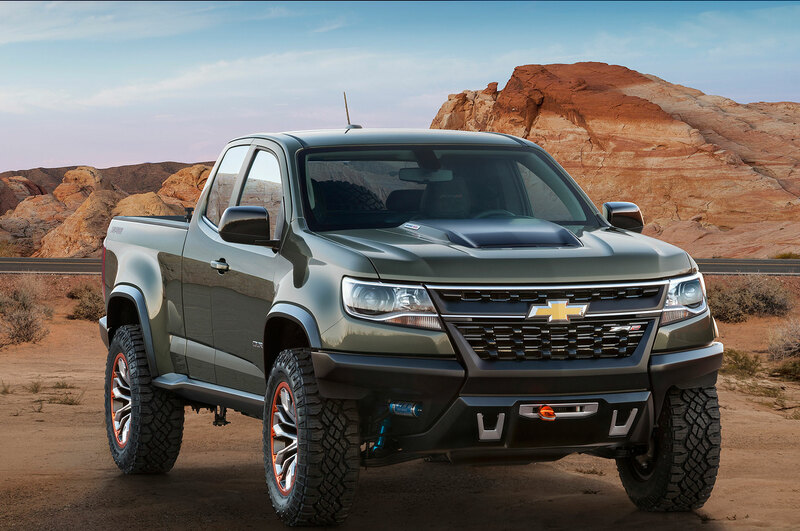 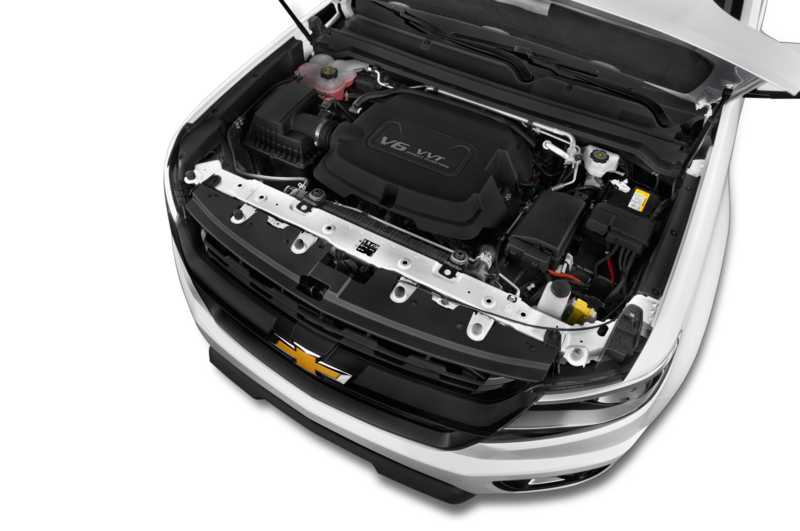 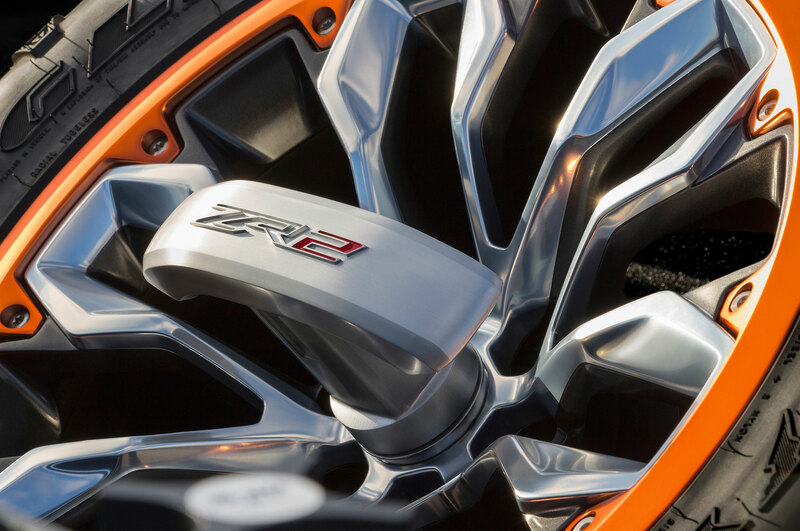 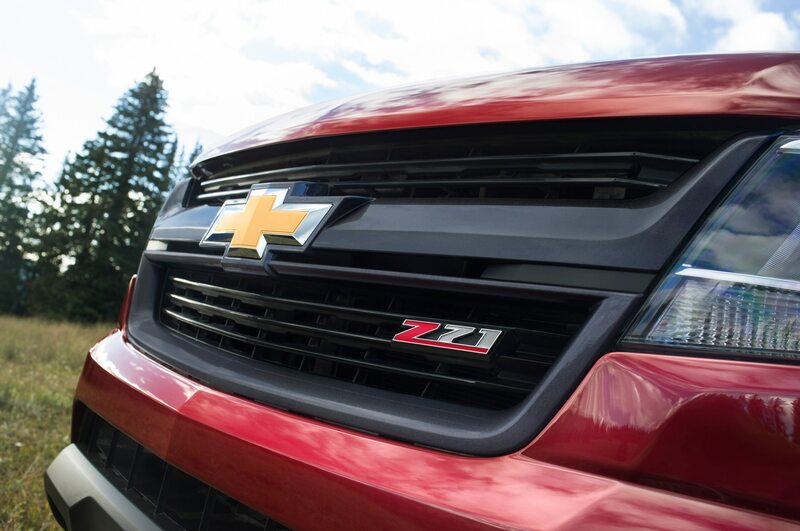 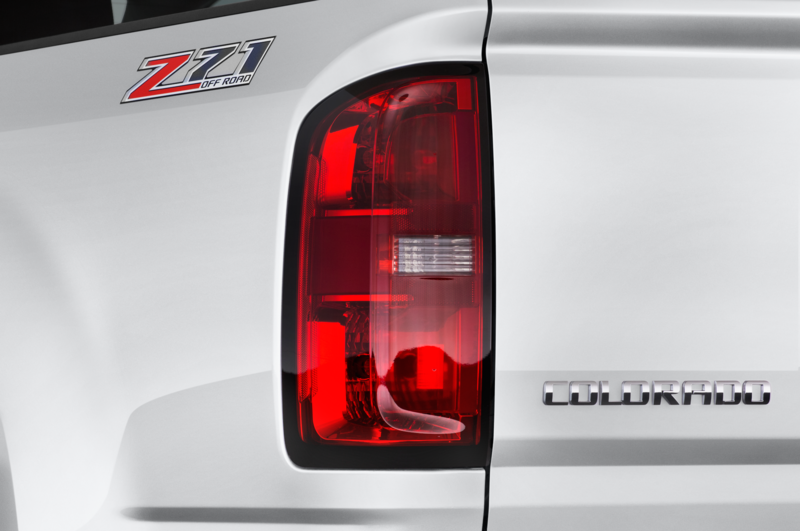 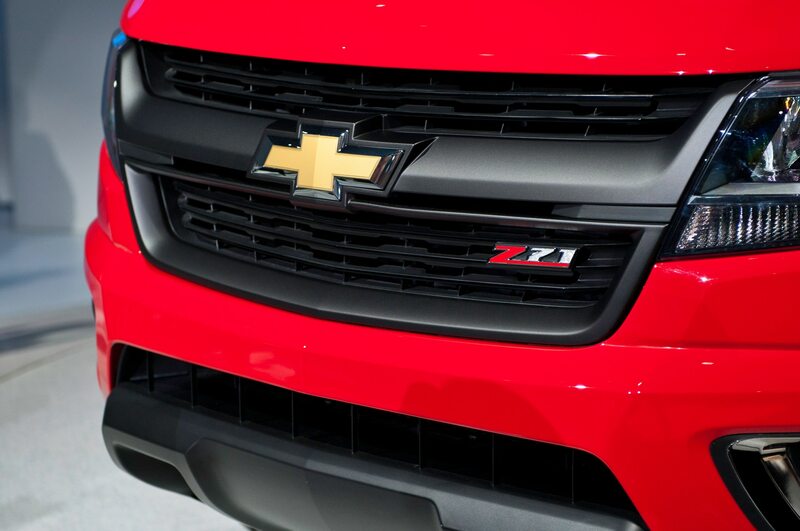 Also in that 2016 model year, Chevrolet and GMC will offer a 2.8L Duramax four-cylinder turbodiesel in their Colorado and Canyon, though these should be pretty close in price to a base Silverado or Sierra. 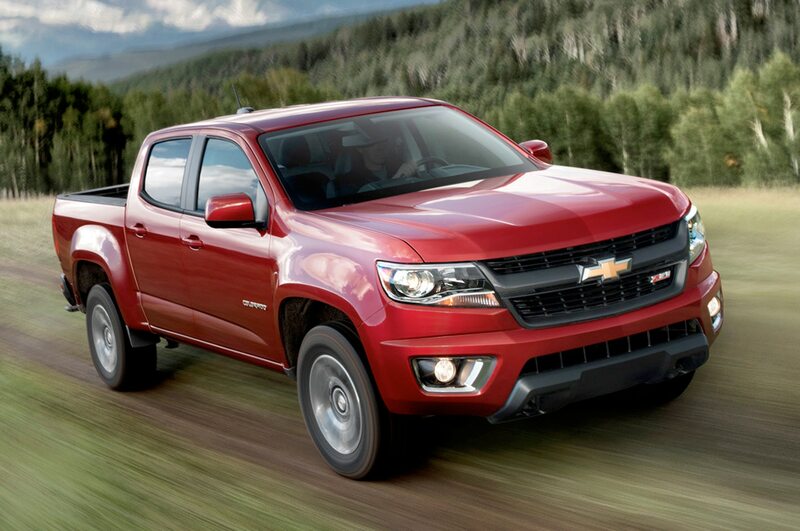 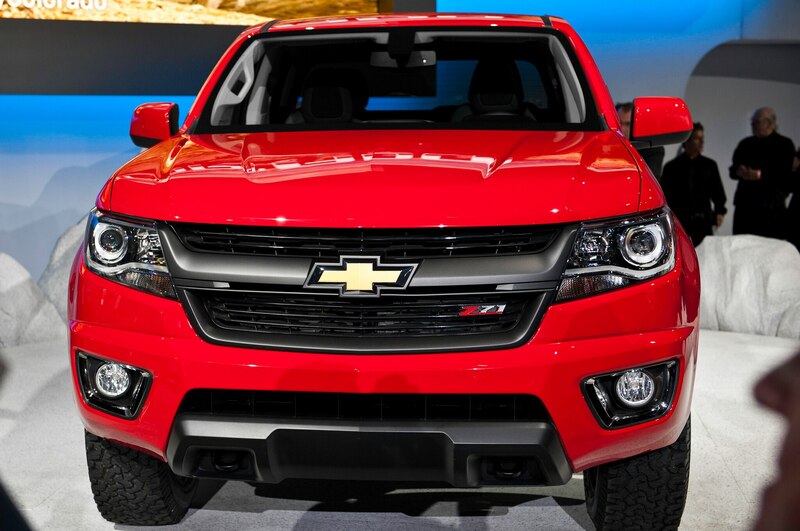 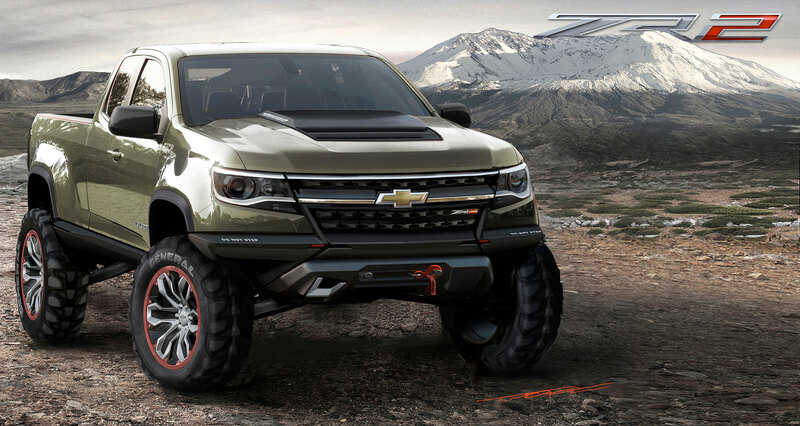 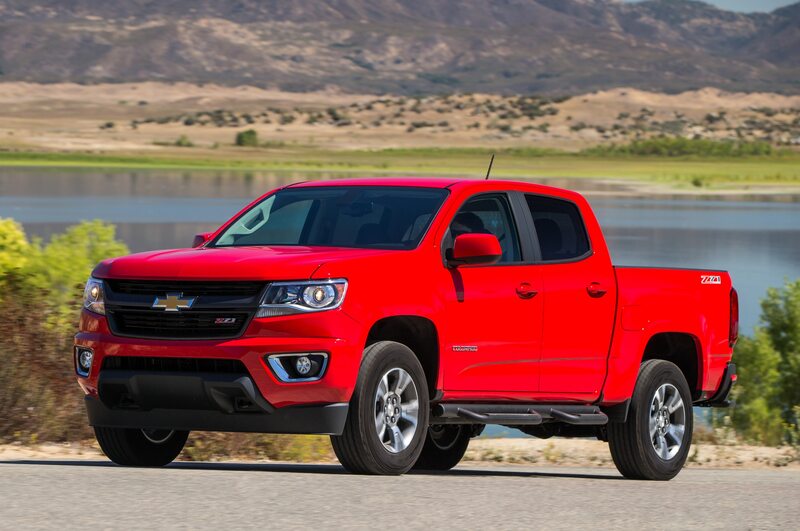 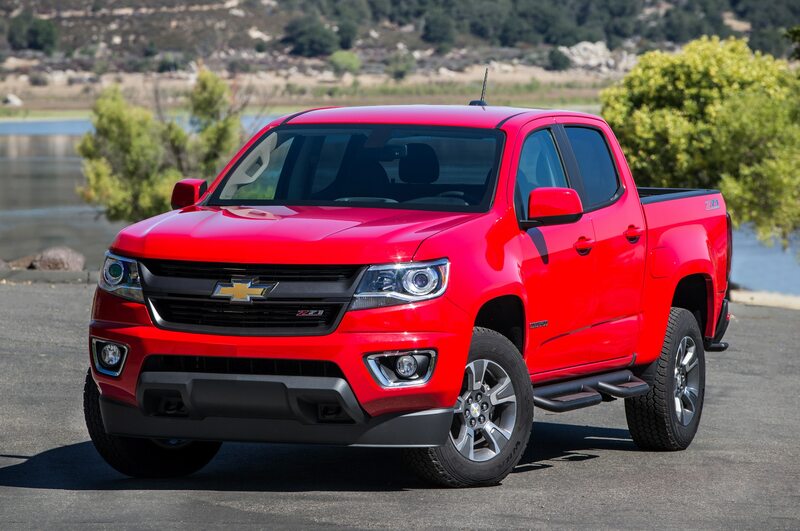 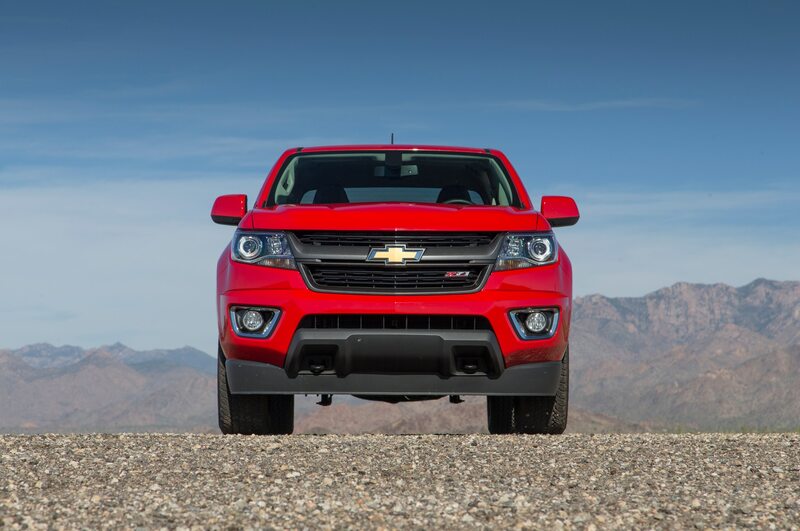 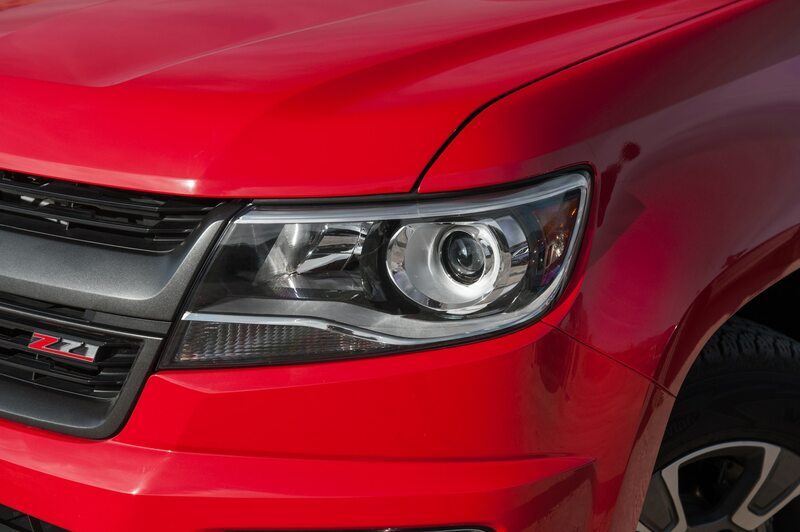 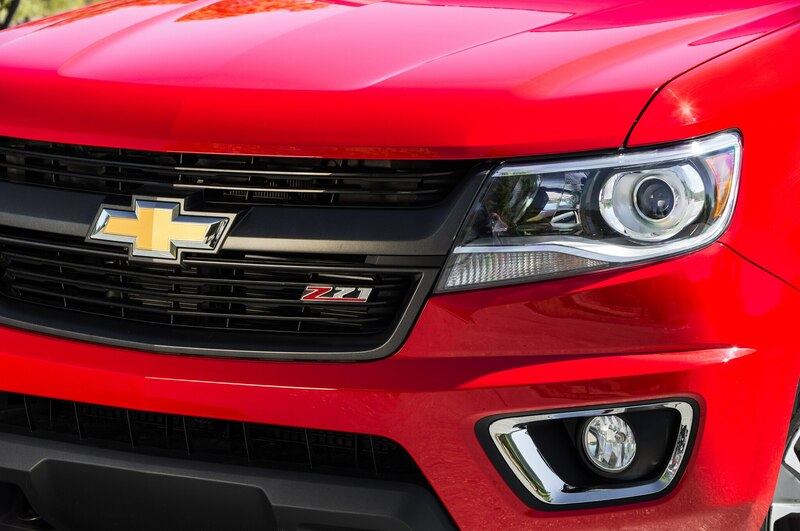 Suffice it to say we’re skeptical about the sales viability of the new Chevy Colorado and GMC Canyon. 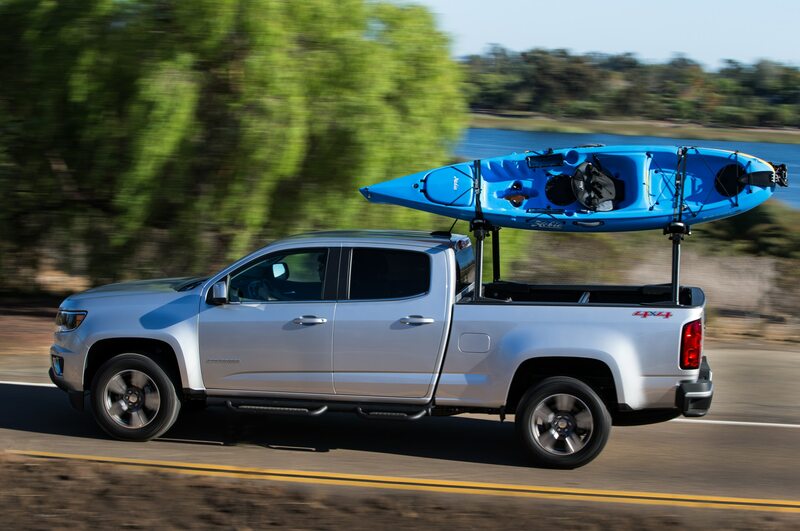 For non-truck people like us who might need the cargo or towing capacity, these two are the best alternatives to bulky, hard-to-maneuver rigs that take up too much space in your driveway. 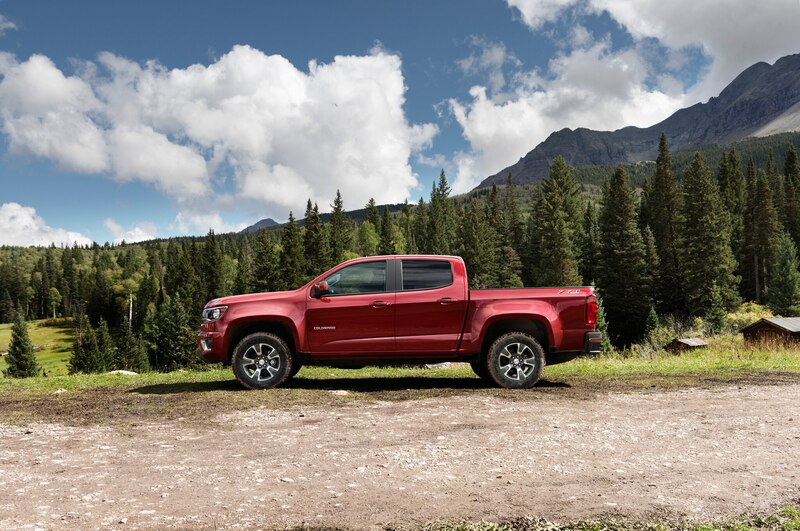 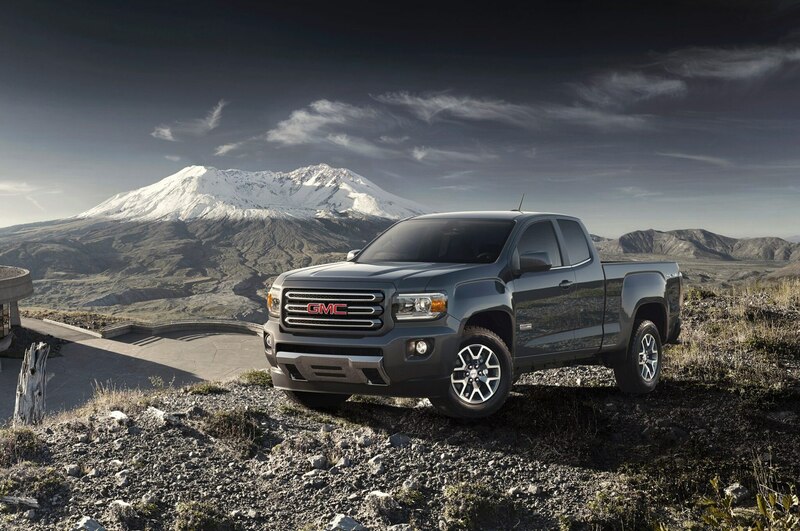 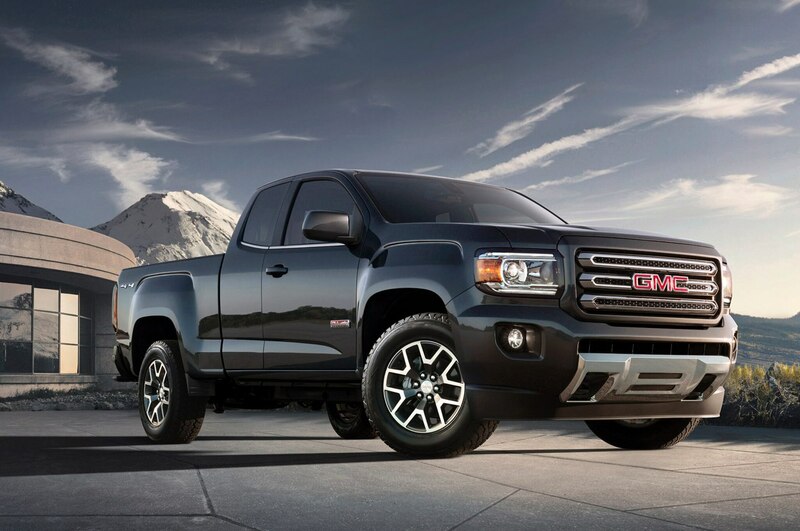 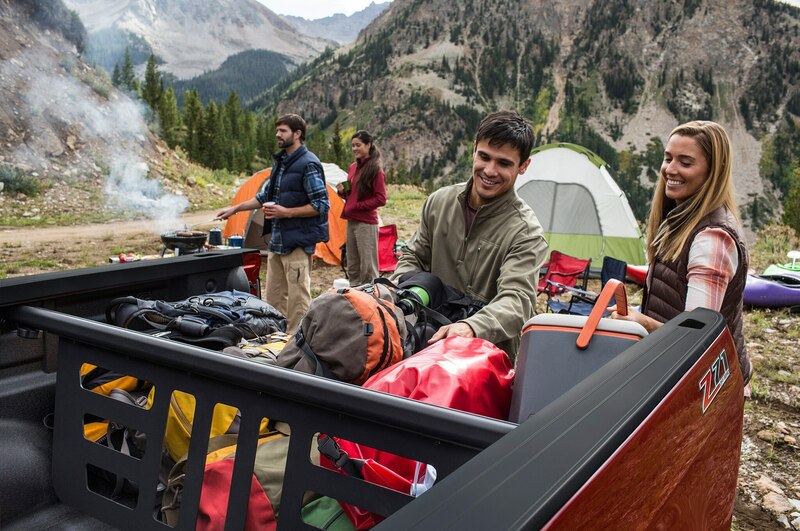 The ride, handling, refinement, interior comfort and quality, and features of the Colorado and Canyon don’t give up much to the Chevy Silverado, GMC Sierra, Ford F-150 and Ram 1500. 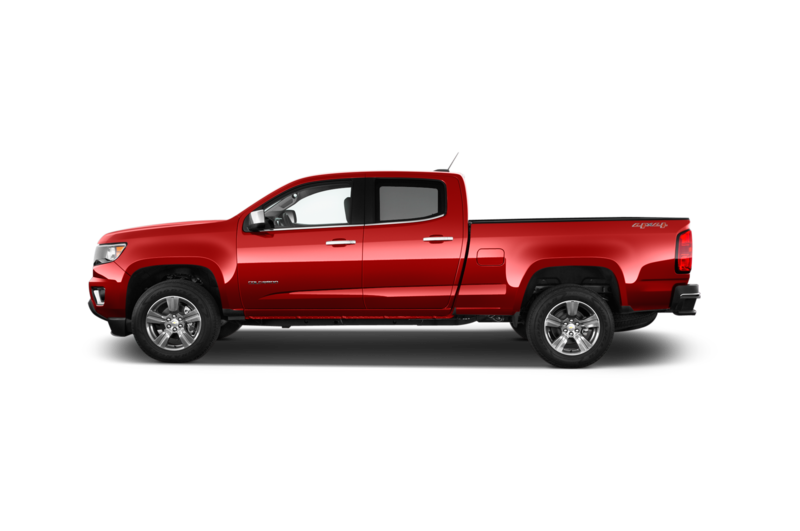 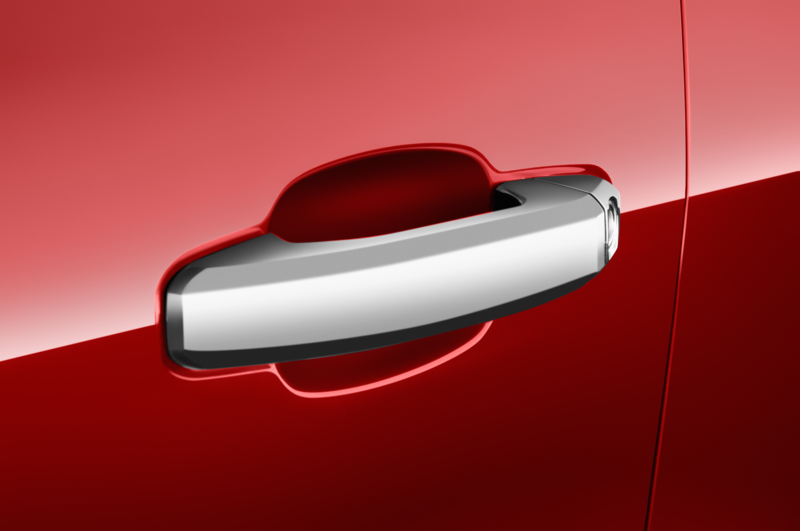 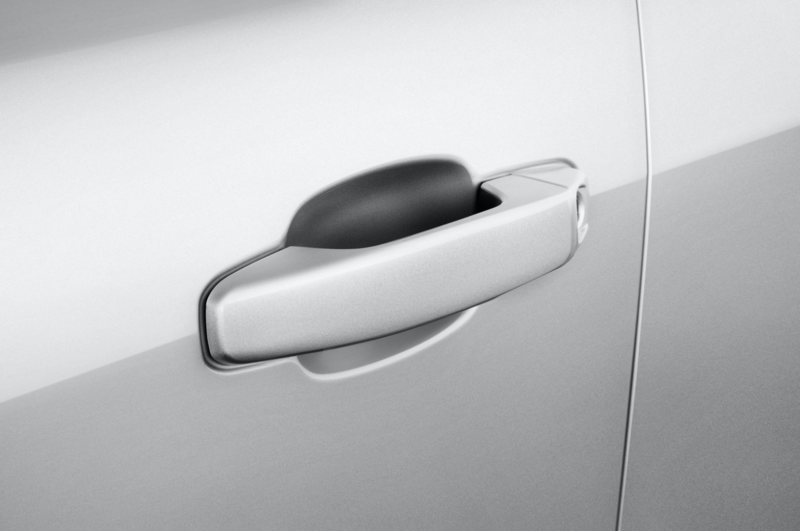 Neither truck is offered in a standard cab configuration, which is going the way of the midsize two-door coupe anyway. 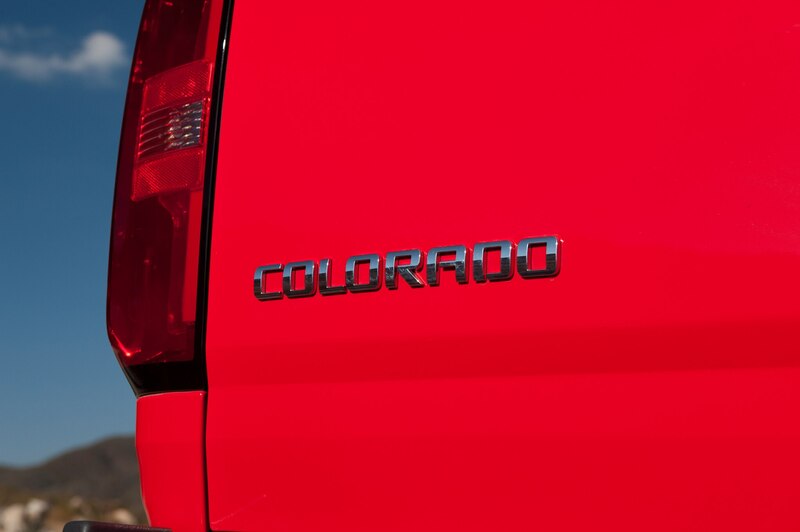 Our first drive consisted of laps around the Milford Proving Grounds in a variety of extended- and crew-cab Colorados and Canyons, most of them equipped with the 3.6L V-6 and six-speed automatic. 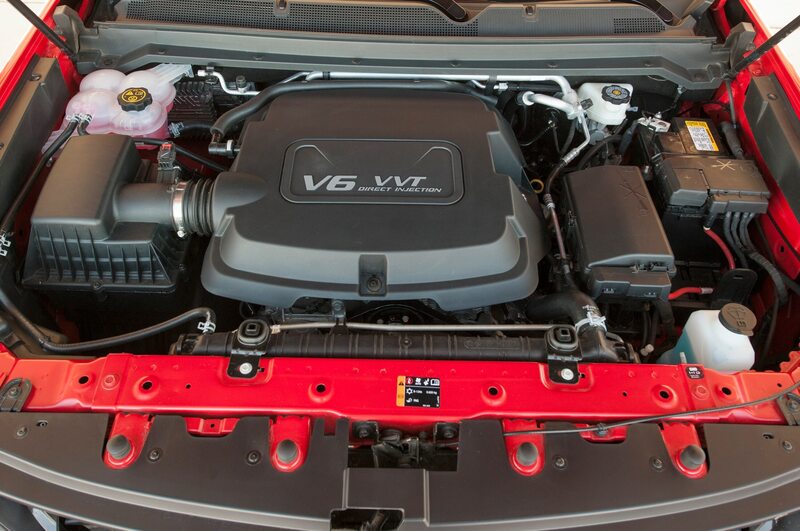 We also drove the car enthusiasts’ special: a Canyon with the base 2.5-liter I-4 and six-speed manual gearbox. 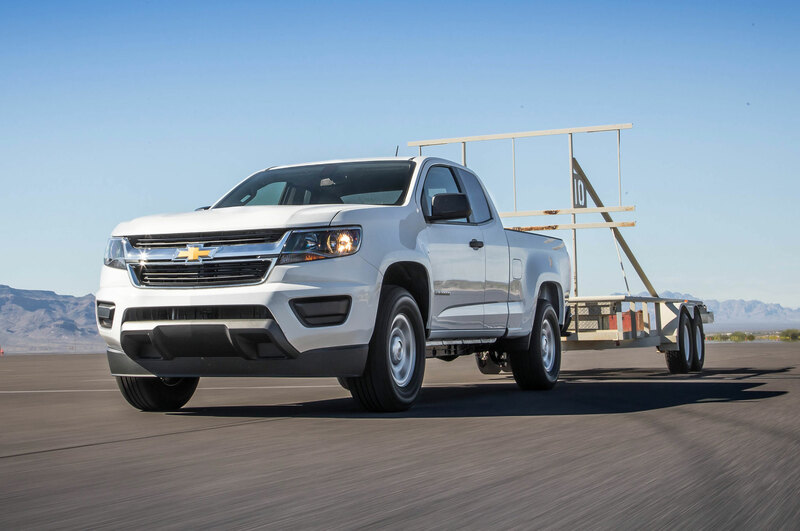 The V-6 versions are not as smooth or quiet as the old, steel-bodied 2014 Ford F-150 that GM provided for comparison, though the midsize GM trucks do have an impressively quiet idle. 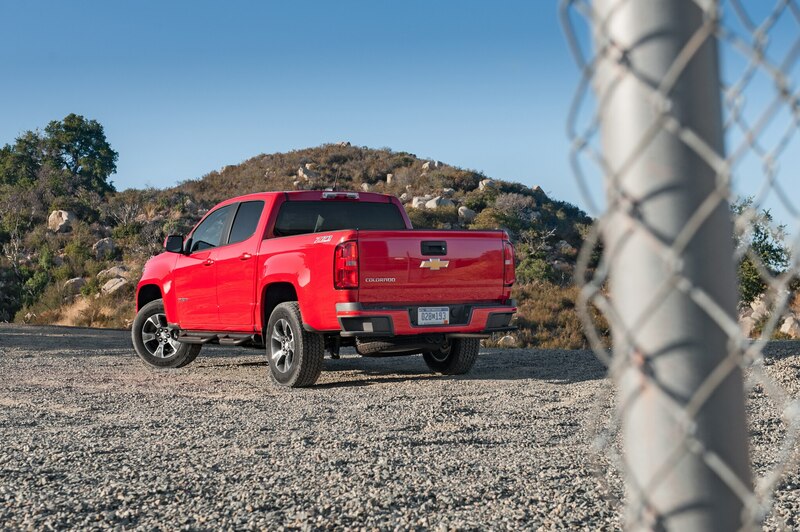 The beds were empty, of course, and not surprisingly, the four-cylinder GMC Canyon extended cab with manual, which had a rear-seat delete, had the best ride and best steering feel among the midsize GMs, because it came with the Canyon’s standard, 16-inch aluminum alloy wheels and tires instead of the 17- and 18-inchers on the better-equipped Colorados and Canyons provided for the drive. 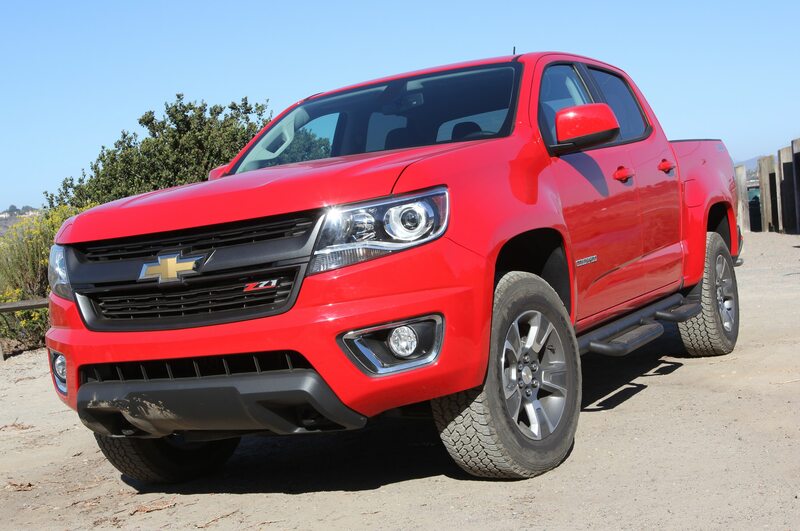 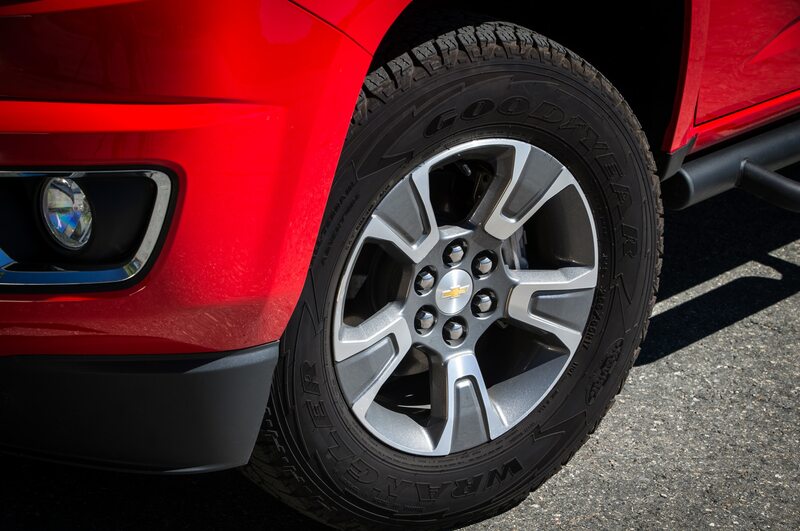 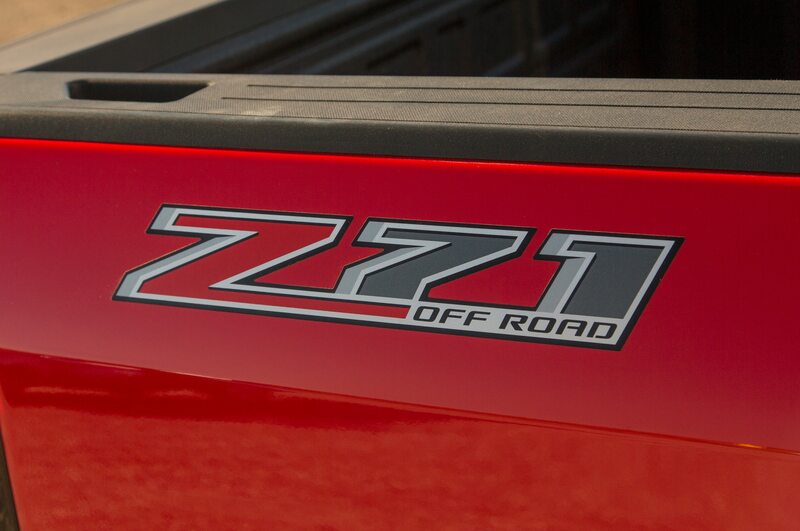 A Chevy Colorado Z71 with 17-inch off-road tires produced the ride quality you’d expect from a truck shod in serious nubbies. 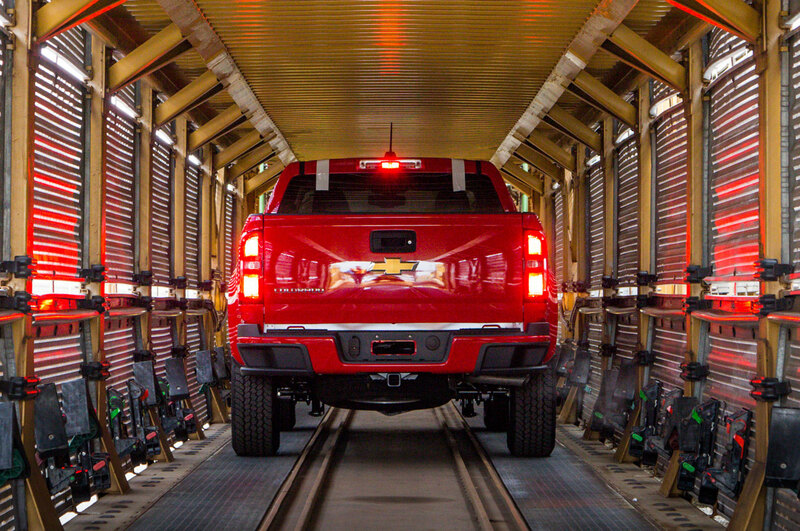 Its chassis was very busy over the Milford road course’s chatter bumps. 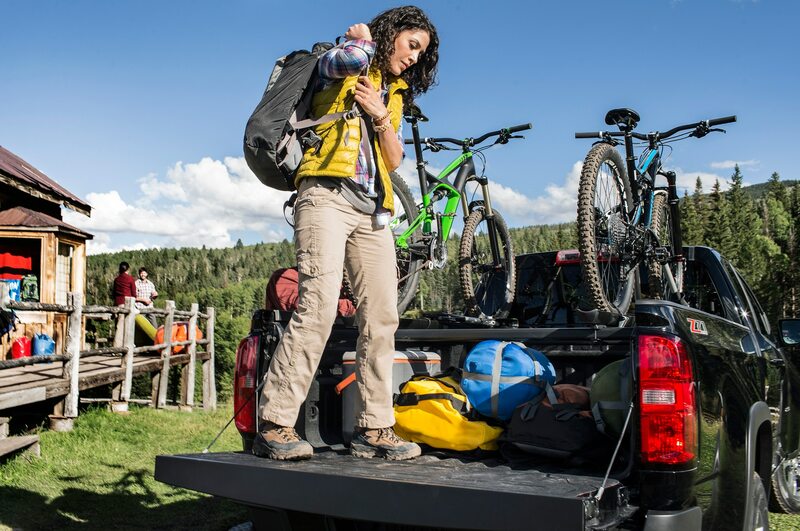 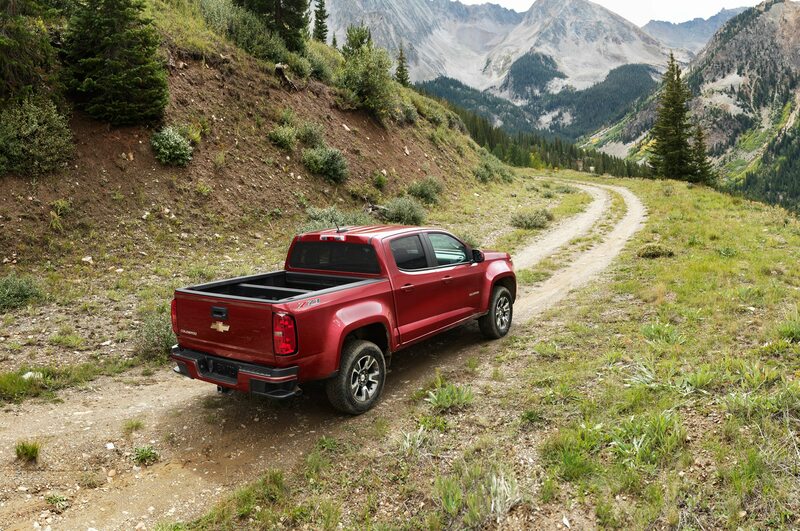 The upshot is that while no version of the Colorado/Canyon rides quite like an F-150, Ram, or Silverado/Sierra, they’re notably better than the Tacoma and Frontier and easily rival the Toyota Tundra. 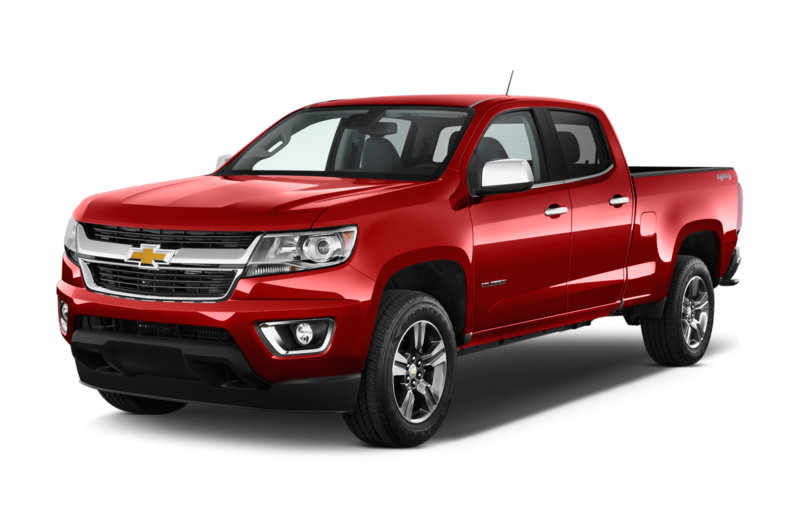 The Colorado/Canyon is notable for its damping, which keeps the body well in control over the big bumps and dips, though so much that we got a bit carried away with a 4×4 model, triggering the stability control over one of the deeper bumps. 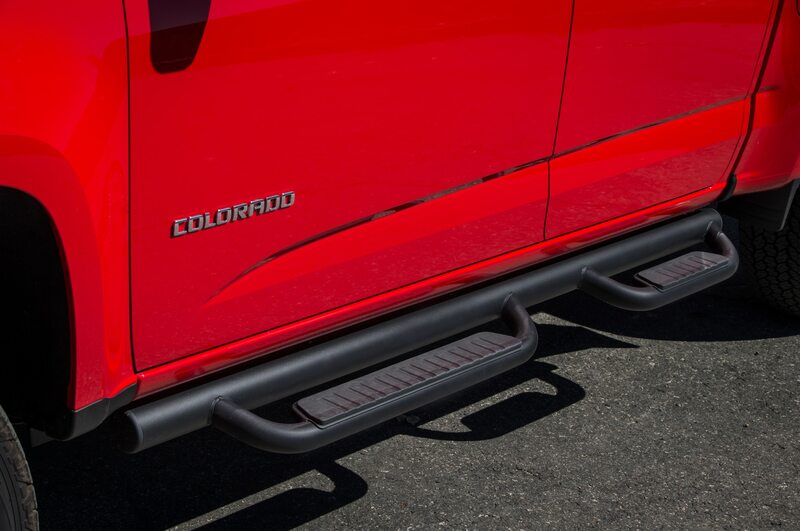 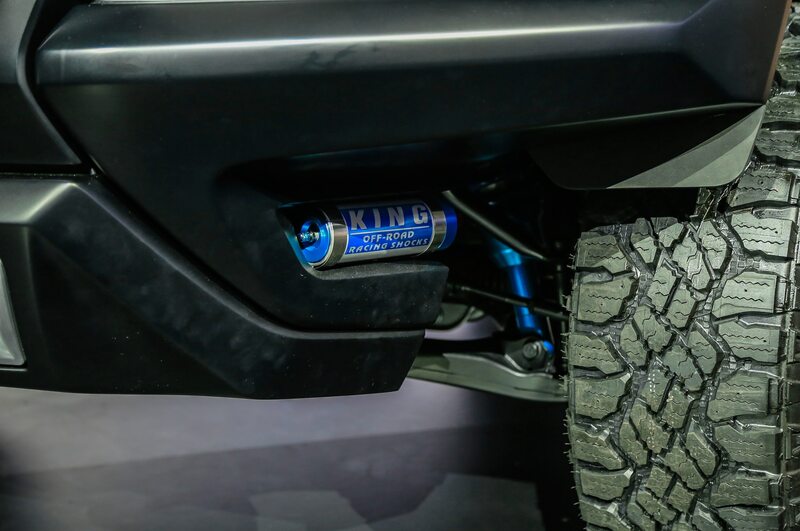 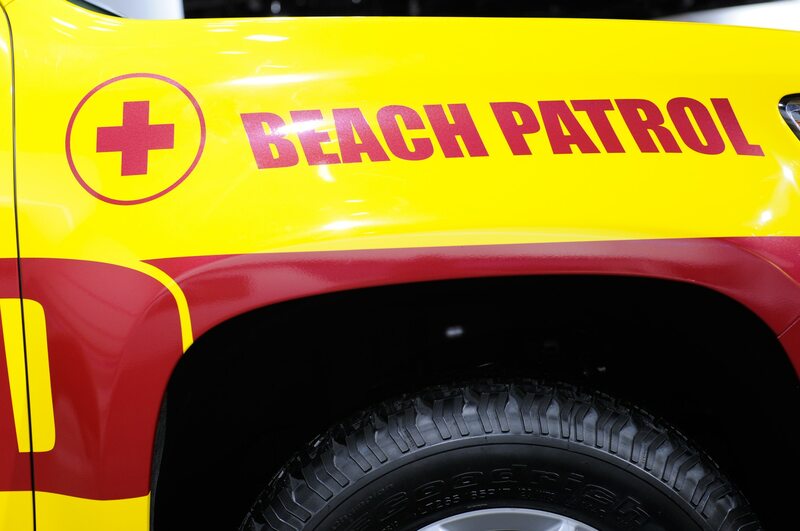 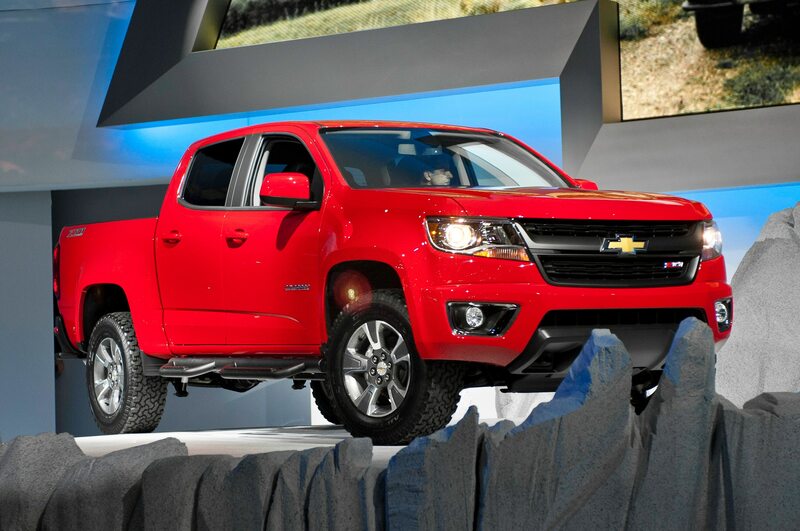 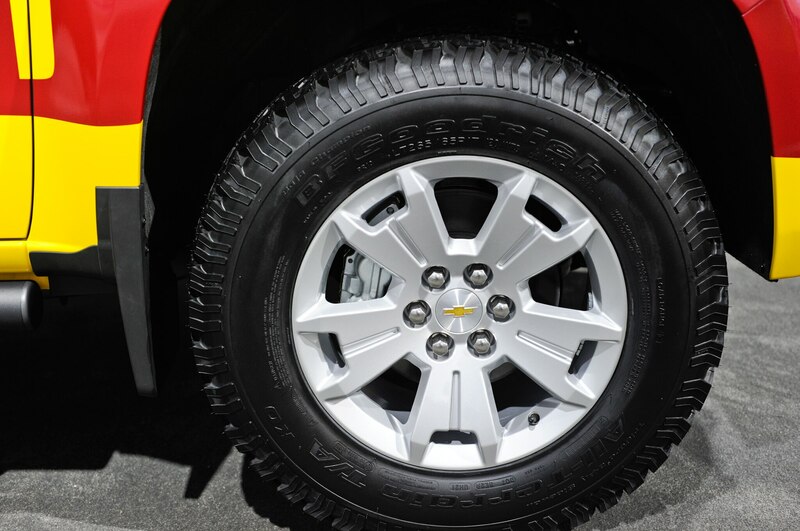 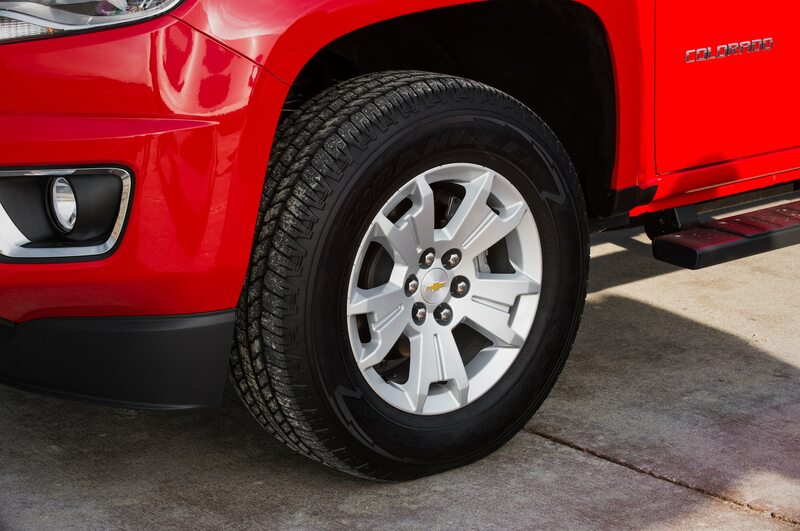 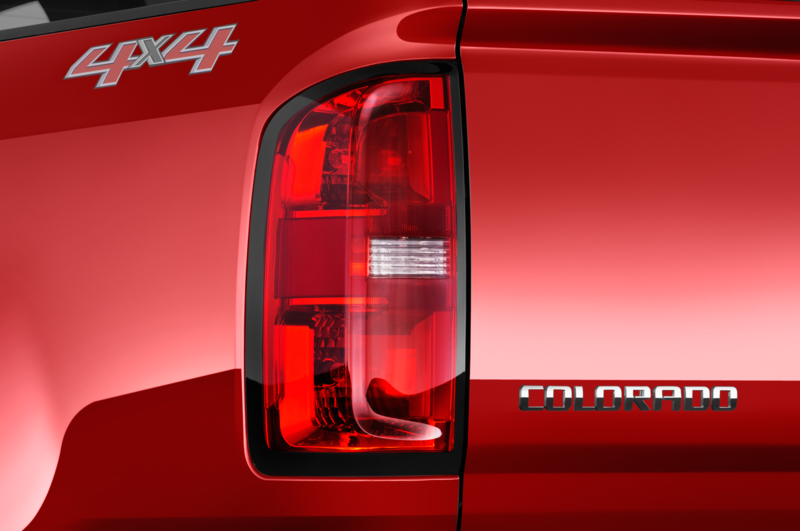 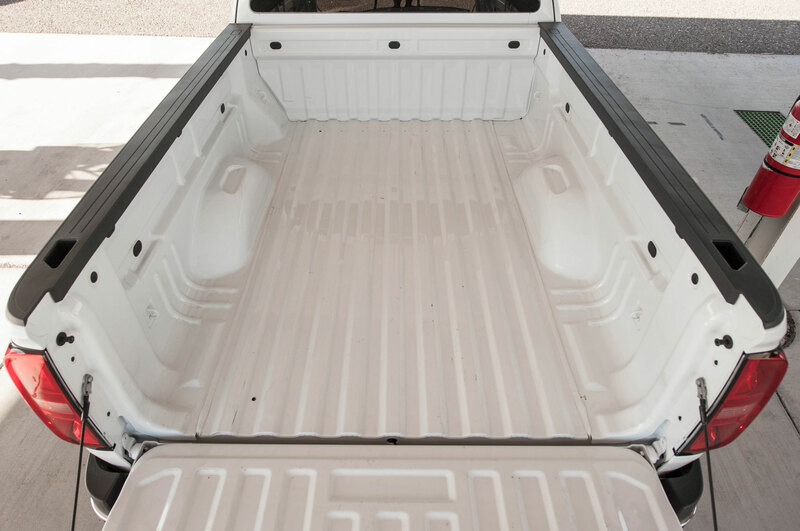 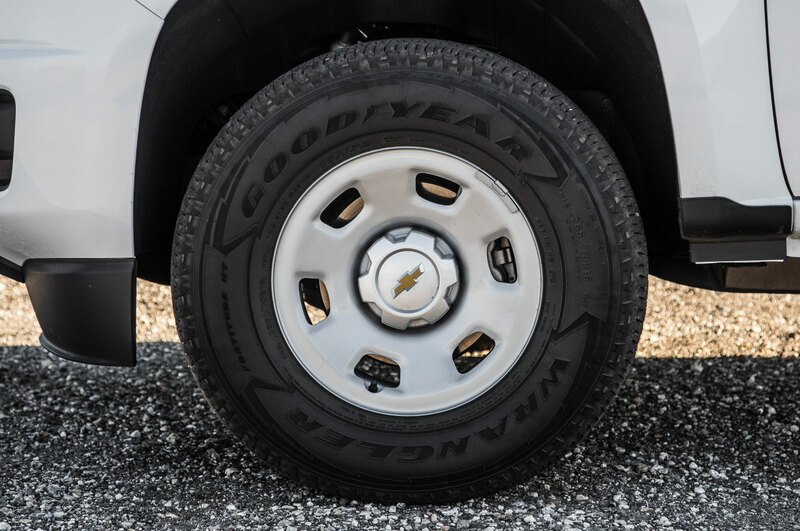 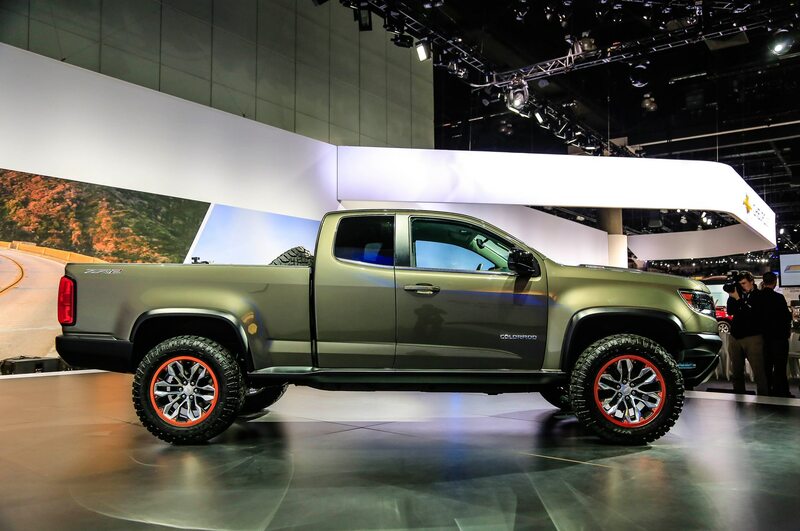 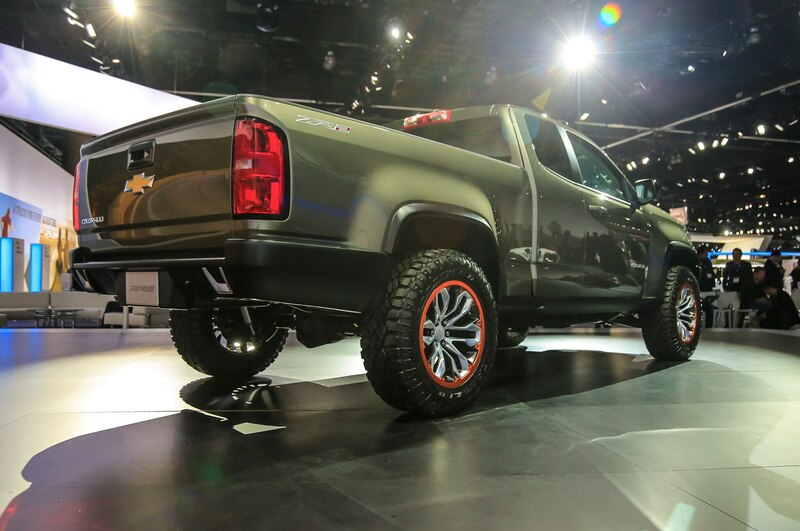 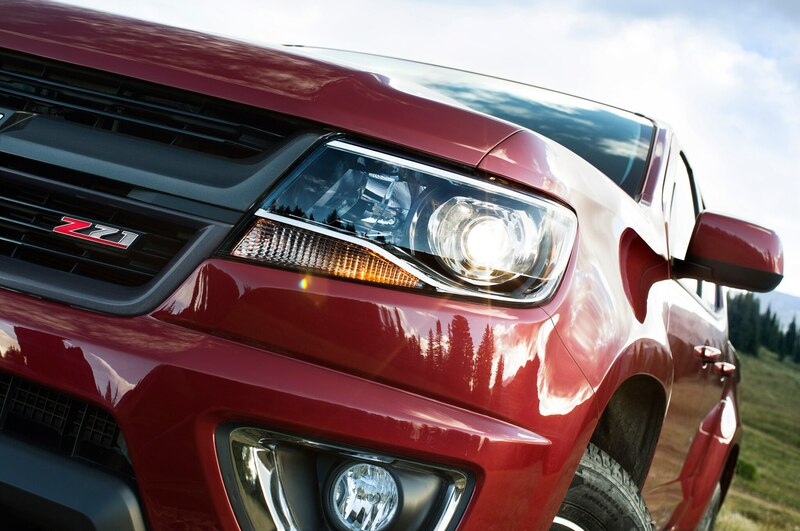 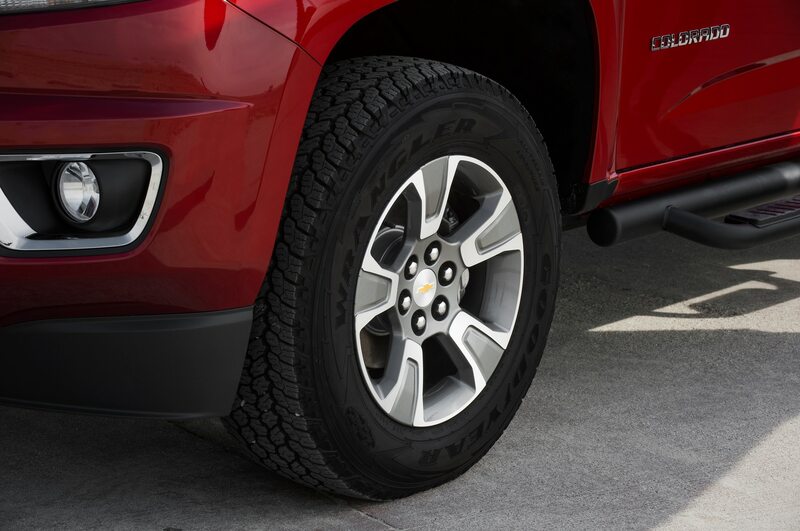 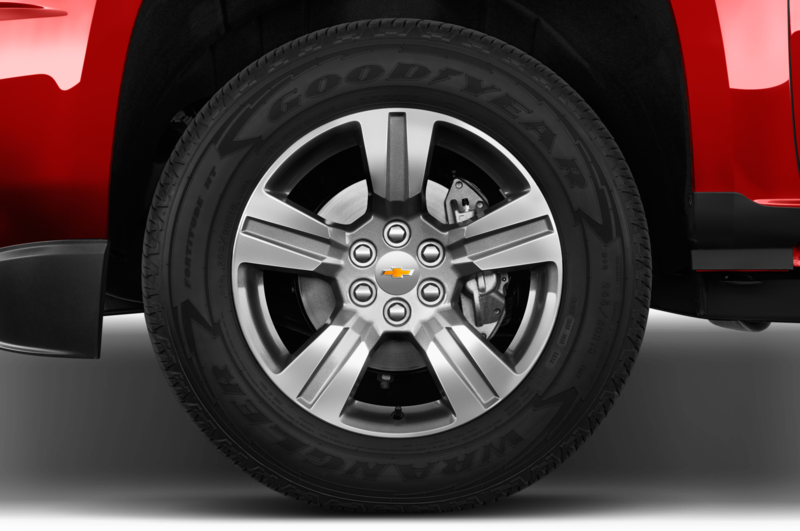 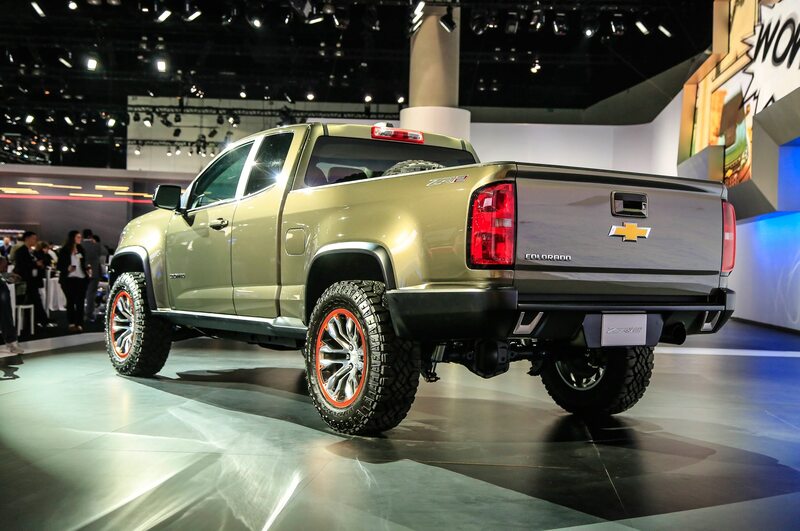 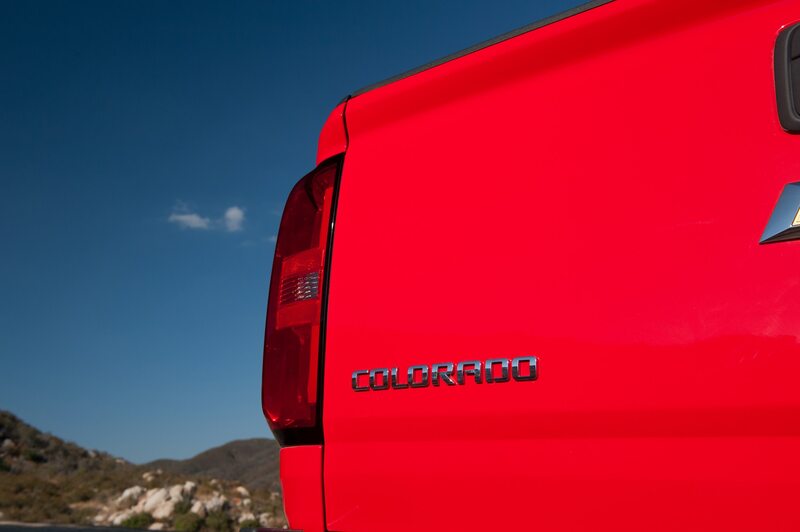 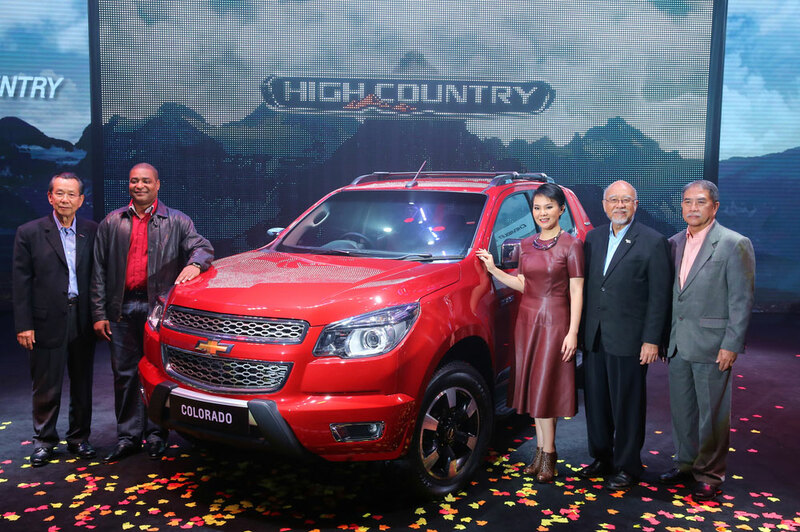 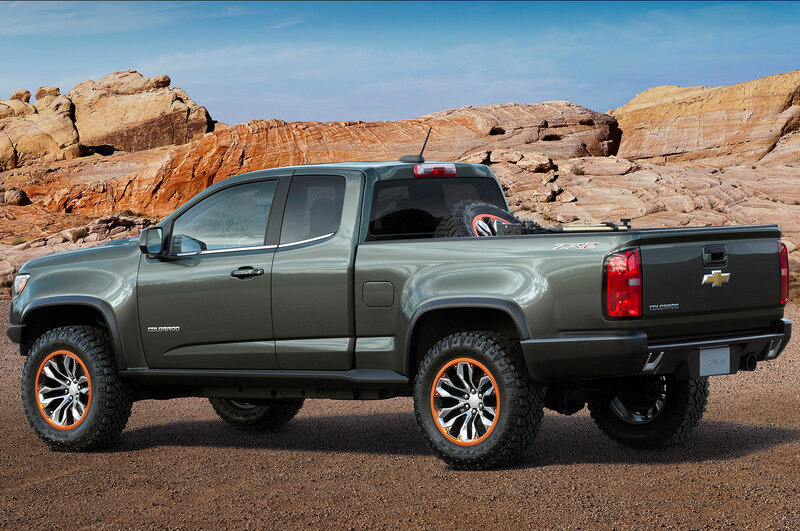 Base Colorados come with 16-inch steel wheels standard (alloys optional). 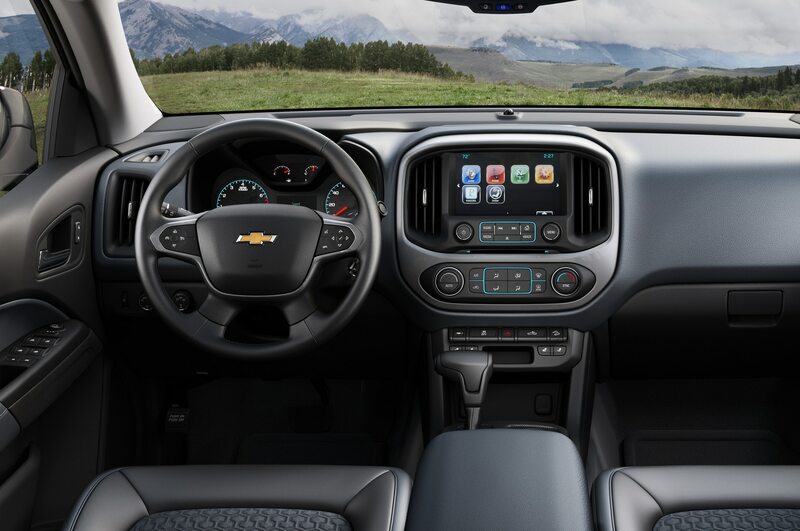 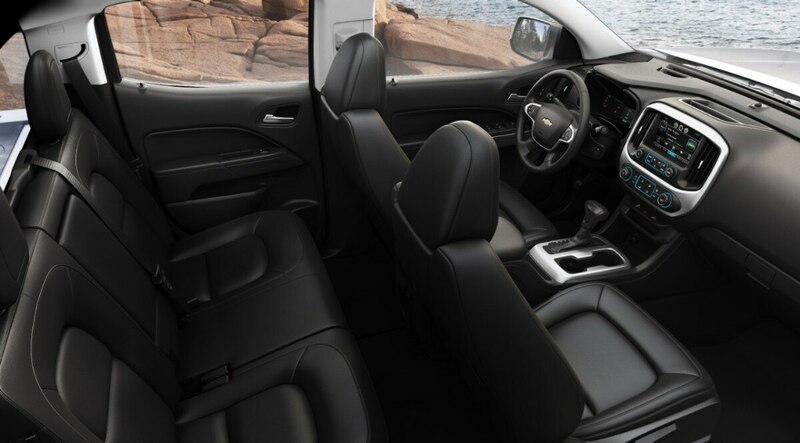 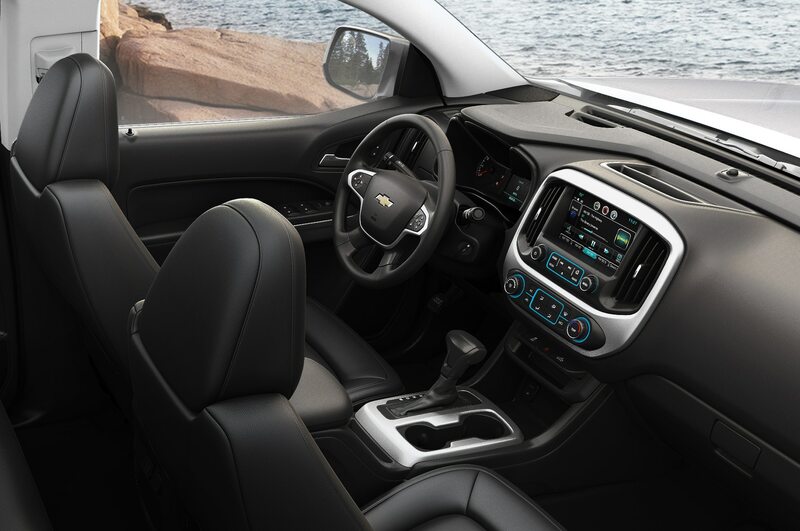 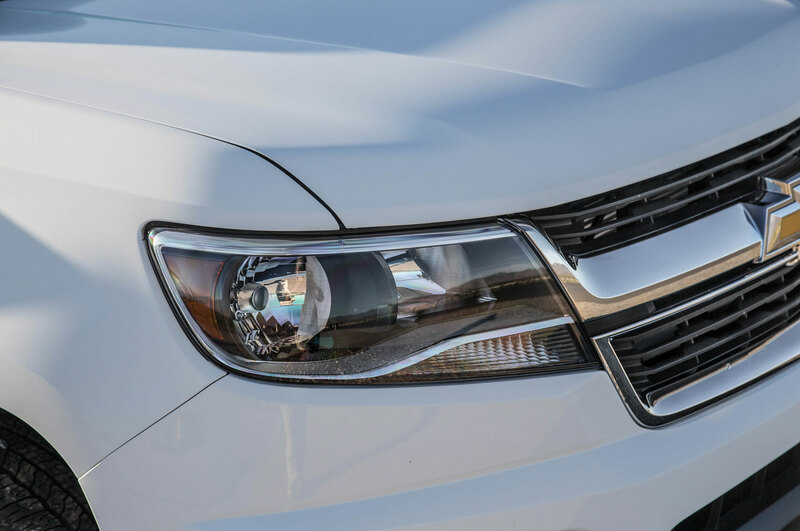 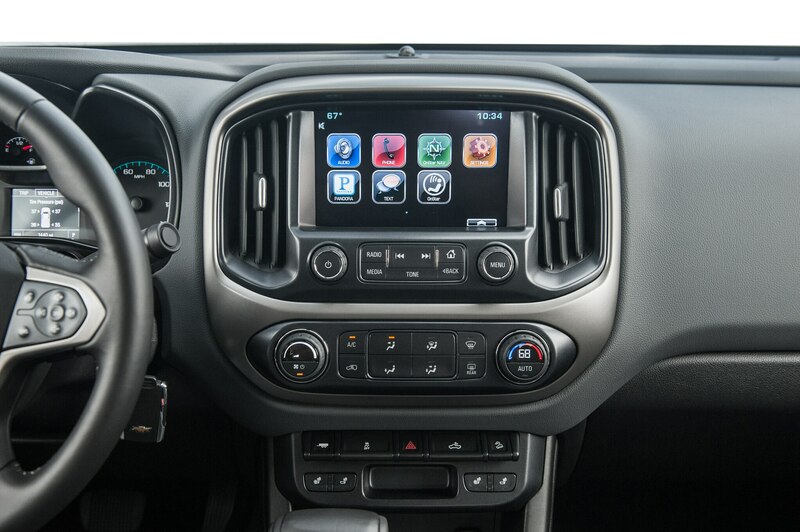 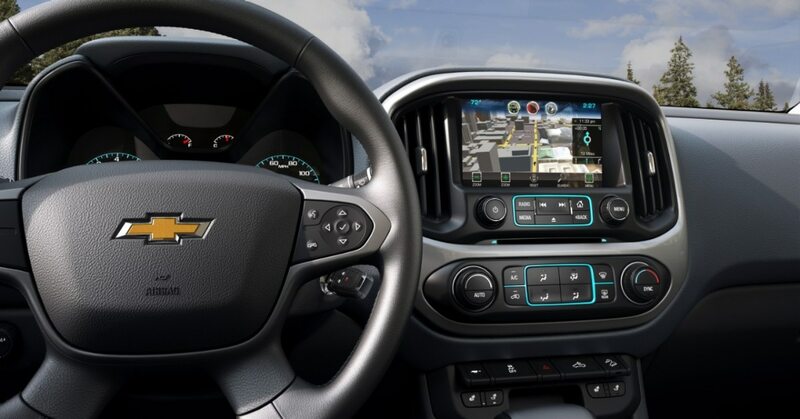 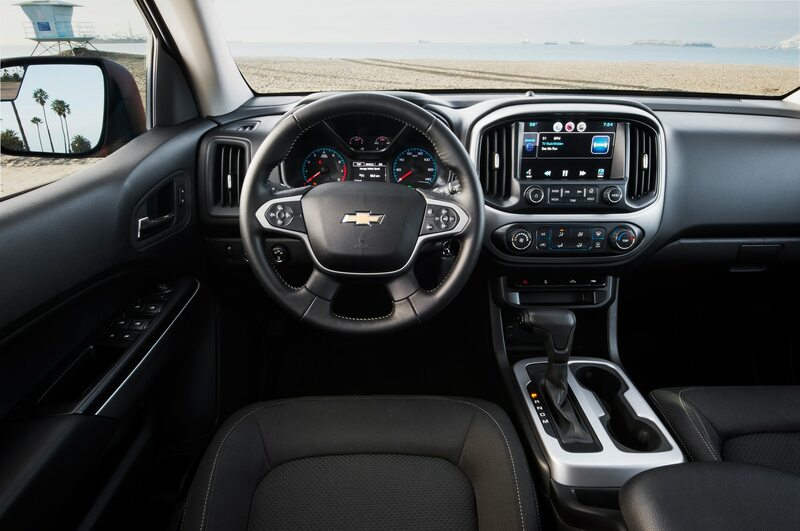 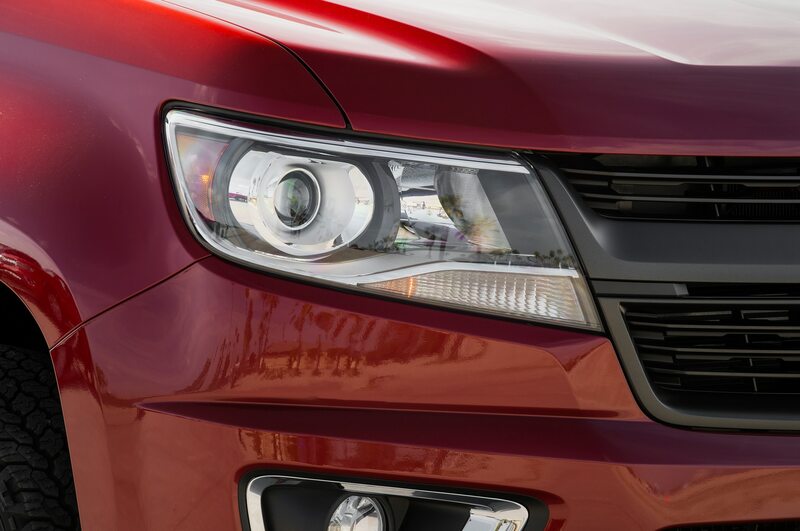 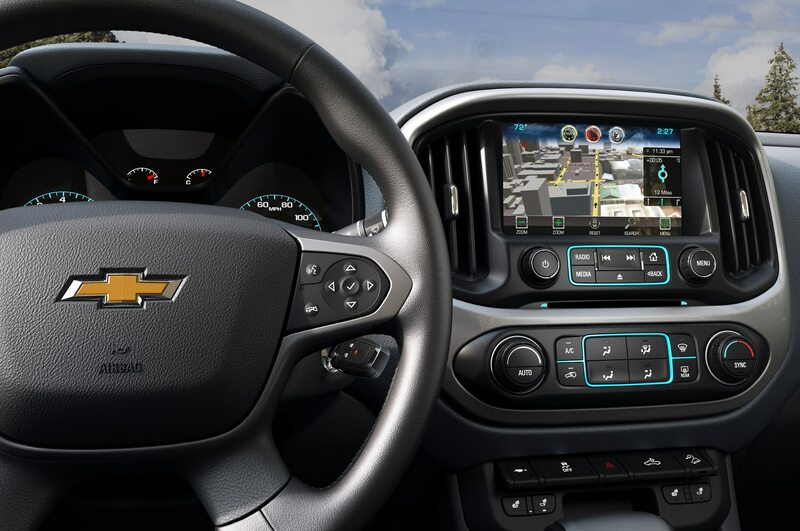 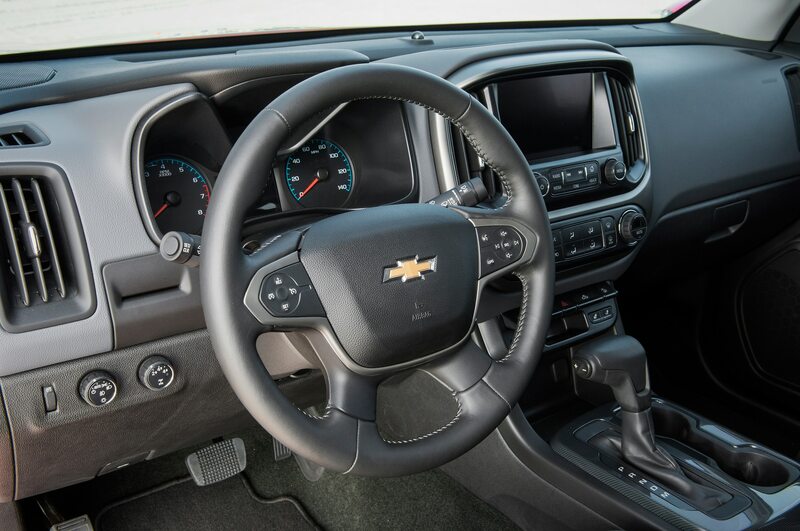 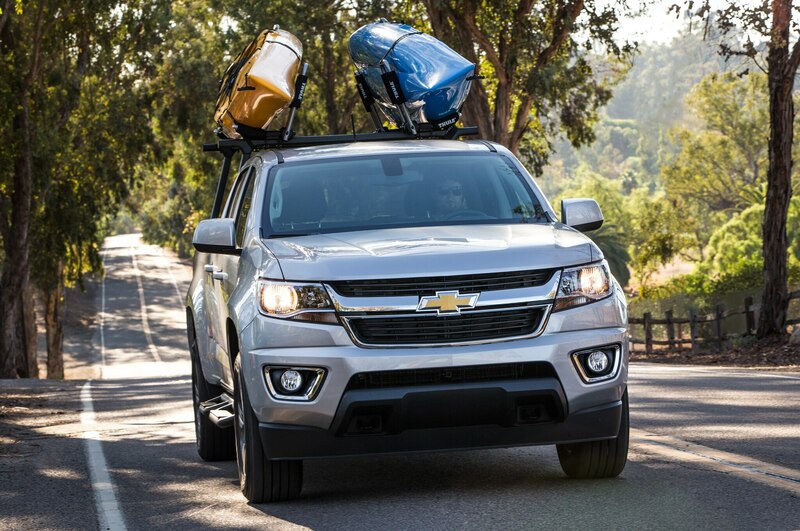 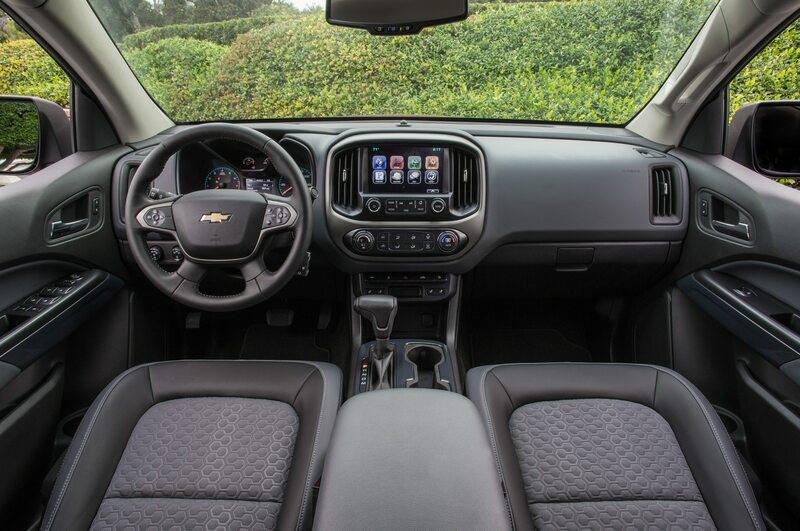 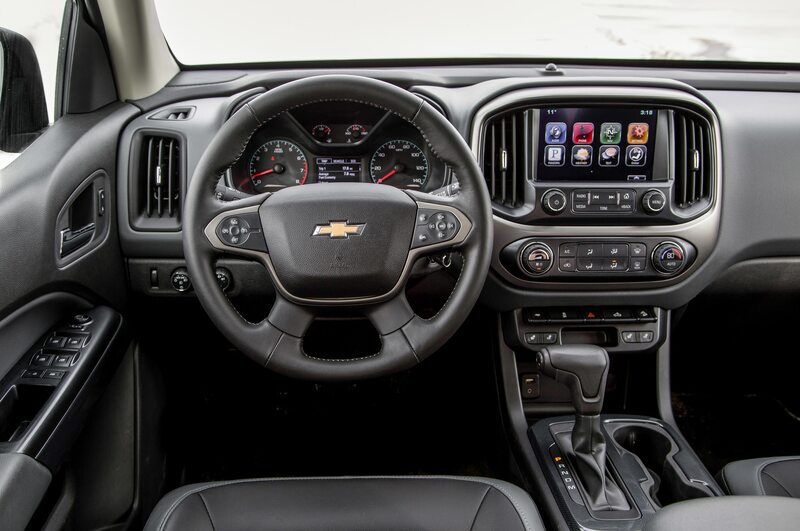 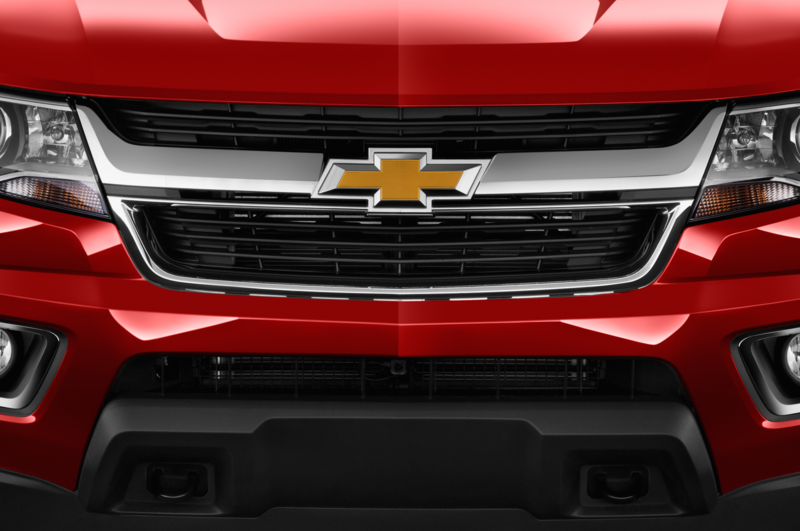 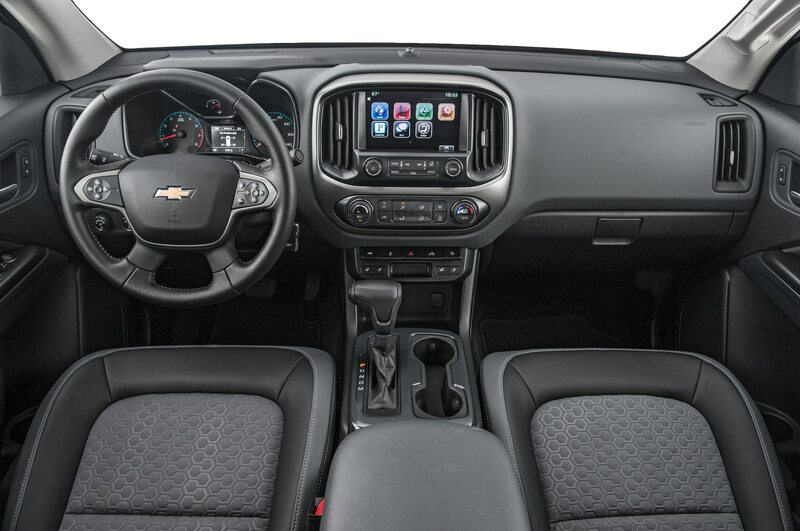 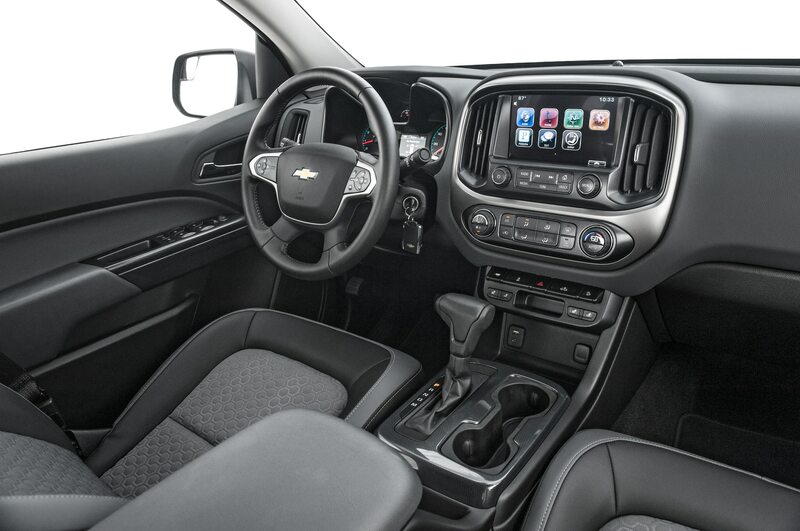 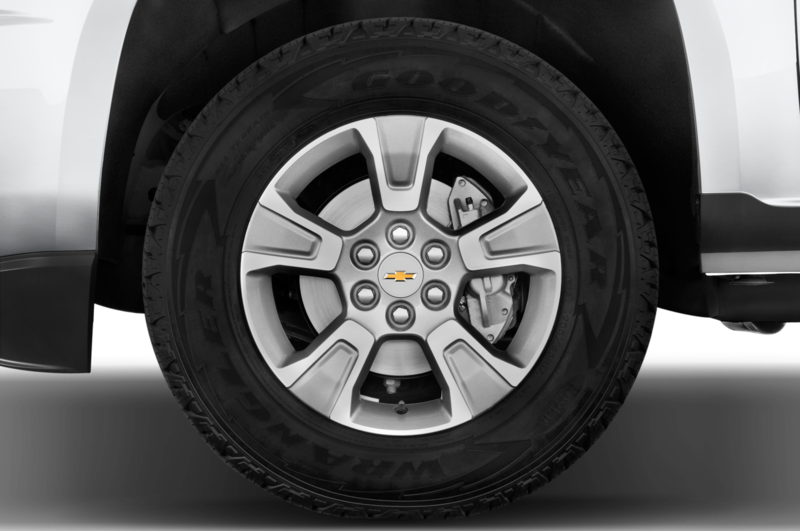 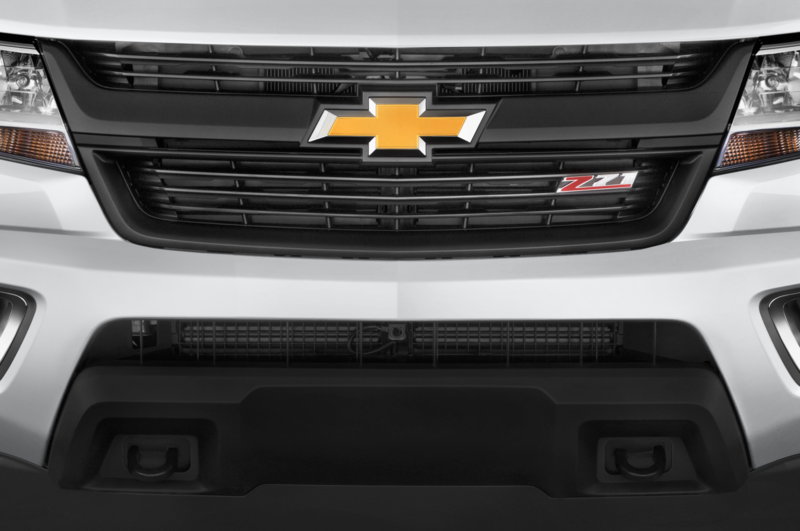 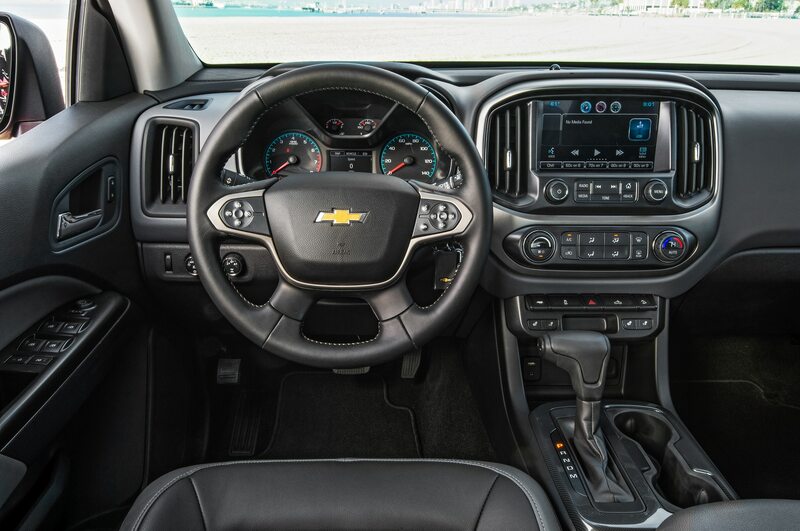 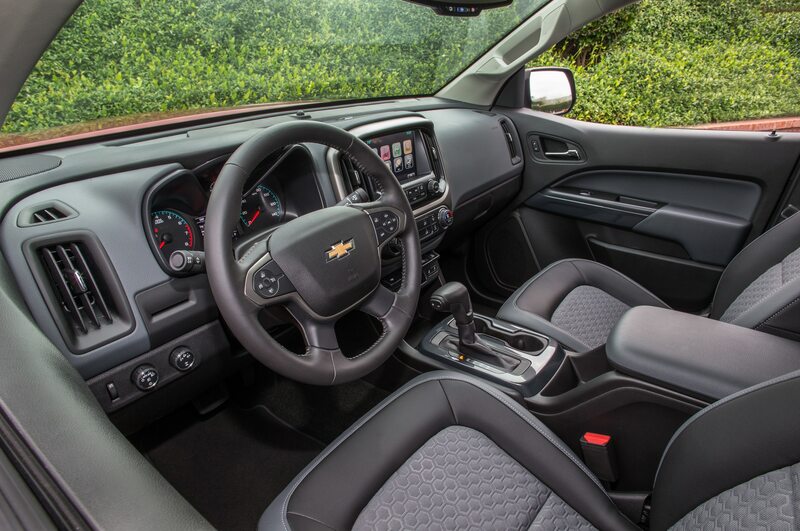 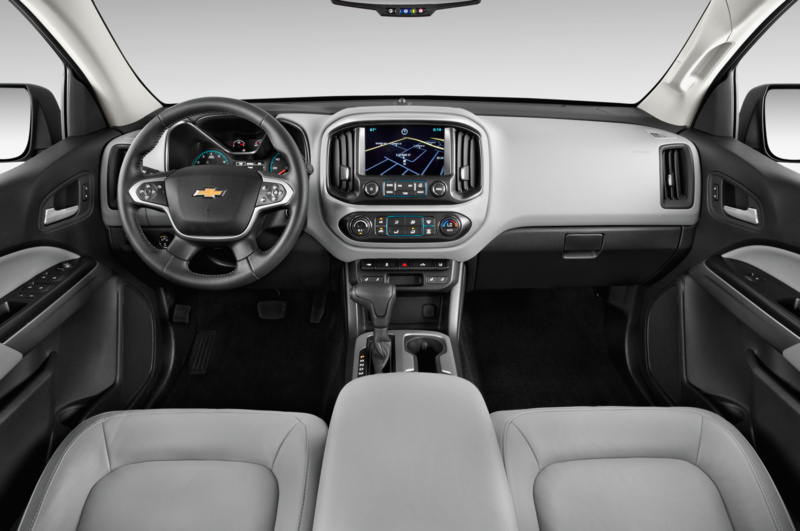 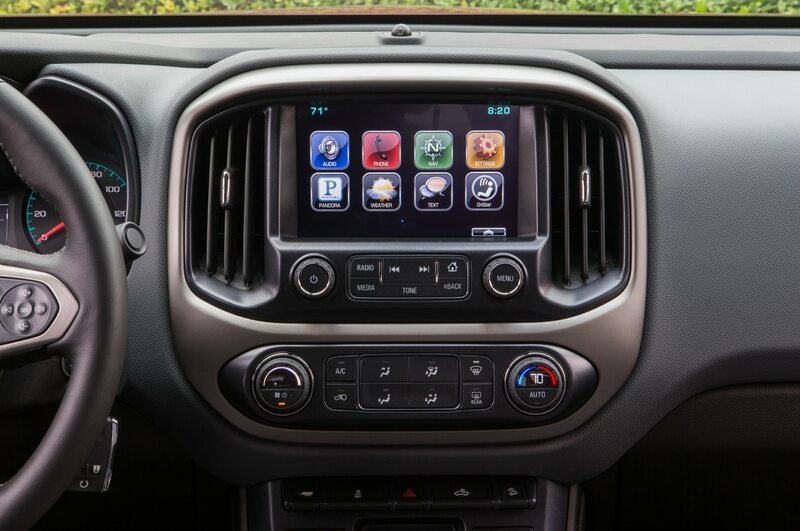 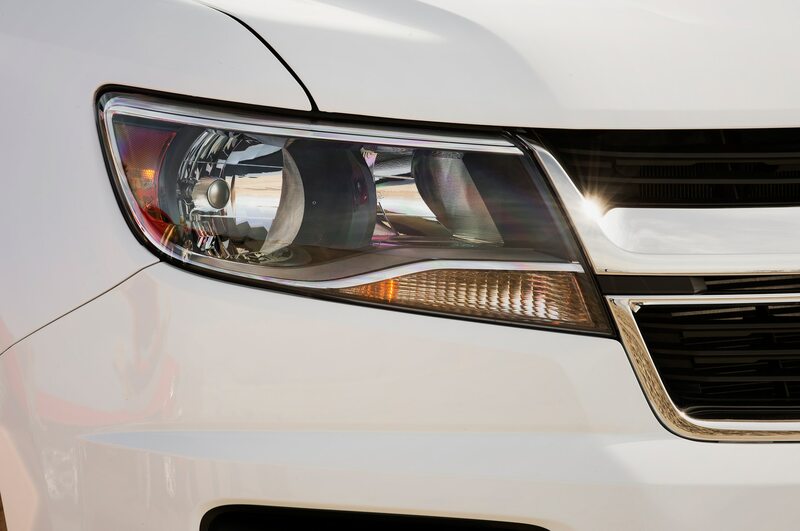 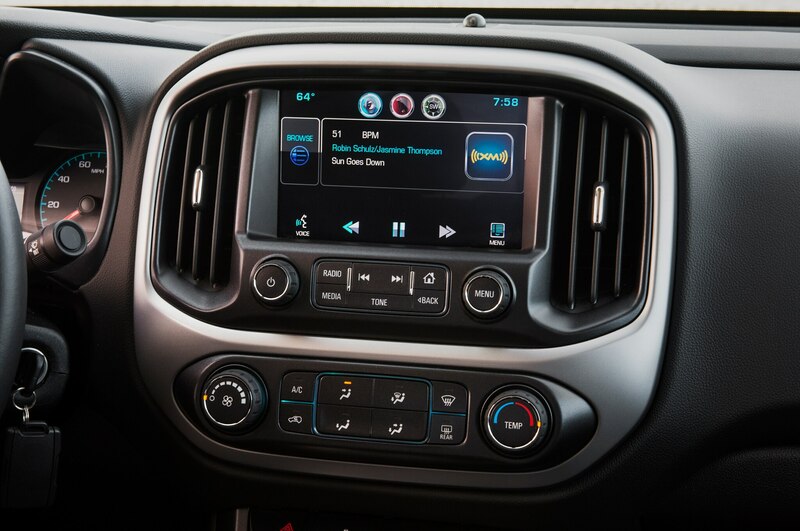 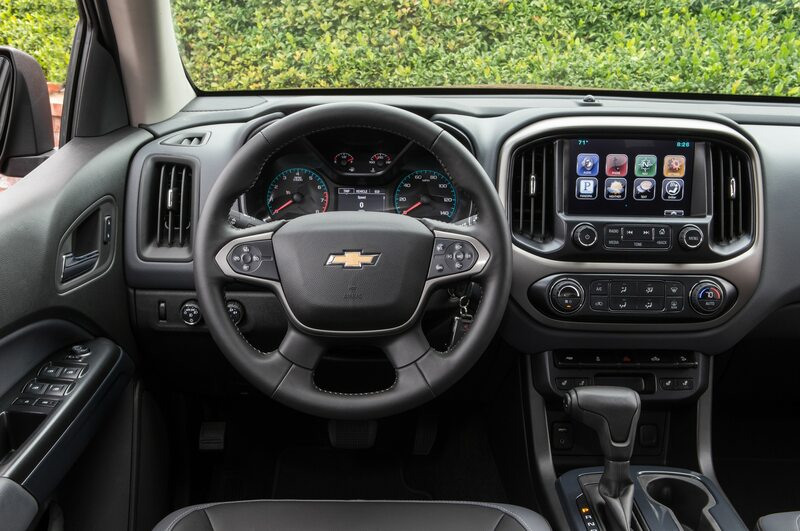 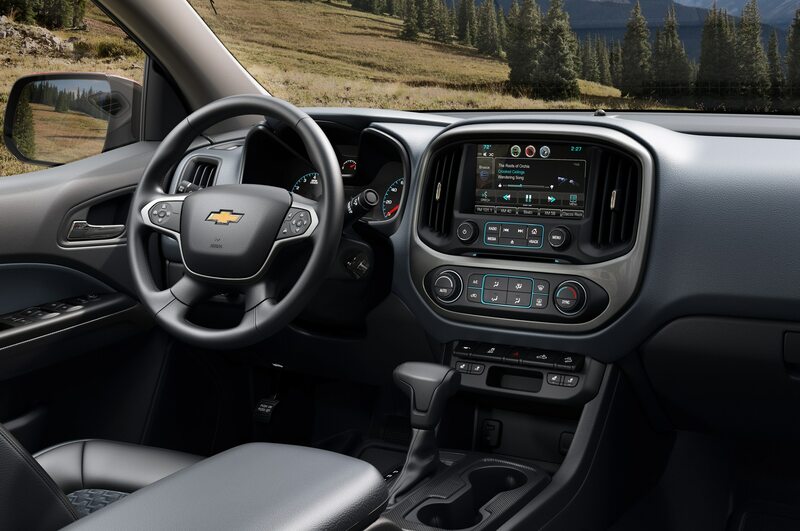 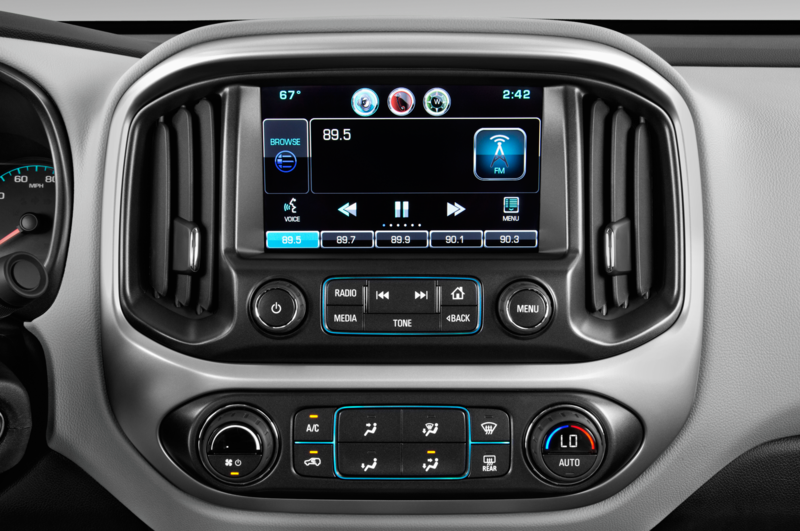 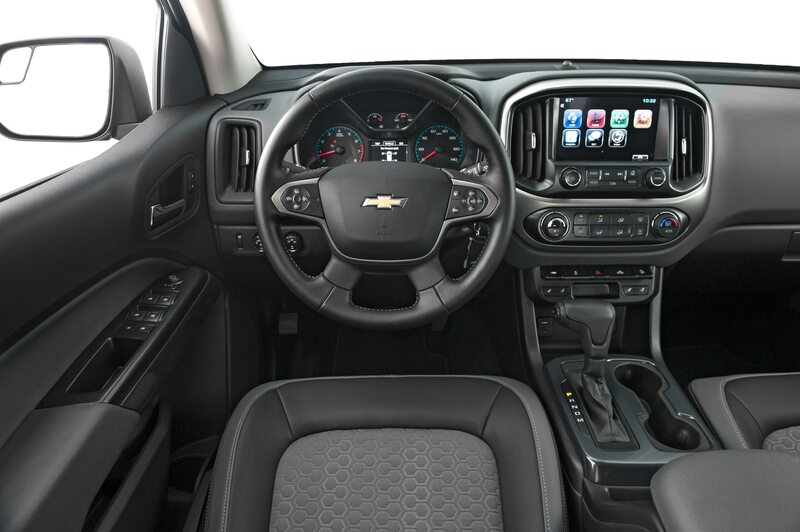 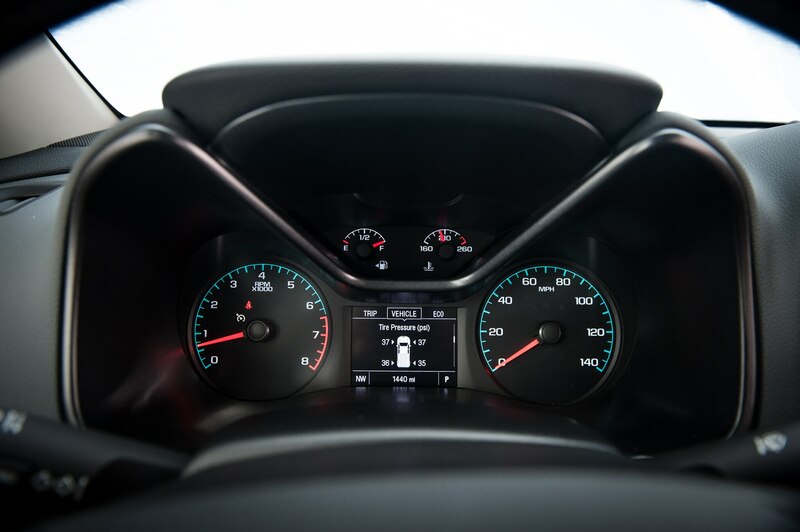 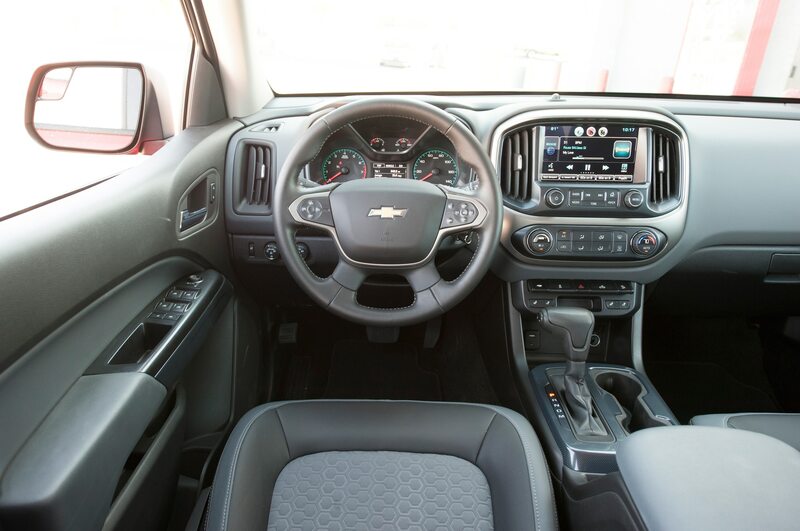 Besides the standard 16-inch alloys, the front clip, taillamps, and interior design, the Canyon distinguishes itself from the Colorado with standard rear wheelhouse liners and LED light accents not available at any price on the Chevy. 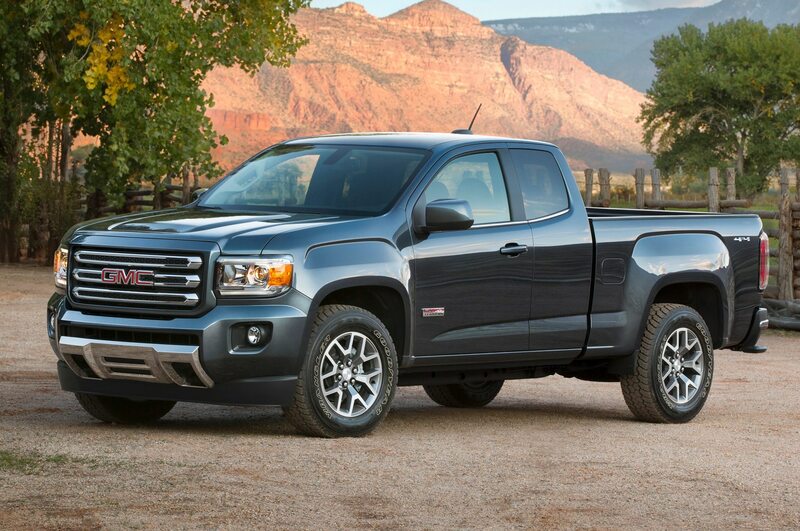 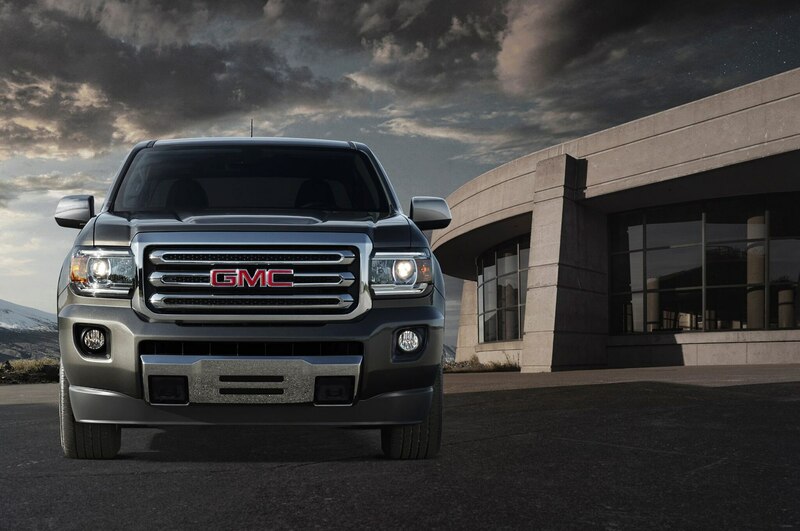 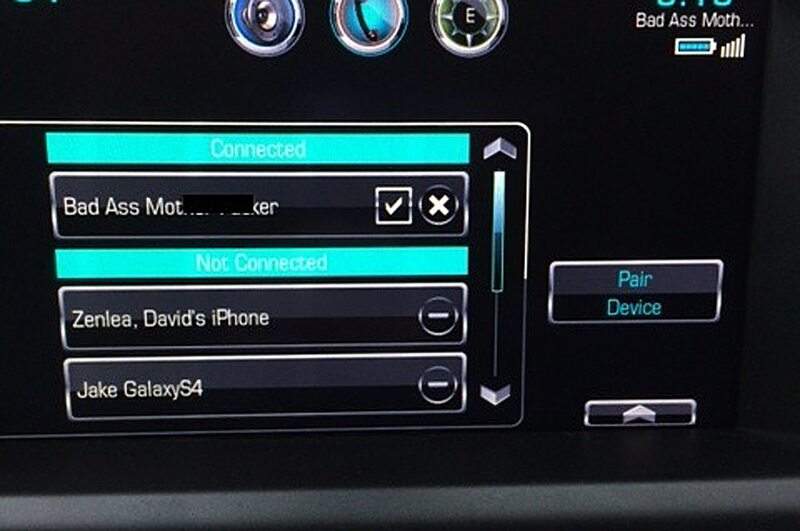 This accounts for the $880 premium you’ll pay for a base GMC. 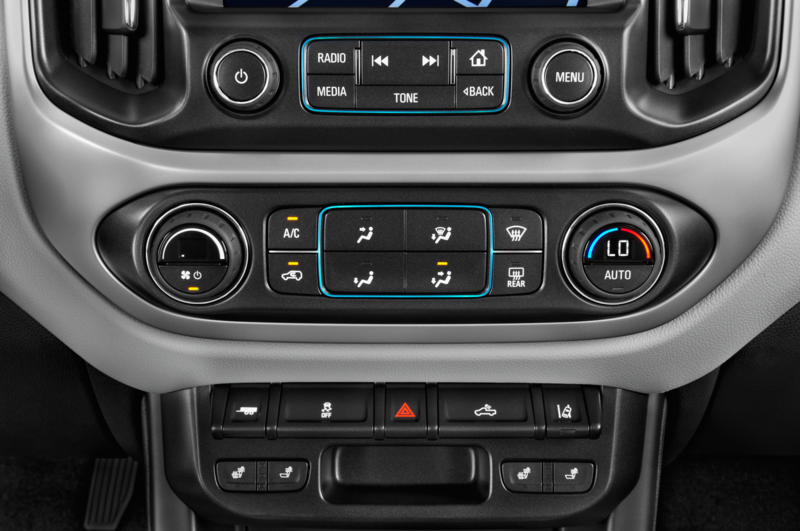 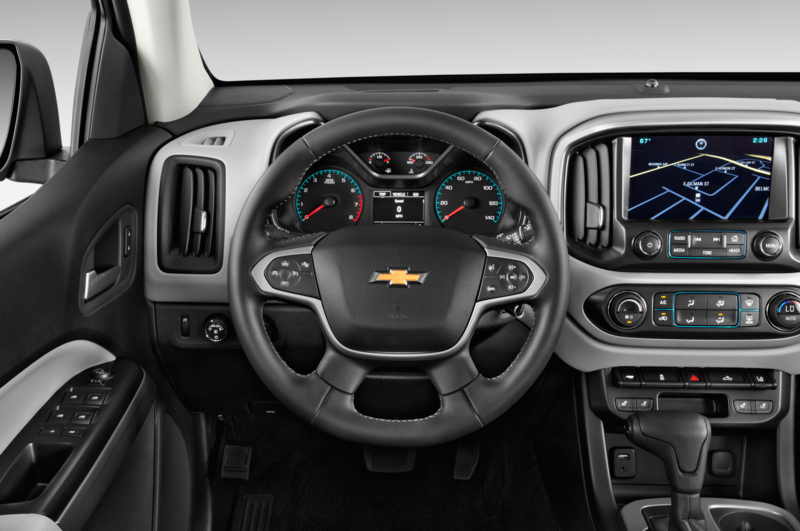 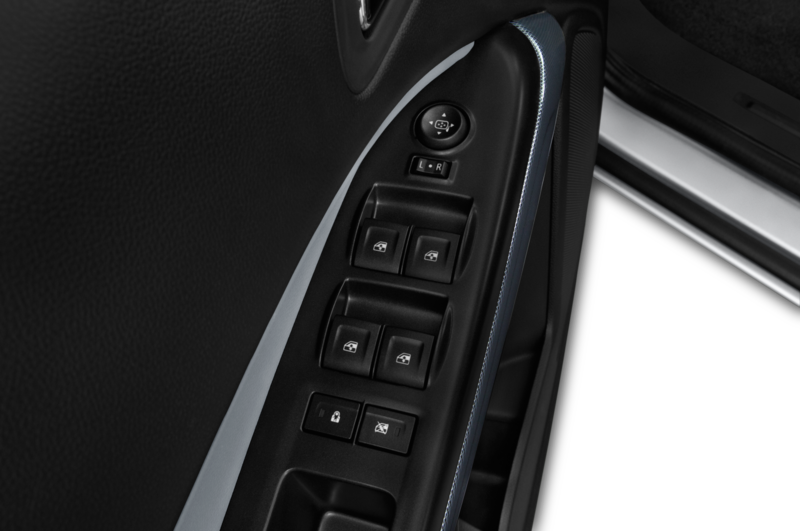 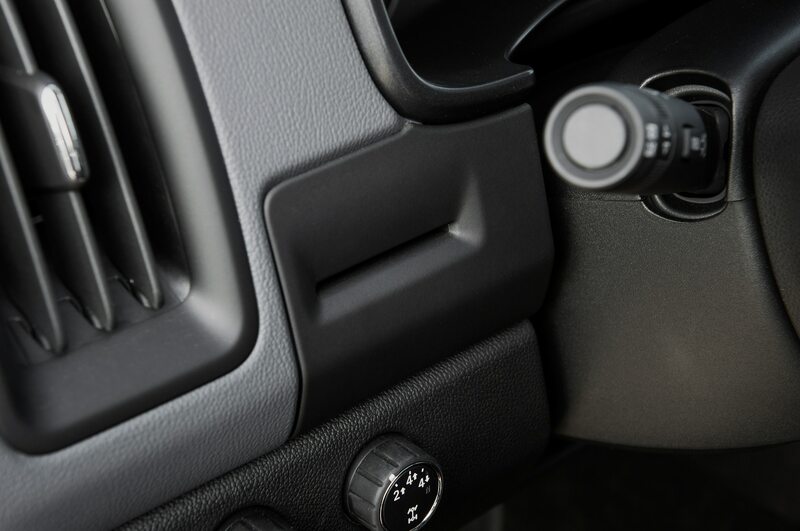 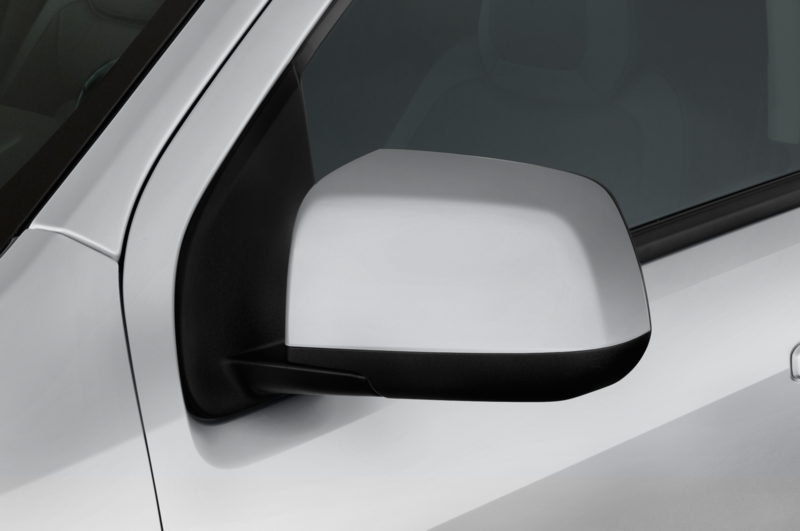 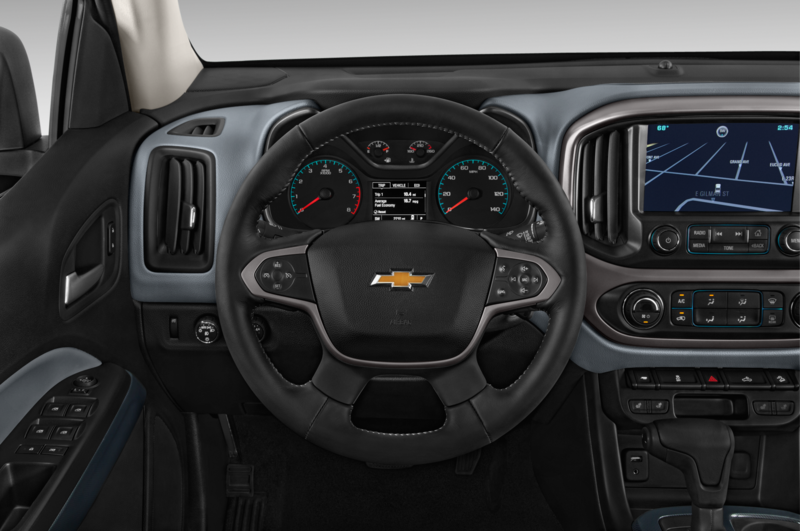 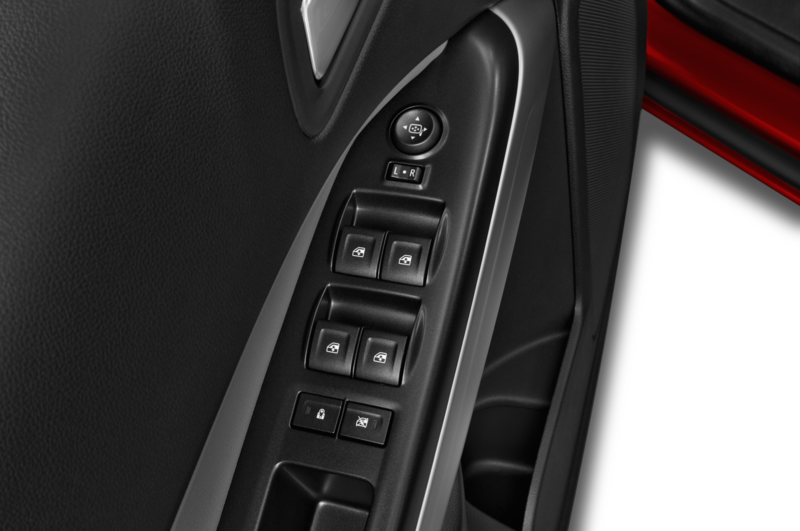 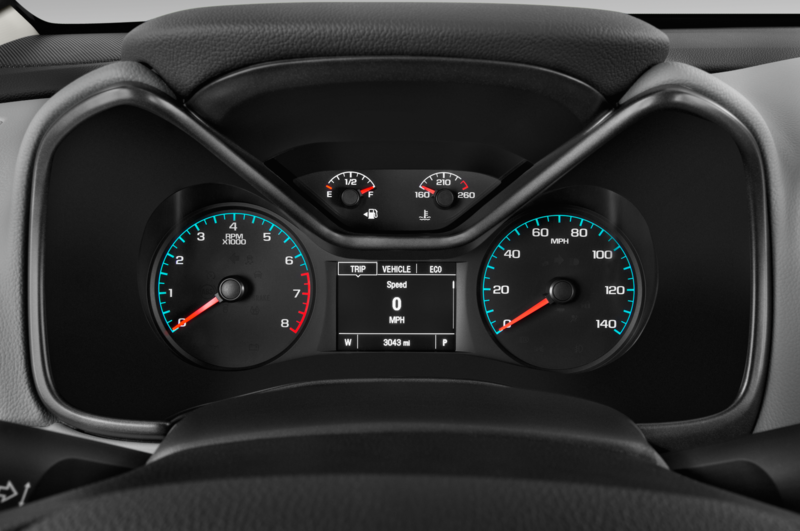 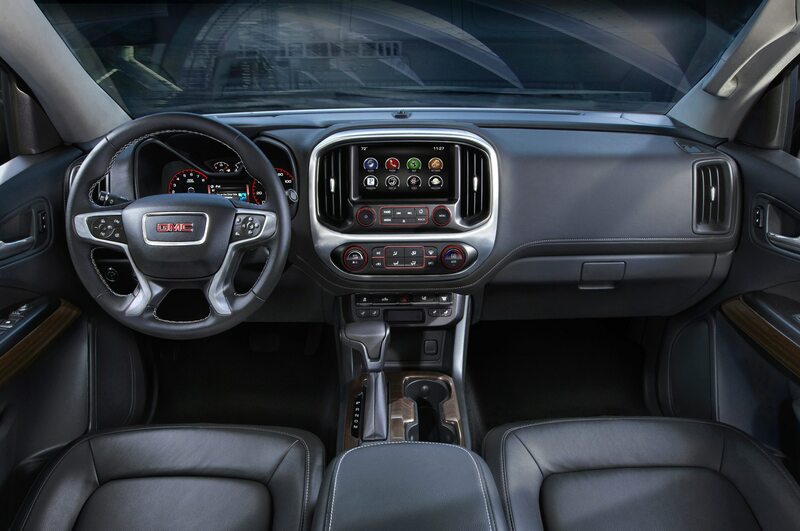 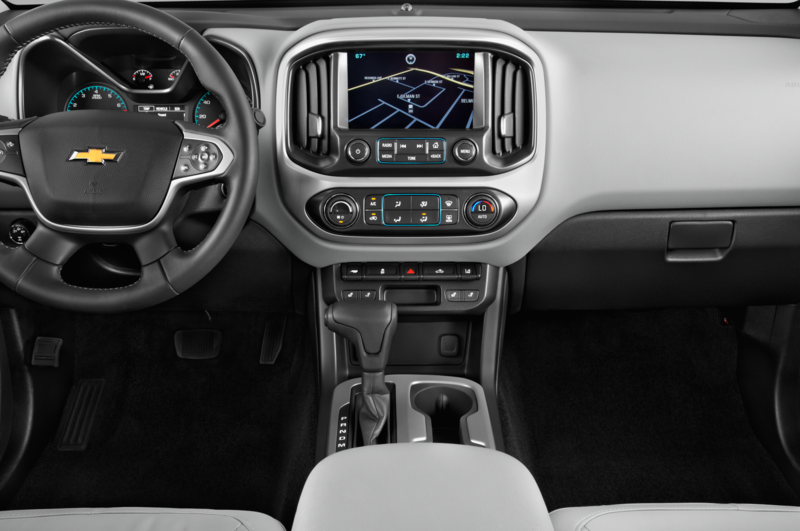 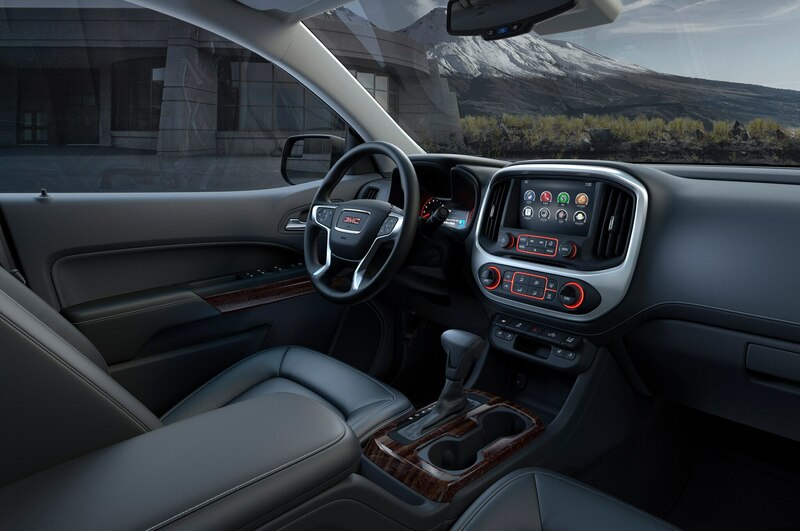 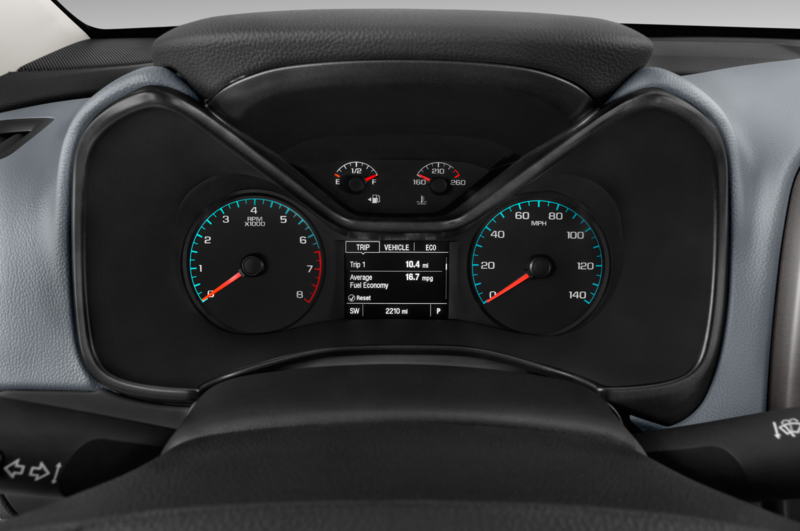 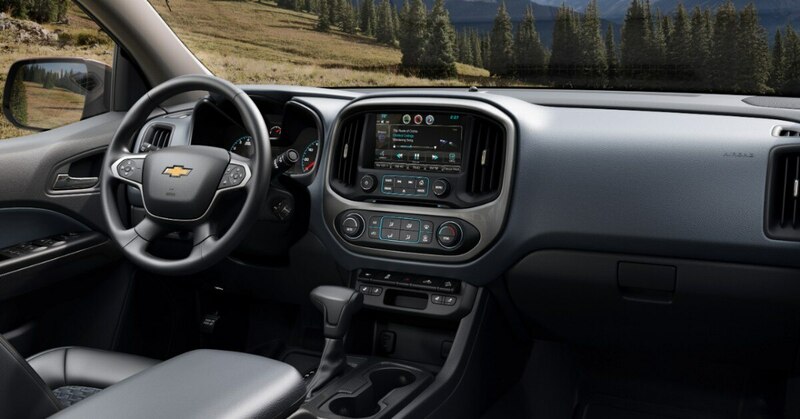 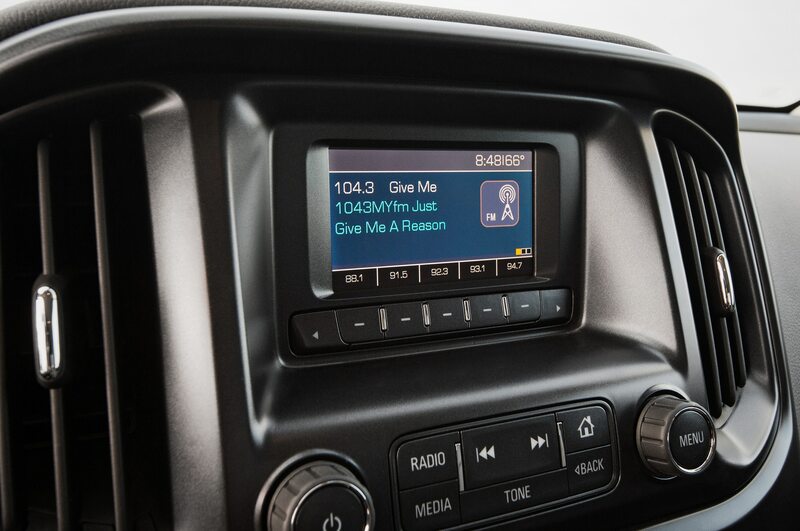 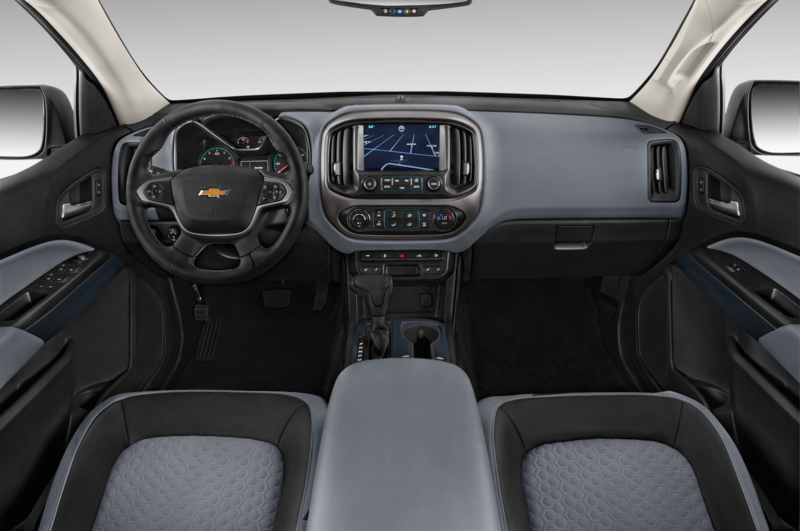 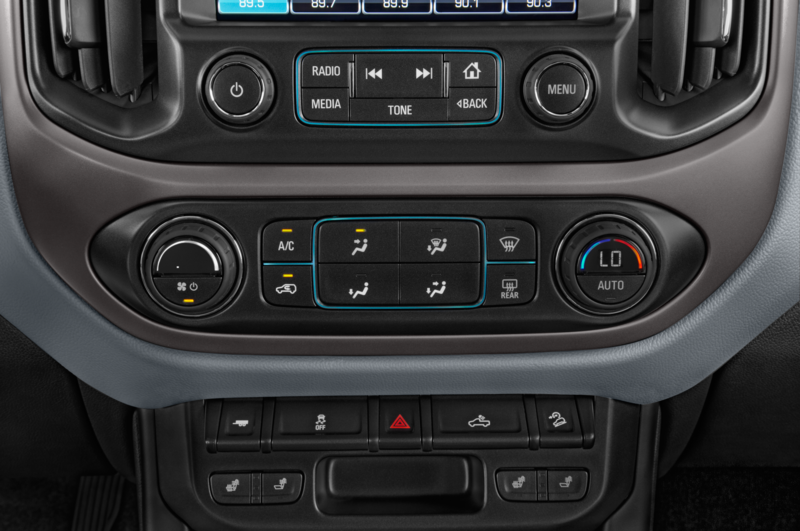 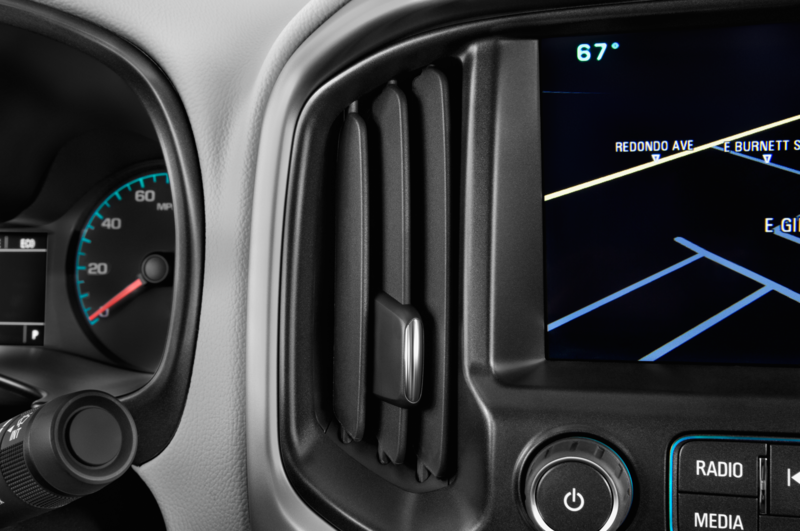 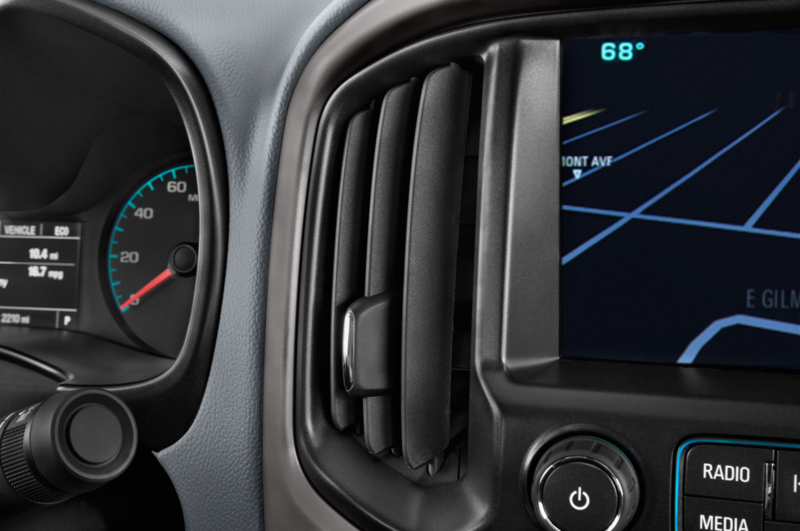 SLE and SLT versions of the Canyon come with real aluminum interior trim, a multi-color driver information center, and soft, stitched instrument panel/dashboard and door panel padding, none of it available in any version of the Colorado. 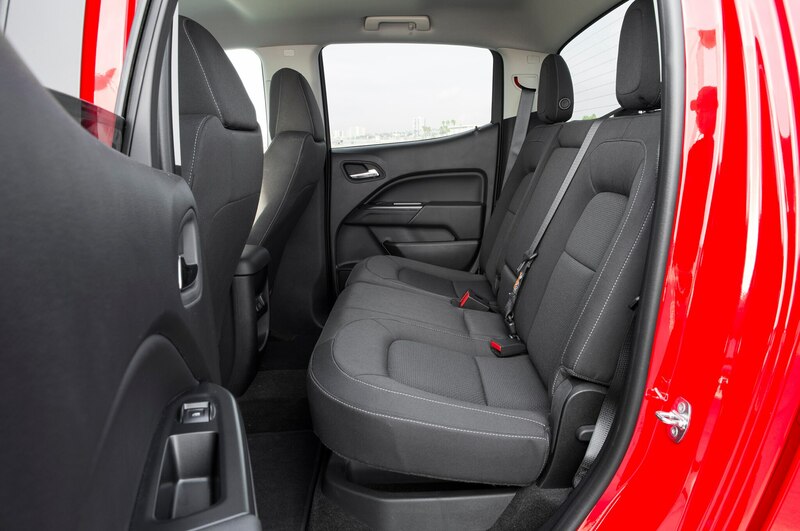 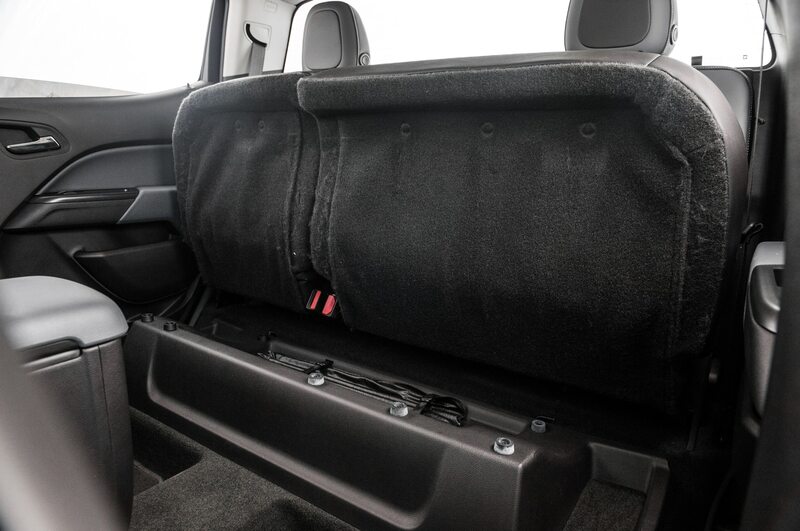 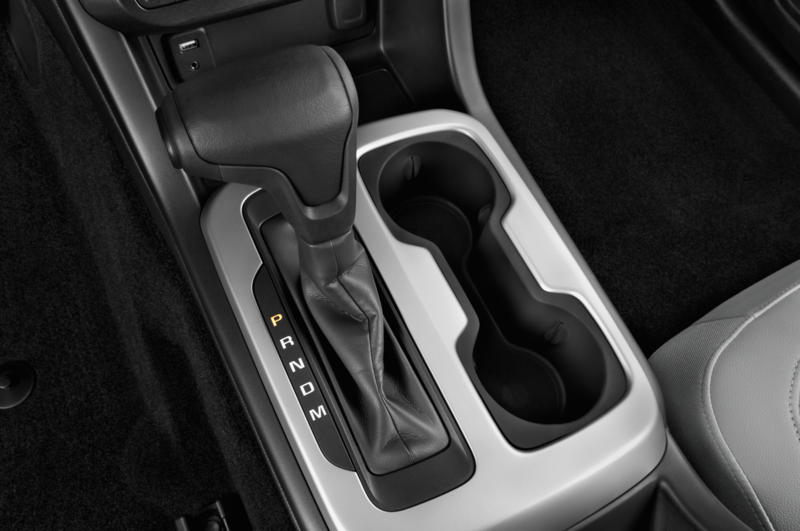 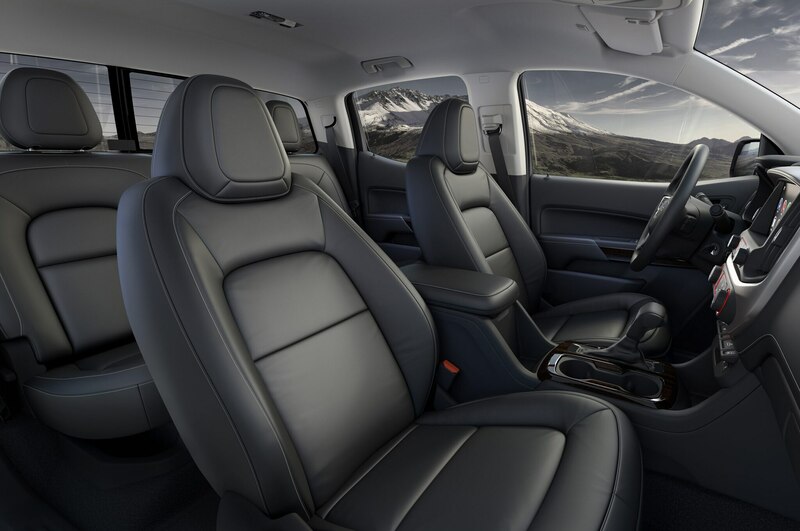 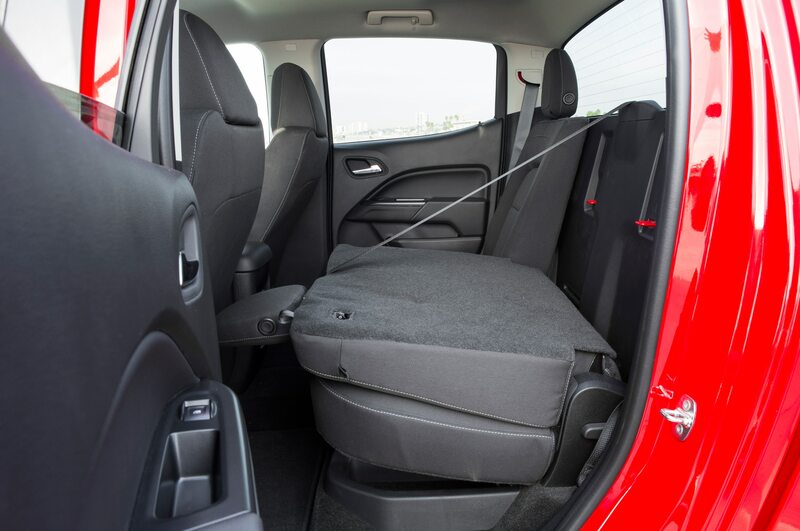 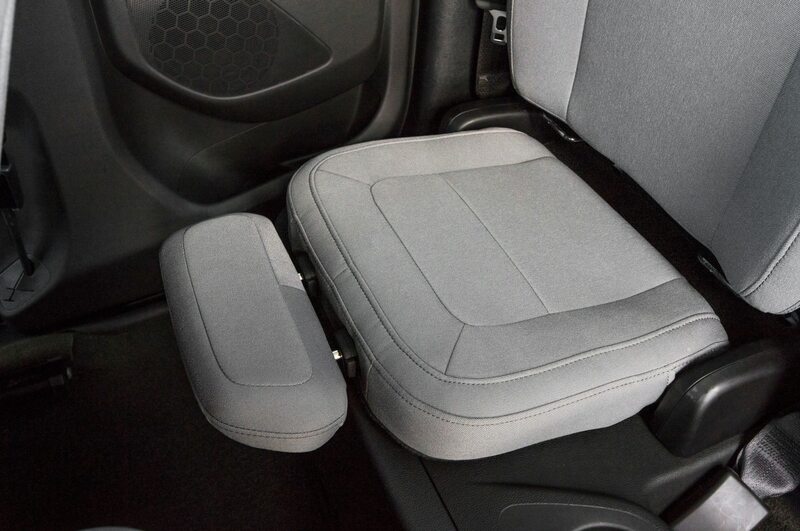 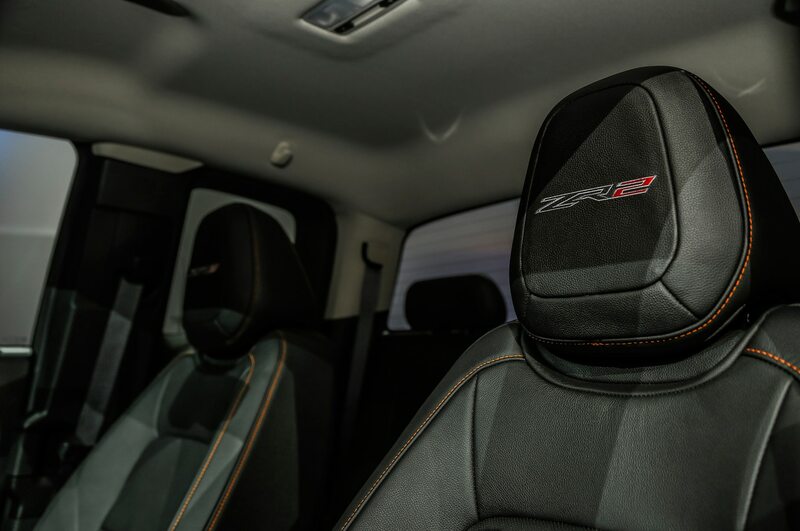 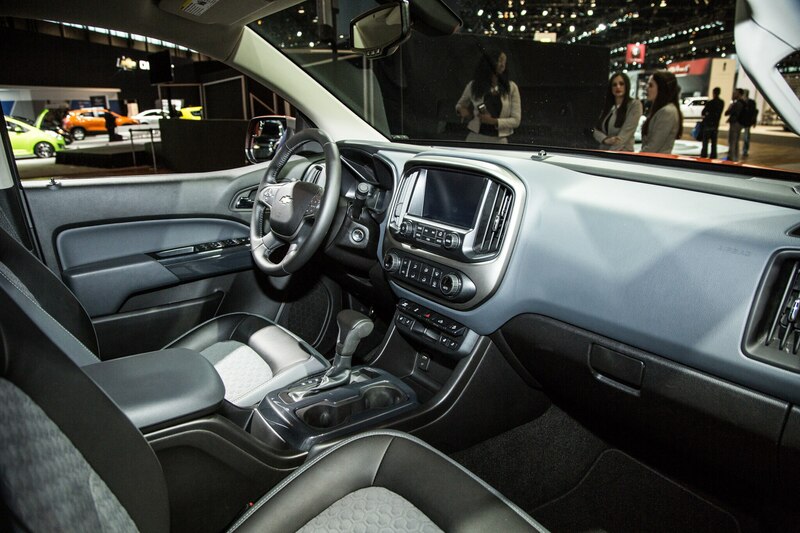 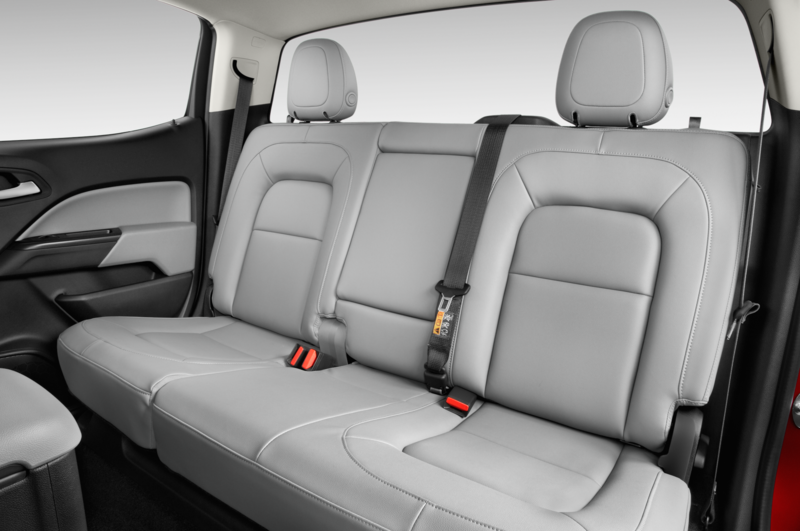 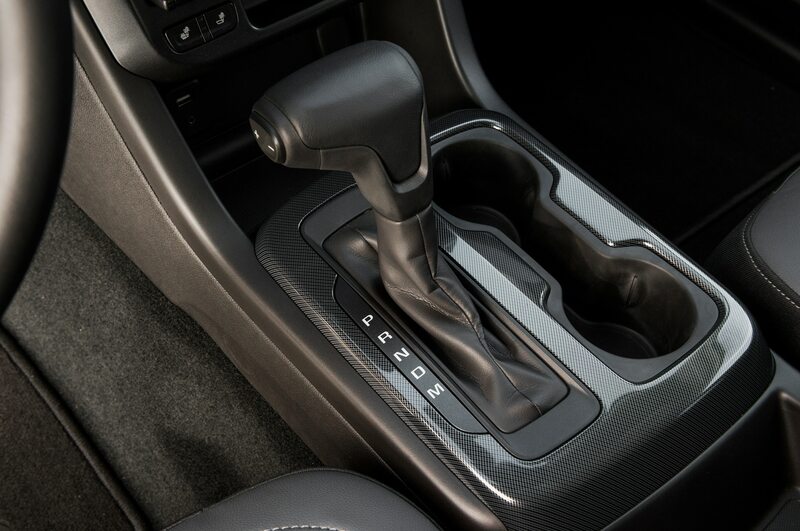 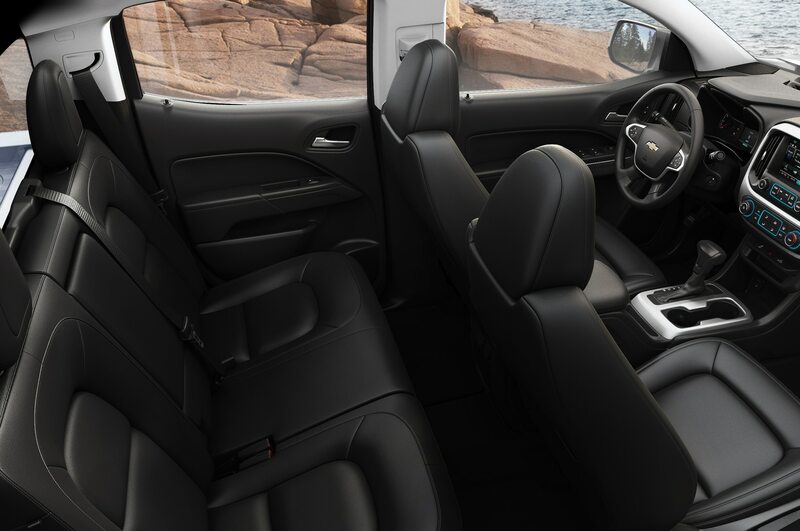 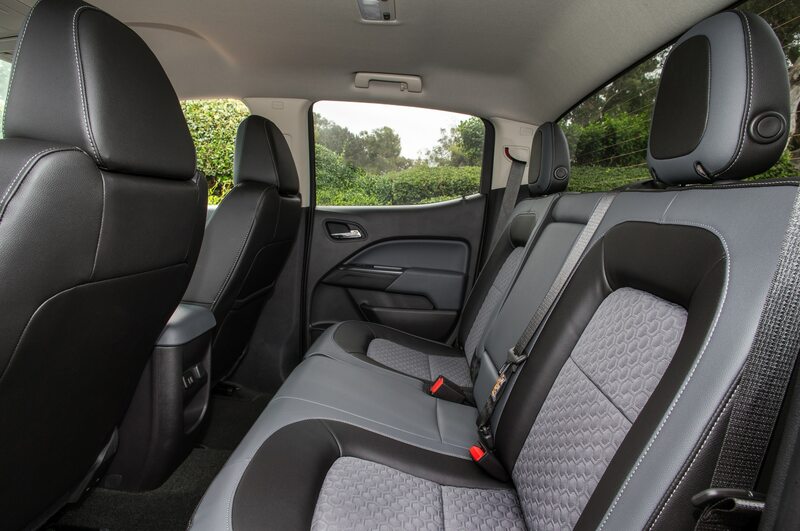 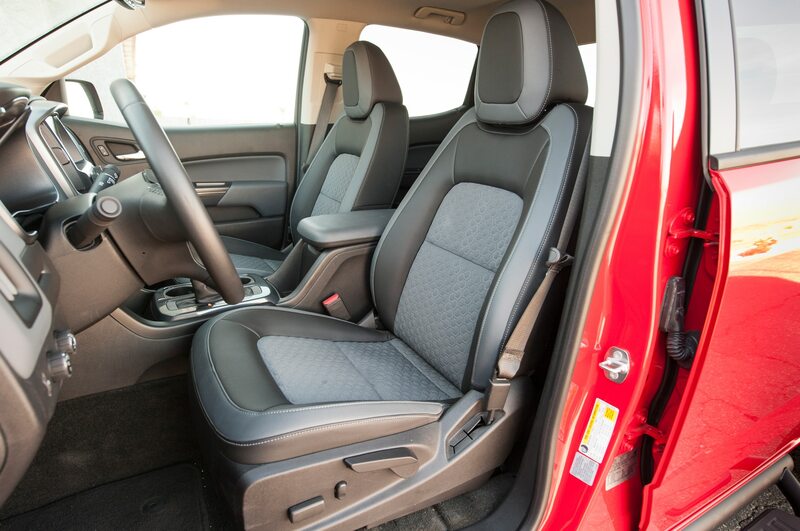 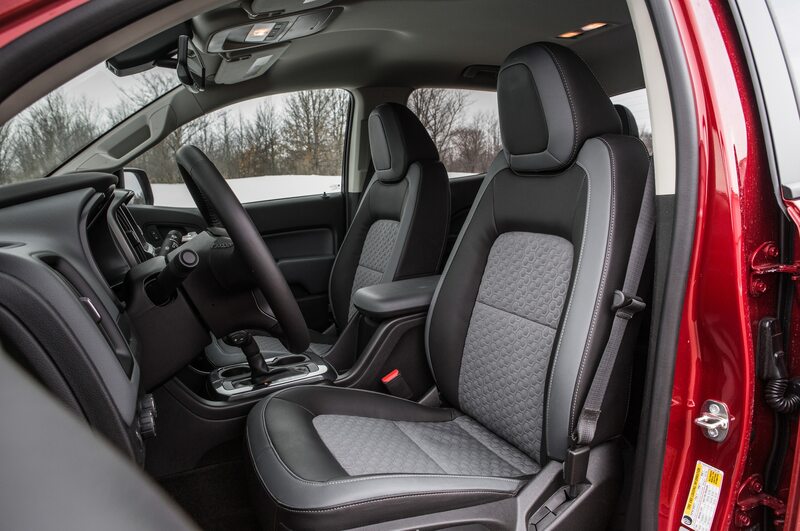 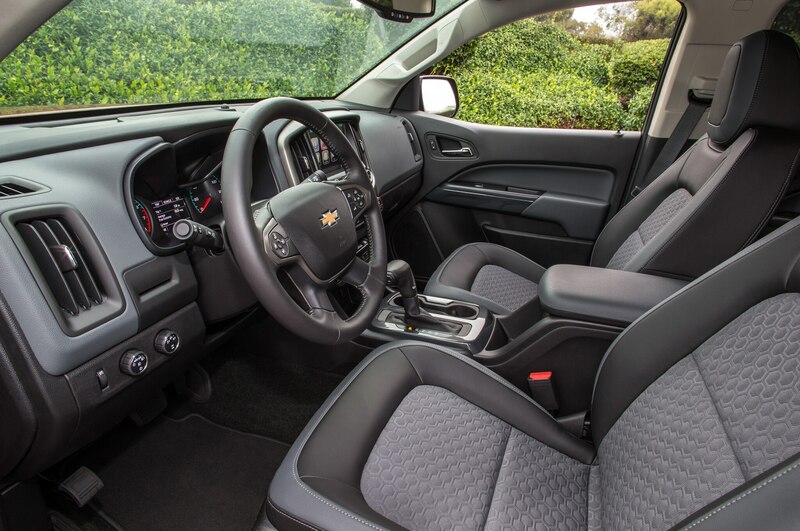 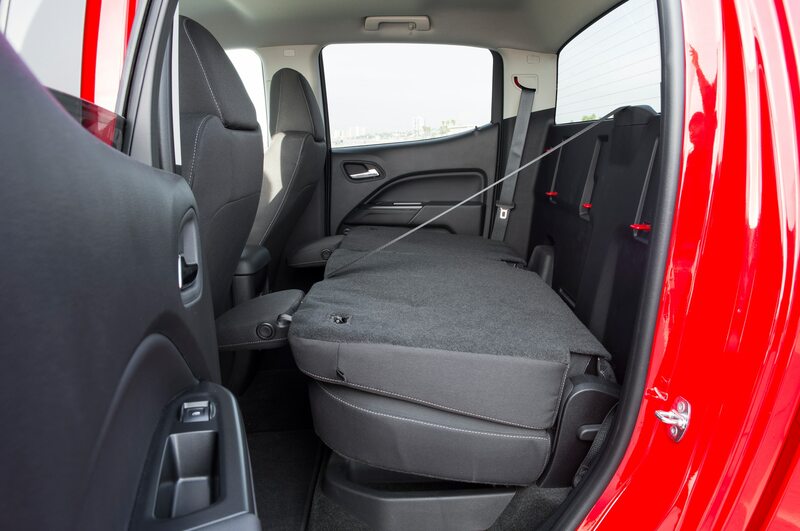 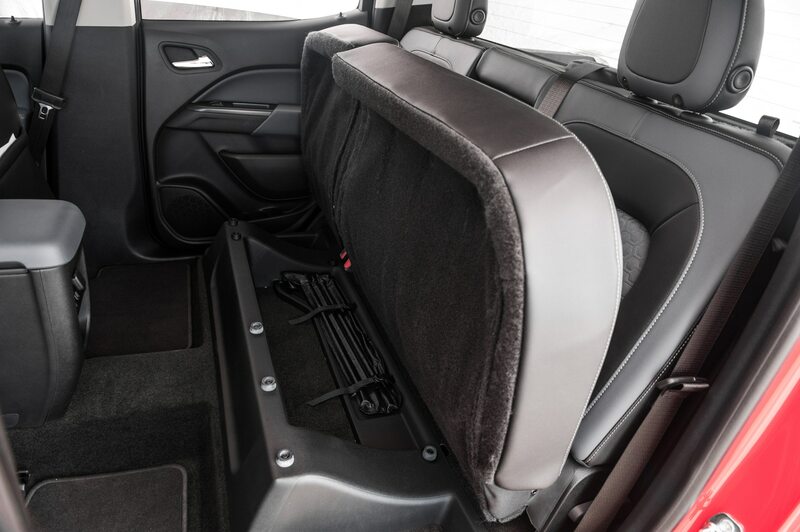 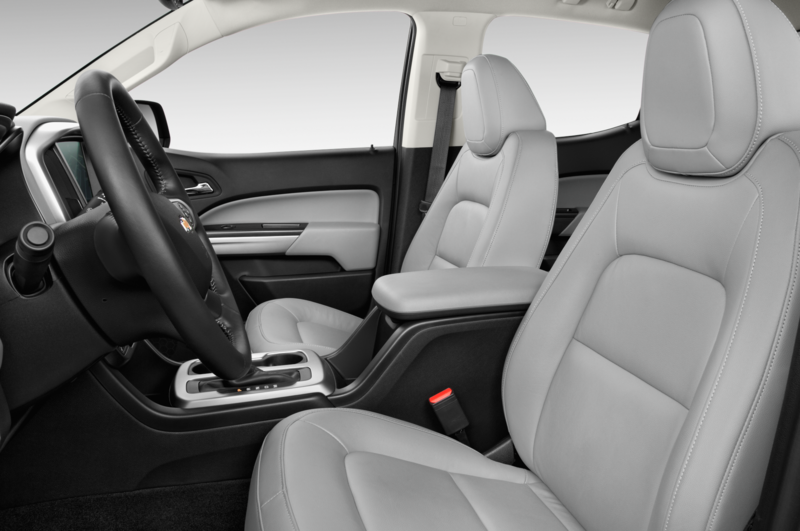 Leather appointed seats are standard on the top-of-the-range GMC Canyon SLT and optional on the Chevy Colorado LT and Z71. 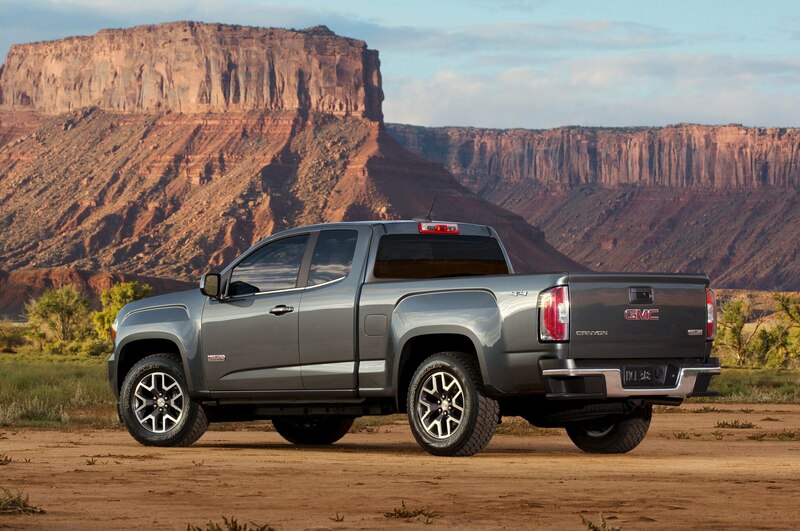 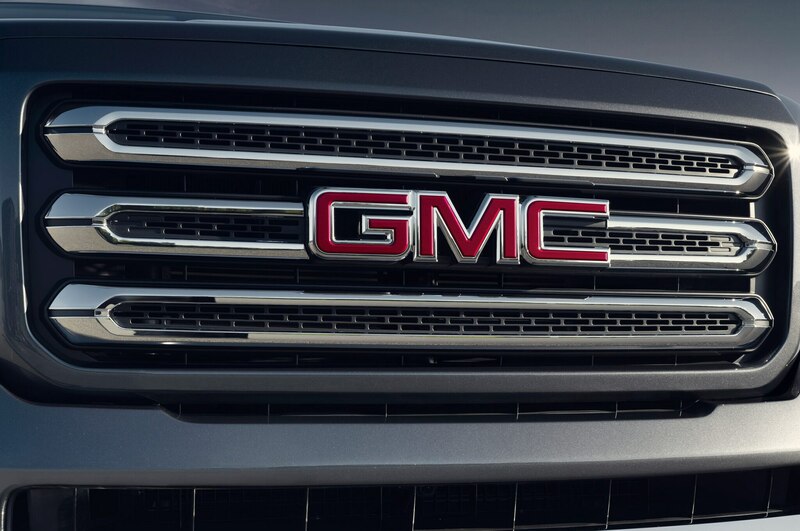 It’s easy to imagine GMC adding a Denali version of the Canyon if the truck has any sales success, though Chevrolet could then counter with a Colorado High Country — perhaps with the 420-hp twin-turbo 3.6. 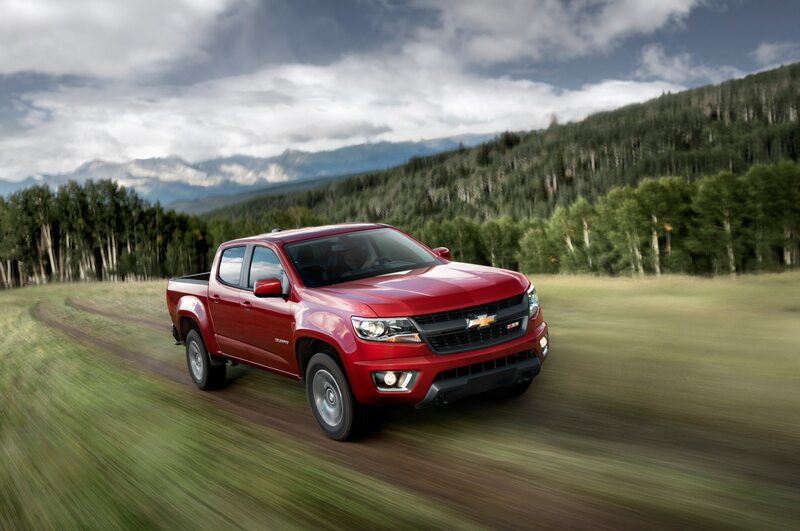 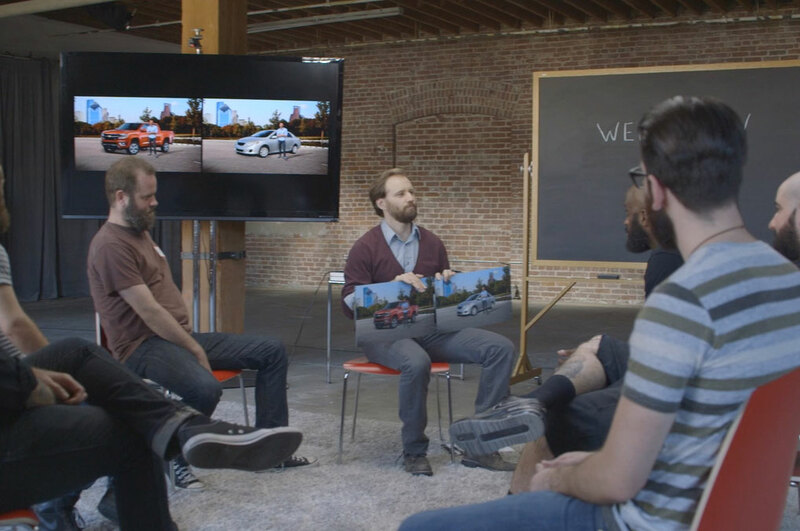 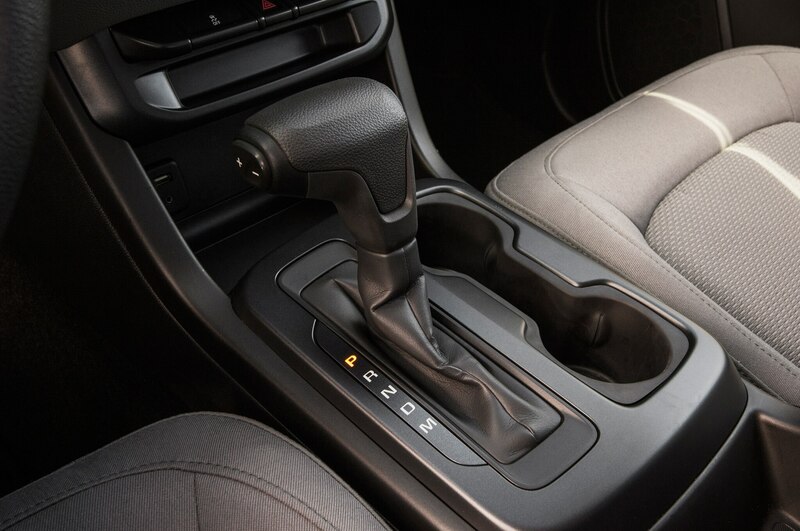 Being car enthusiasts, and since some of us remember when pickups were work trucks with three-on-the-tree manuals, we’re drawn to that base Canyon with the six-speed stick, a gearbox available only with the 2.5L four-cylinder engine, and any other configuration so long as it doesn’t have the longer, 8-foot box or four-wheel drive. 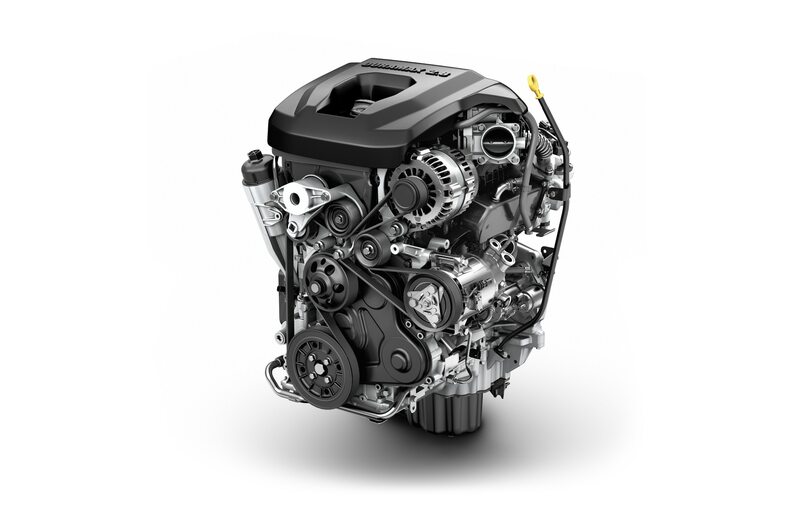 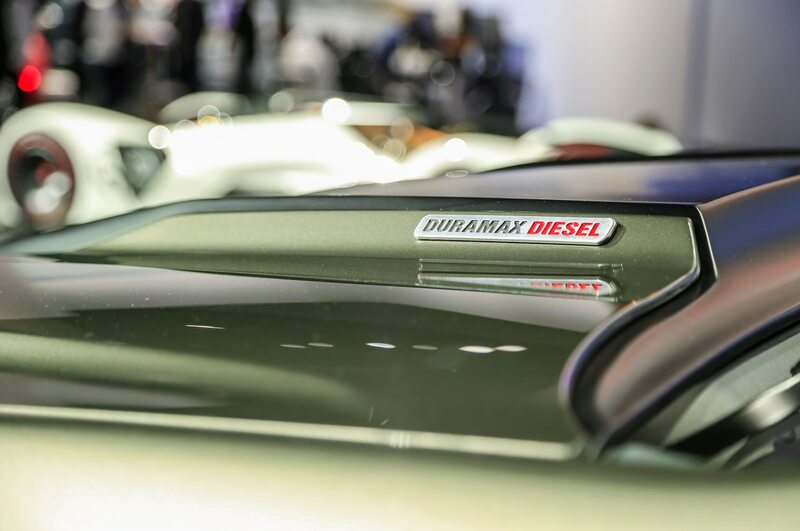 The four-banger suffers from typical diesel-like direct injection start-up and lacks the NVH qualities of the V-6 at idle, though it has more than adequate power for most drivers. 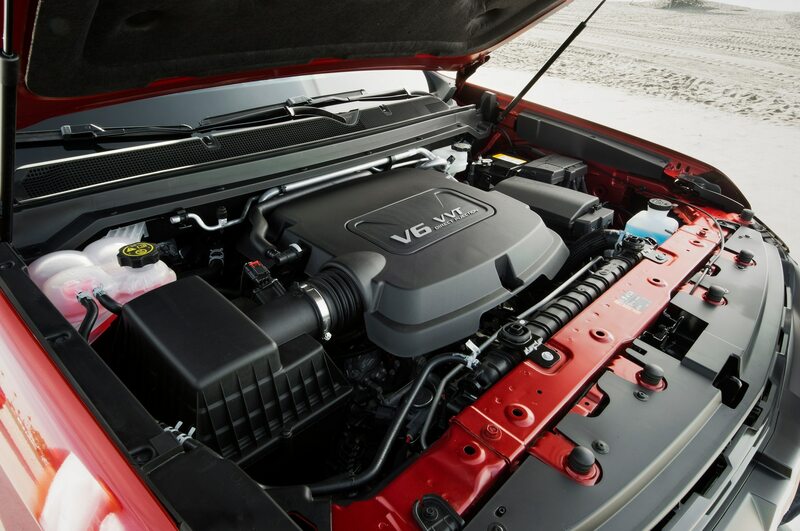 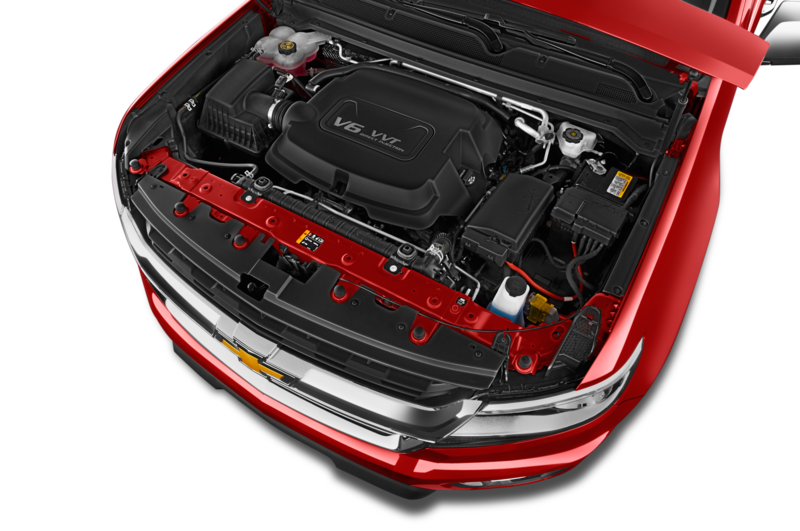 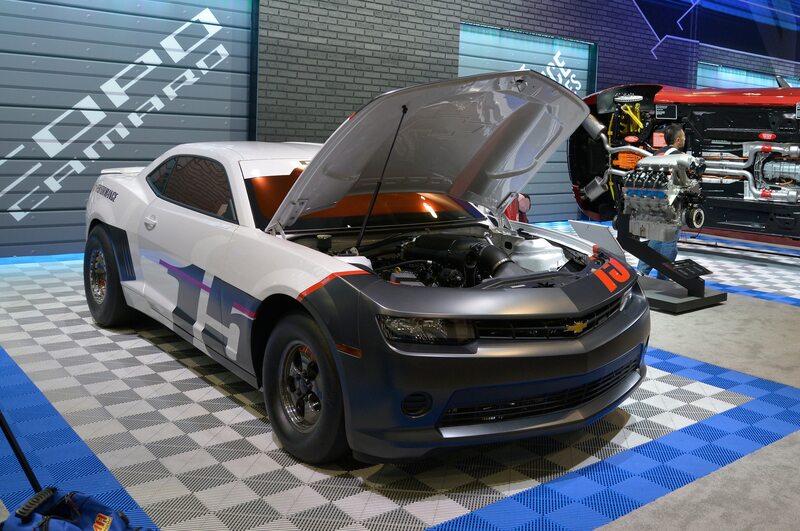 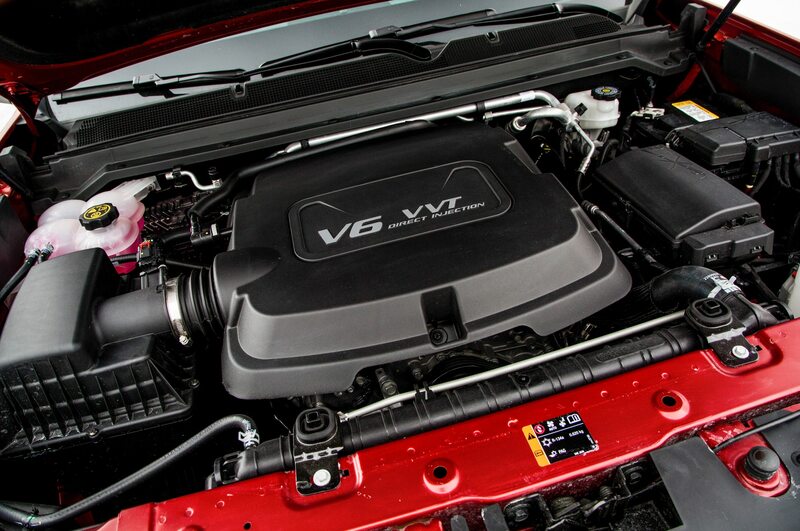 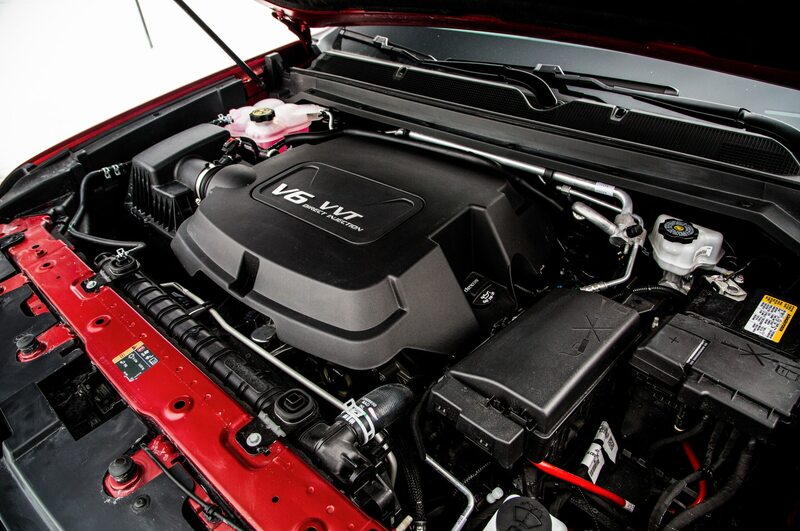 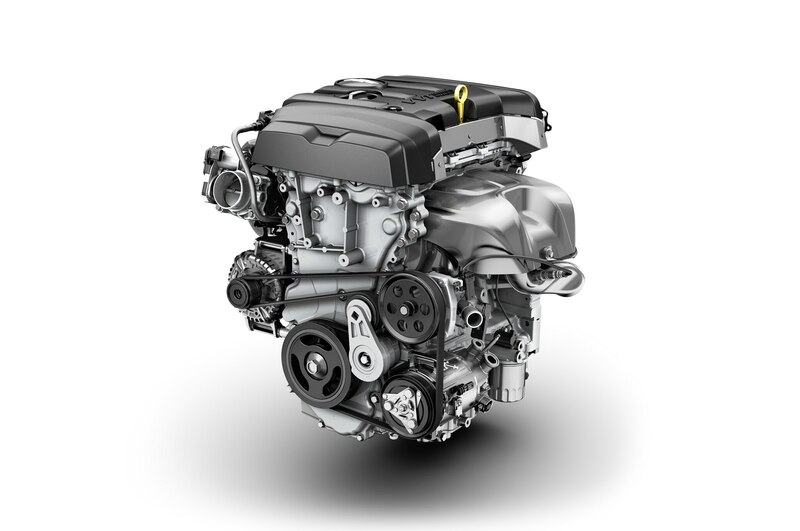 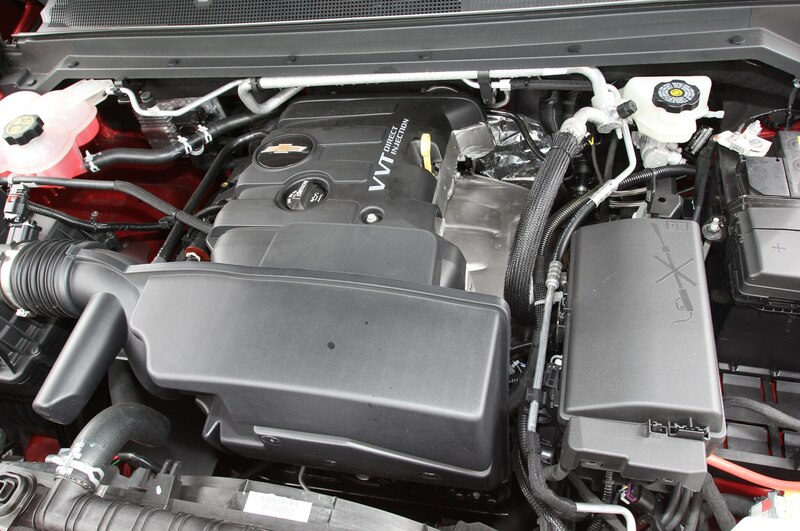 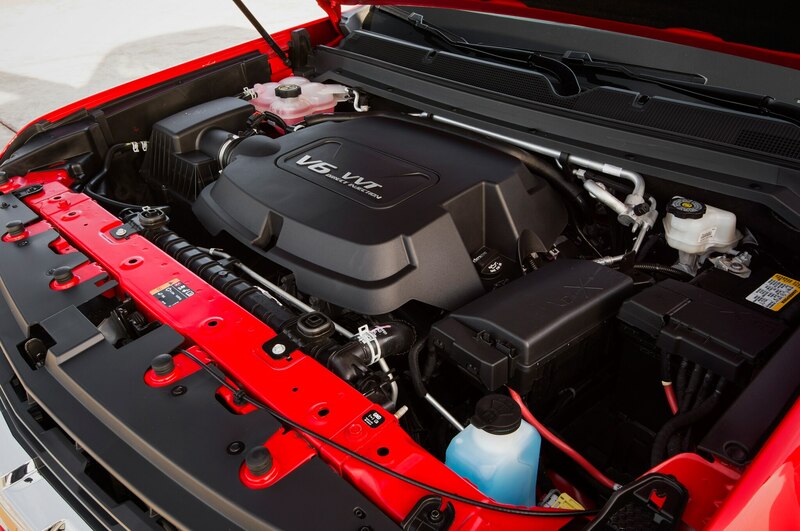 The 3.6L V-6 is lively, though not quite a substitute for a torquey small-block V-8. 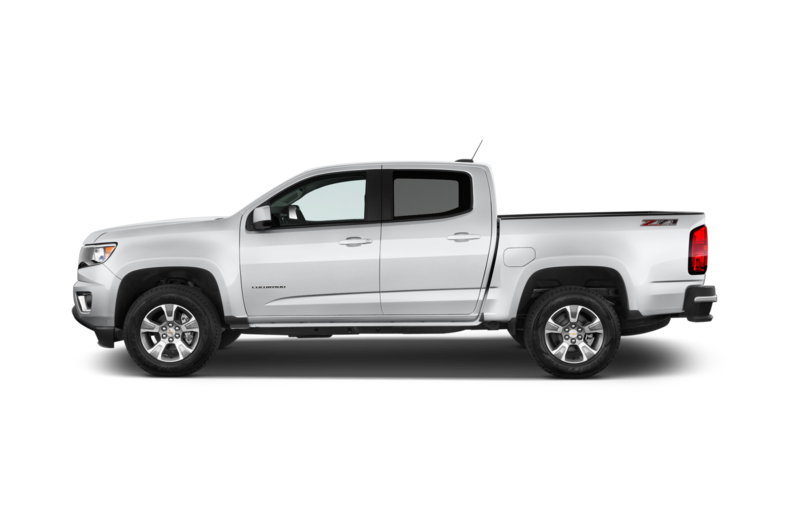 In comparison to the Toyota Tacoma and Nissan Frontier, however, well, there is no comparison — the Chevy Colorado and GMC Canyon are far superior. 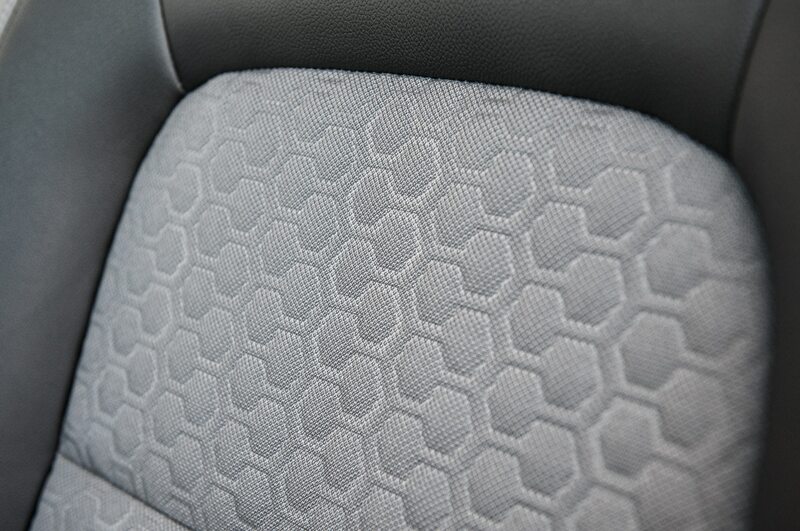 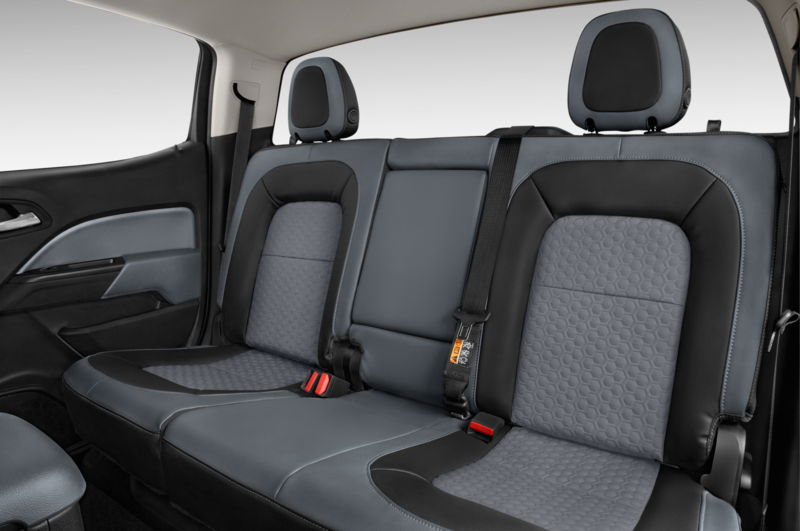 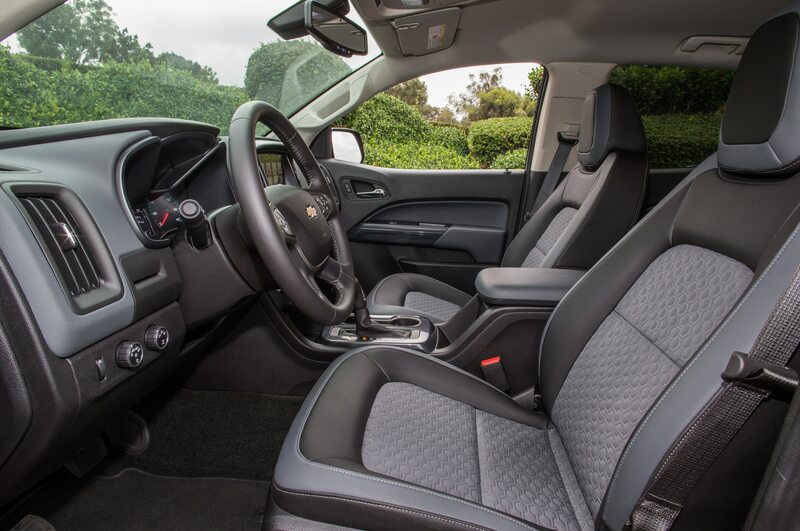 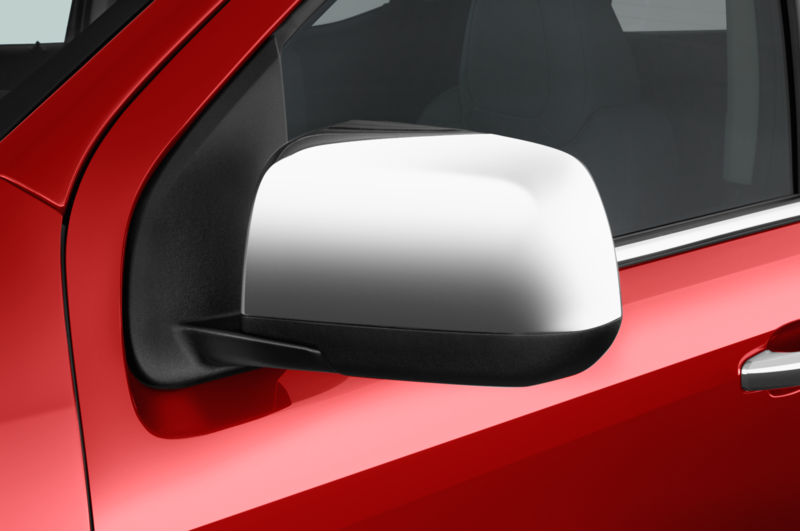 Preproduction interiors indicate a big leap in materials and plushness, especially in high-spec GMCs with extra padding and real stitching on the dash. 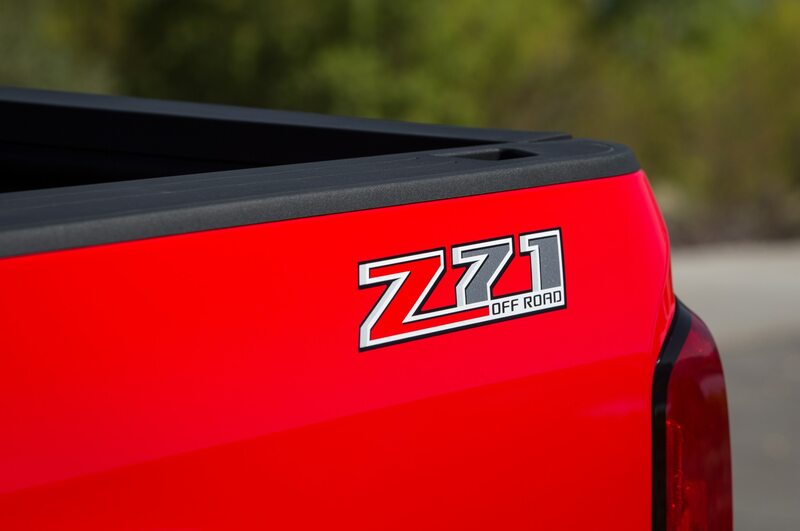 It should appeal to the average Ford F-150 King Ranch or Ram Laredo buyer, but what do we know? 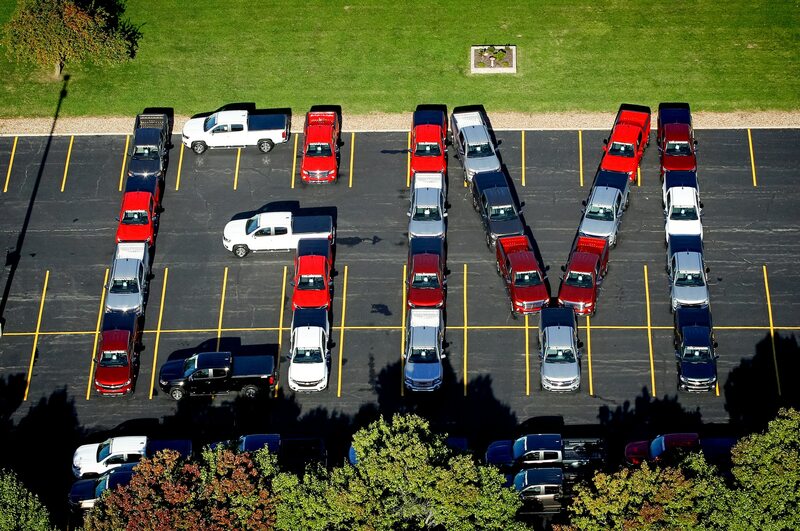 We like cars. 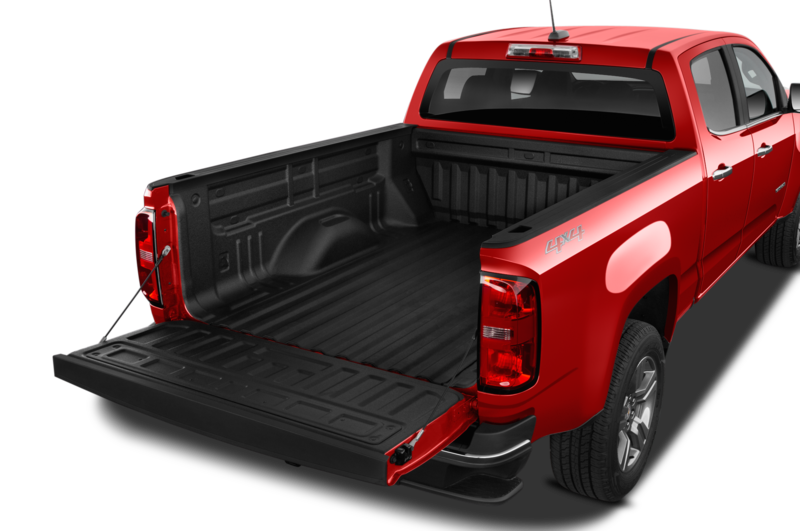 Midsize and compact pickups didn’t make sense a few years ago, when the full-size pickups didn’t sticker for much more, and the smaller trucks didn’t get much better fuel mileage. 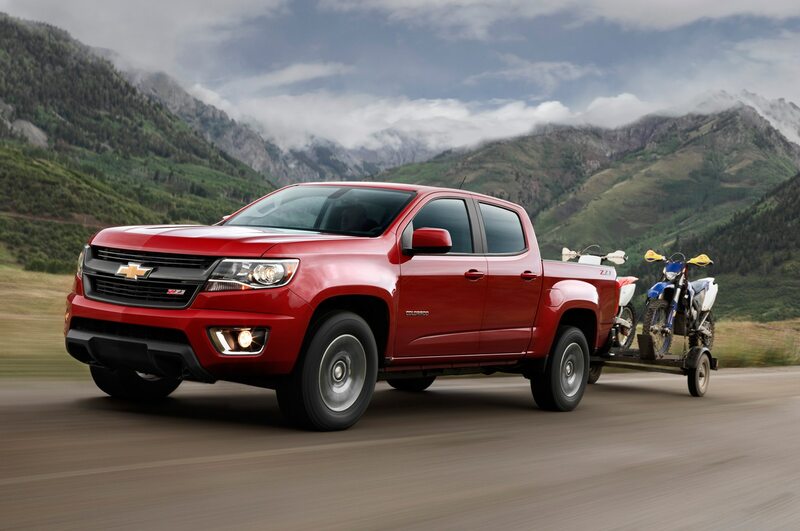 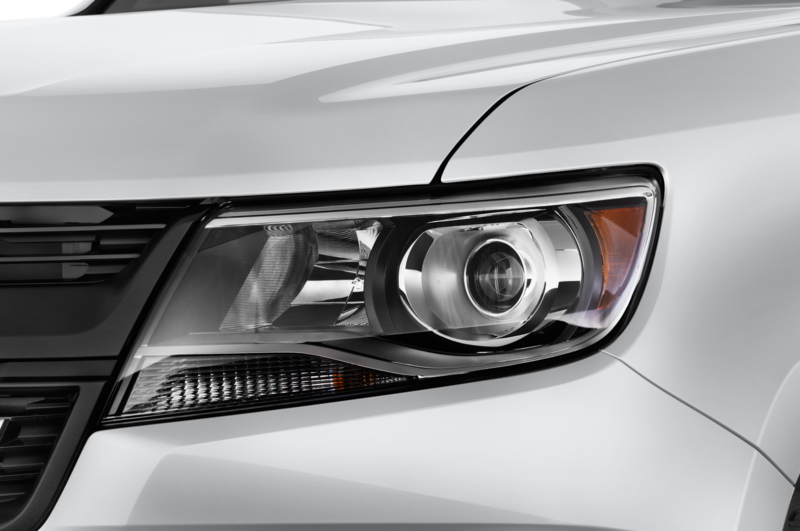 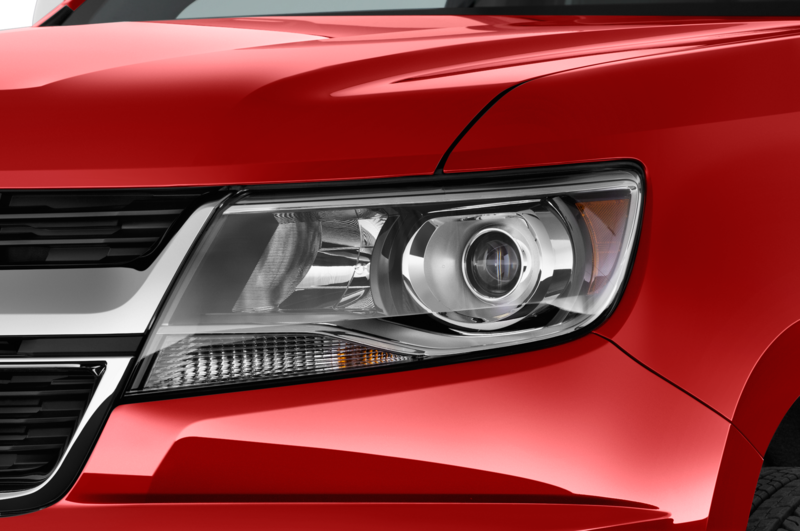 Now, the full-size trucks cost almost $10K more than the new Chevy Colorado and GMC Canyon, and the Detroit Three have been crowing that transaction prices are up; $40,000 is common, and there are plenty of suburban cowboy models breaching $50K. 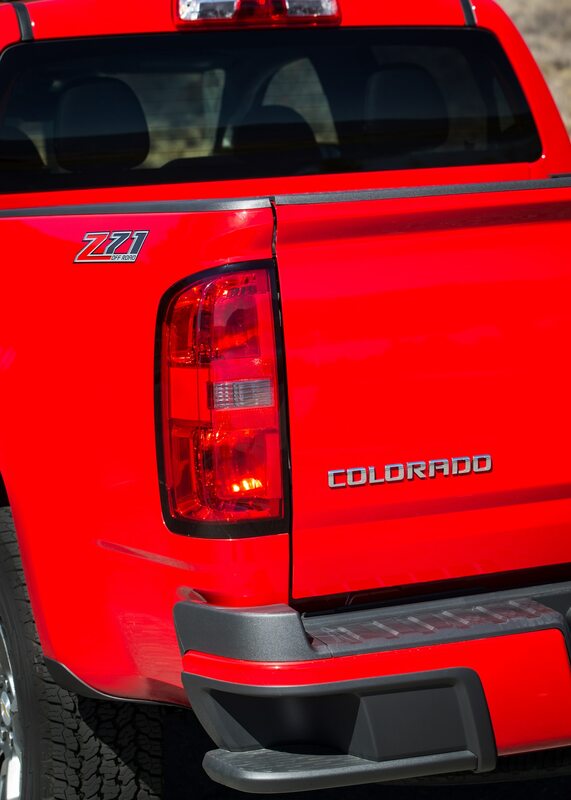 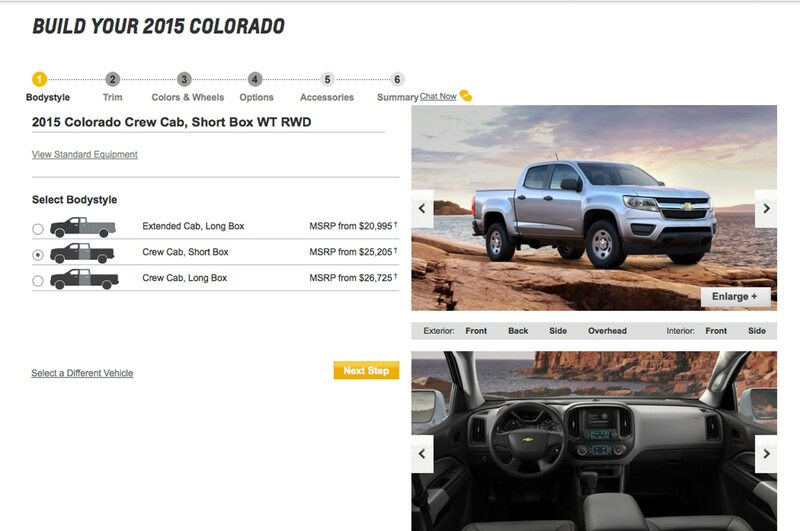 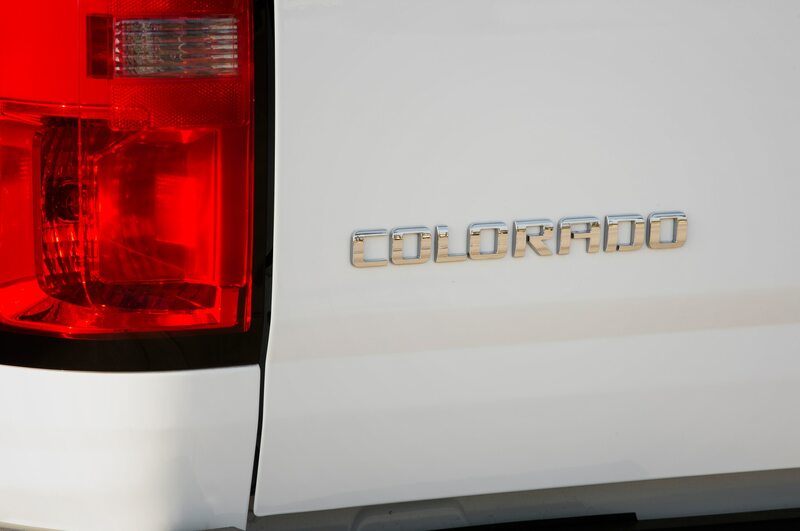 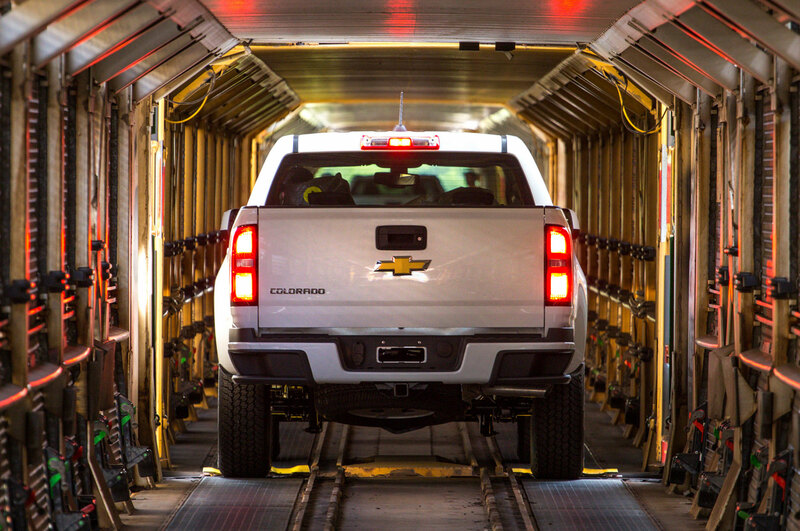 Though we’re skeptical that the Colorado and Canyon can sell more than a mid-five-figure annual number, combined, they’re launching at a moment in which consumers who need trucks will find great value in them — perhaps even those running small businesses and construction fleets.